The history of Earl Bales Park starts with the John Bales House. 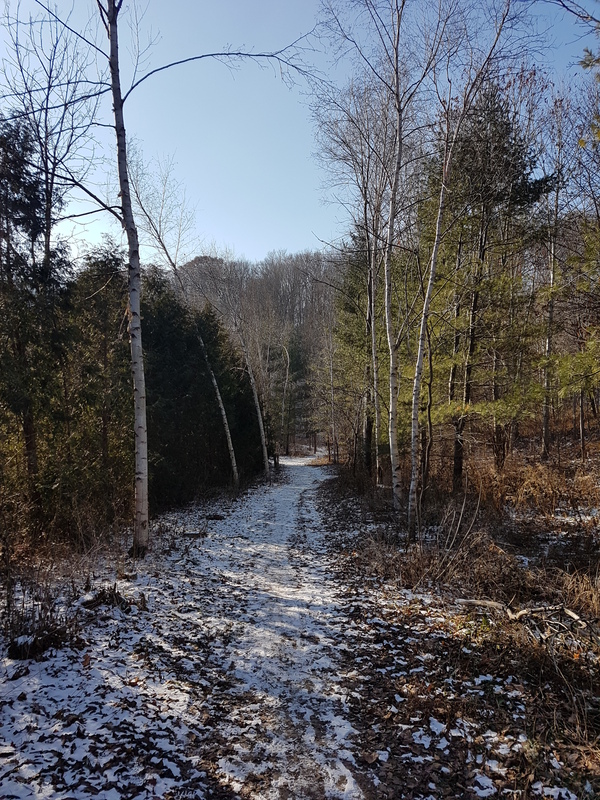 The family arrived in the Bathurst and Sheppard area in 1824, finding a hilly topography bordering on the West Don River. John Bales cleared the land and built a log farmhouse south of Sheppard and east of Bathurst. From there, the layers of story build. 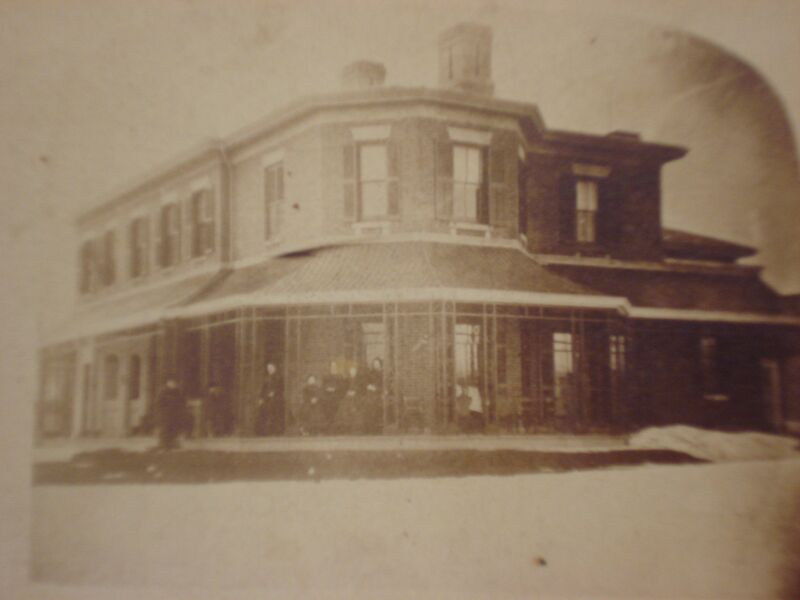 Bales House, south-east view, date unknown. From North York Historical Society. Credit: Toronto Public Library. 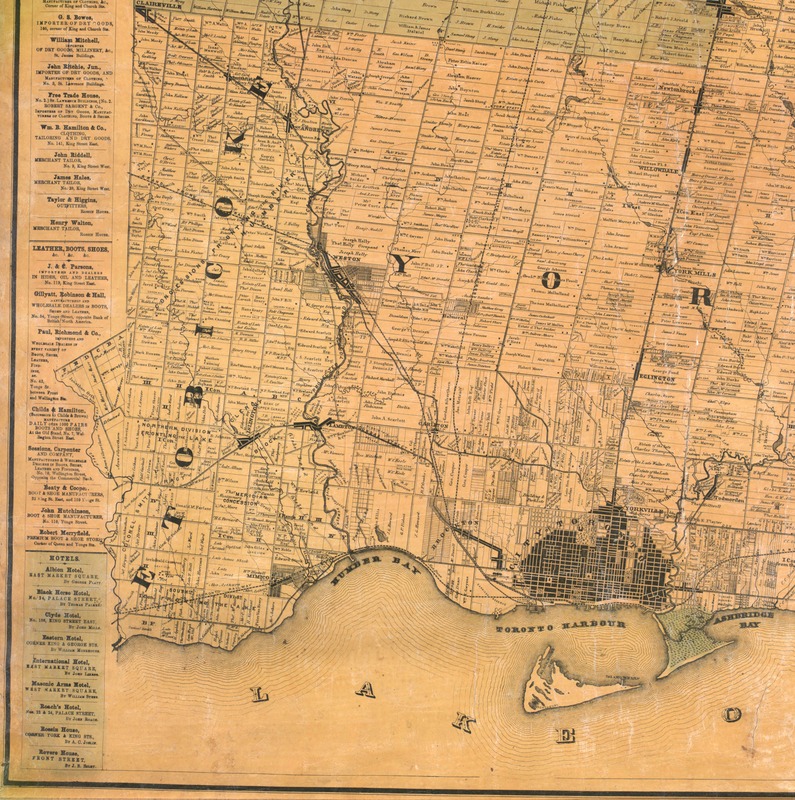 Tremaine’s Map of the County of York, Canada West, 1860. Credit: Historical Maps of Toronto. Steps from the John Bales House is the Earl Bales Community Centre. The meeting place for classes and events came to us by 1981 (a revitalization project took place in 2018 too). 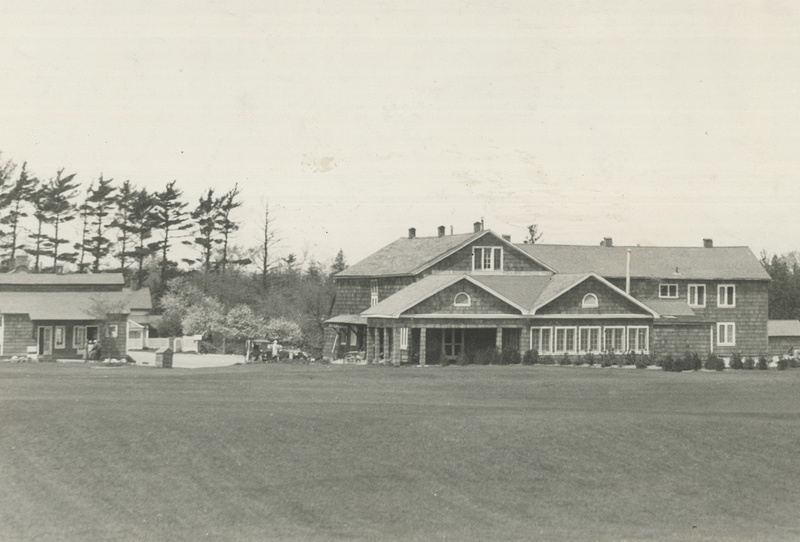 Before its arrival, another complex of buildings were neighbours to the John Bales House: The York Downs Golf and Country Club. York Downs Golf and Country Club near Armour Heights, North Toronto, 1926. Credit: Toronto Public Library. 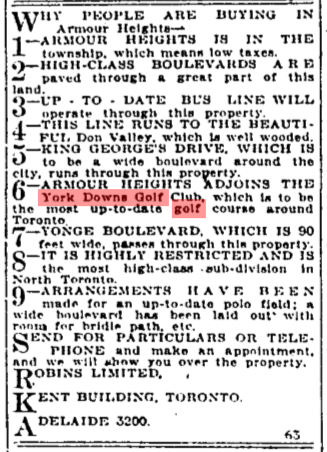 In 1922, the York Downs Golf Course opened on the former Bales land (albeit by then property passed into the hands of Shedden Company). The John Bales homestead was actually the residence of the groundskeeper and the barn was part of the clubhouse. 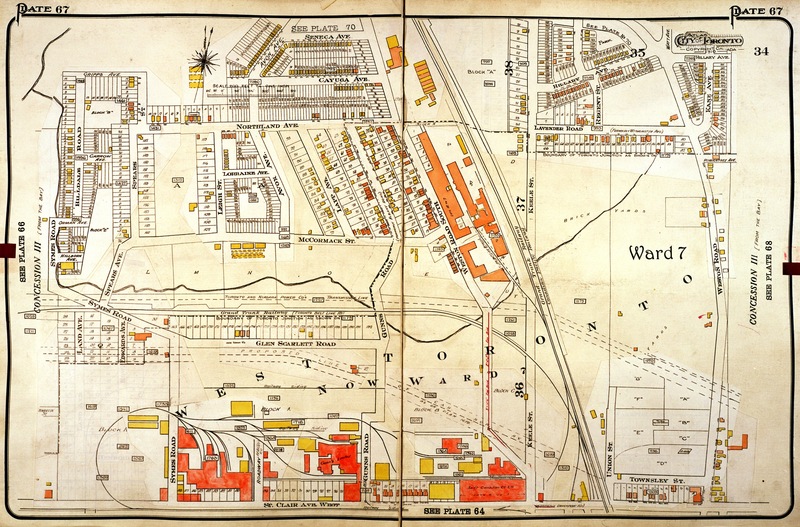 Map of the Townships, York, Scarboro, and Etobicoke, 1916. Credit: University of Toronto Map and Data Library. York Downs Golf and Country Club, 1953. Credit: City of Toronto Archives. Ownership map for the region formerly known as the Township of York including York, North York, East York, Forest Hill, Swansea, 1932. Credit: City of Toronto Archives. In 1968, the club’s executive voted to move to Unionville and to sell the property to Max Tanenbaum of Pinetree Developments for $6,400,000. Tanenbaum intended to build apartments and houses on the former course. After much debate, local protests under the banner of ‘Save York Downs’ stopped the proposal. 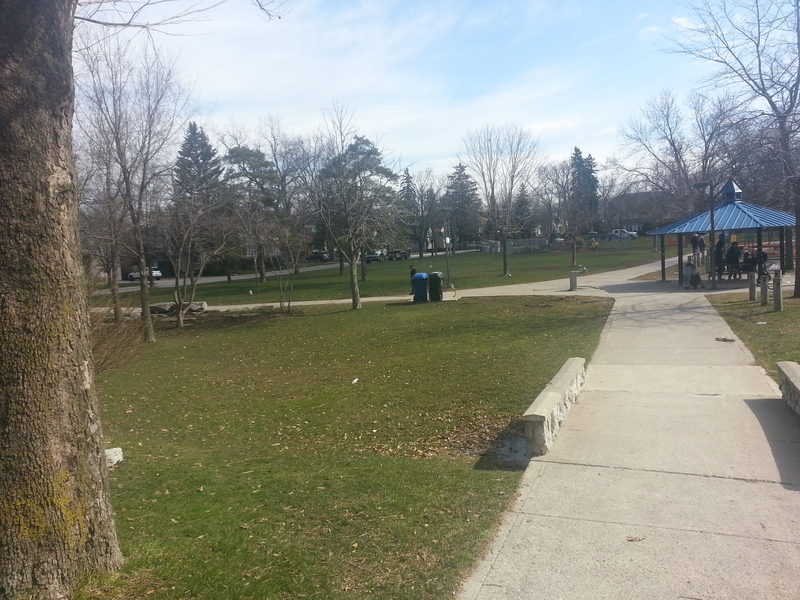 Ultimately, Metro Toronto Council purchased the property in 1972 for $9 million to use for parkland. 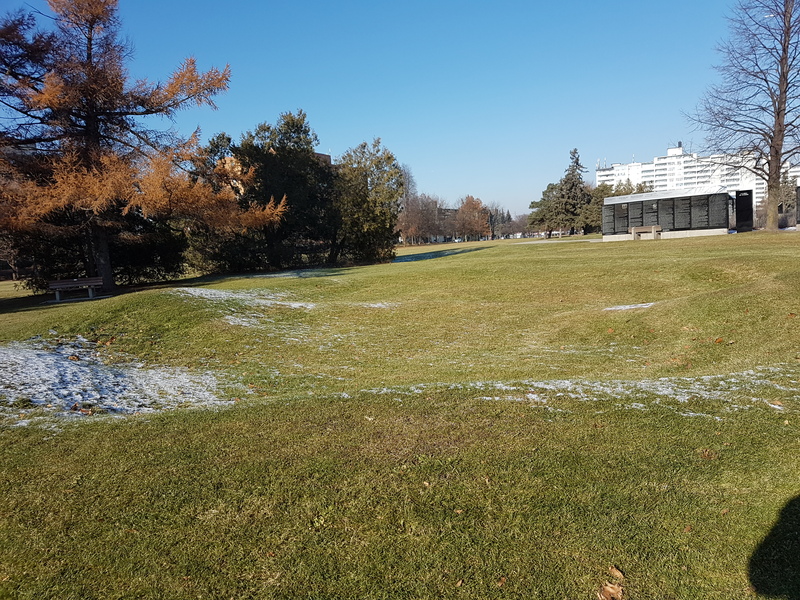 Council also did the same with the Tam O’Shanter Golf and Country Club in Scarborough, although that ultimately became mostly a municipally owned golf course. 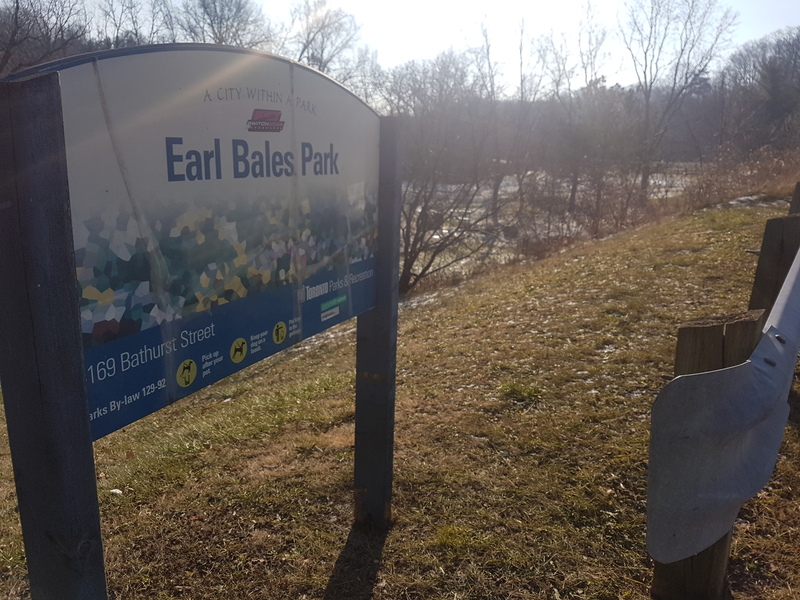 Earl Bales Park — named for a former North York Reeve and great-grandson of John Bales — opened on a chilly December 2, 1973 with one last round of golf on the 163 acre site. 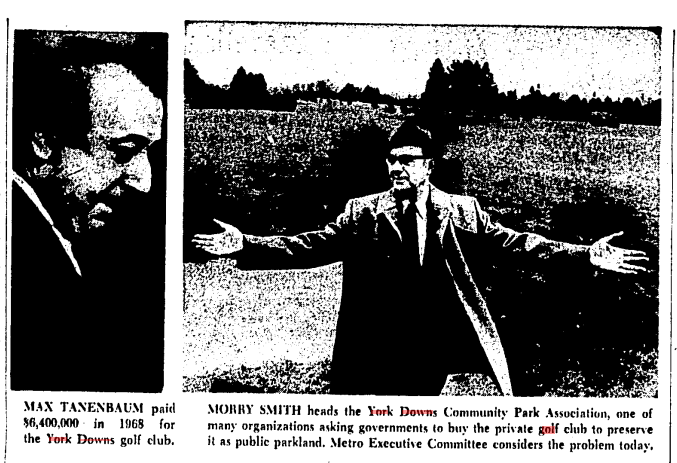 “Max Tanenbaum and Morry Smith”, Toronto Daily Star, April 16, 1971. Credit: Toronto Public Library. Walking south from the Bales homestead, the landscaping leftovers of the York Downs course are still evident on the land with sand traps, mounds, and trees. Then and now aerial maps provide an interesting comparison of the layouts of the course and the park. 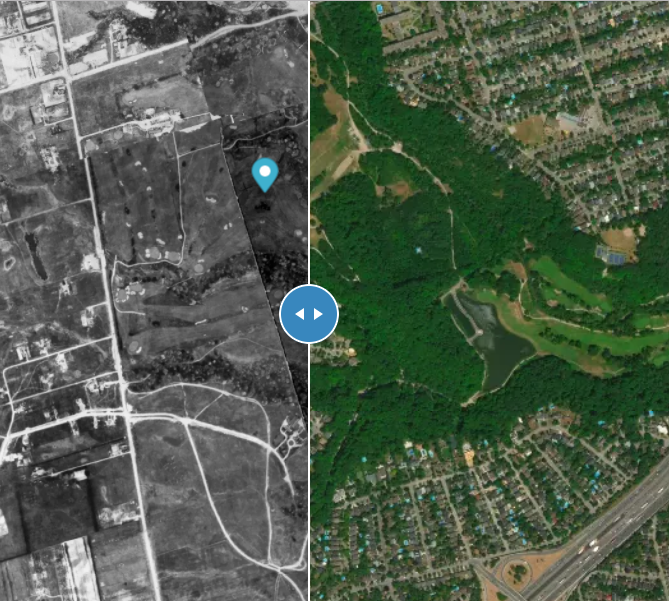 York Downs Golf Course & Earl Bales Park, 1947 & 2019. Credit: Sidewalk Labs OldTO. Walking down the western half of Earl Bales Park, you can see several attractions added to the park over the years. 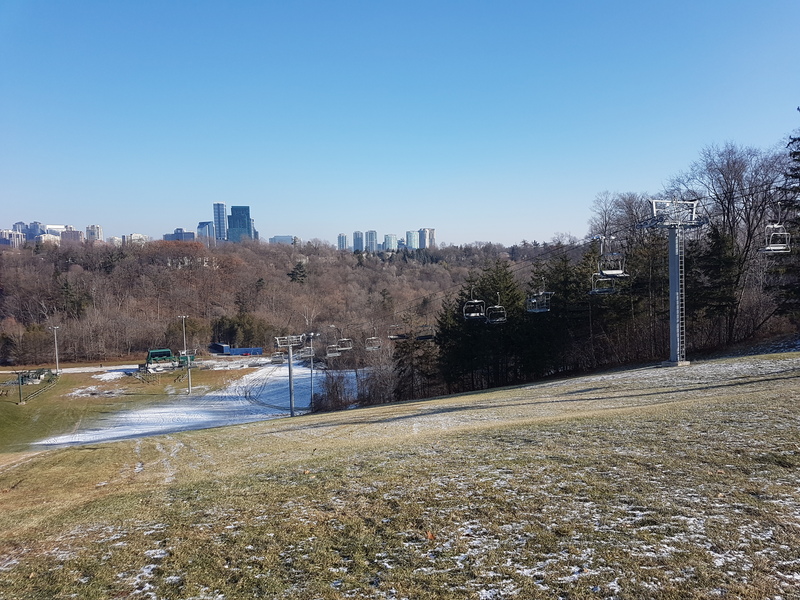 Taking advantage of the park’s elevation, the North York Ski Centre came in 1973 to provide local skiing to the residents of North York and Toronto. “North York’s Big Opener”, Globe and Mail, Jan 9, 1974. Credit: Toronto Public Library. There is also the Barry Zukerman Amphitheatre, which came by 1989 and named for a prominent Canadian Jewish businessman. The theatre is notable for its great performances in the summer. The most powerful installation in Earl Bales Park is undoubtedly the Yad Vashem Holocaust Memorial. 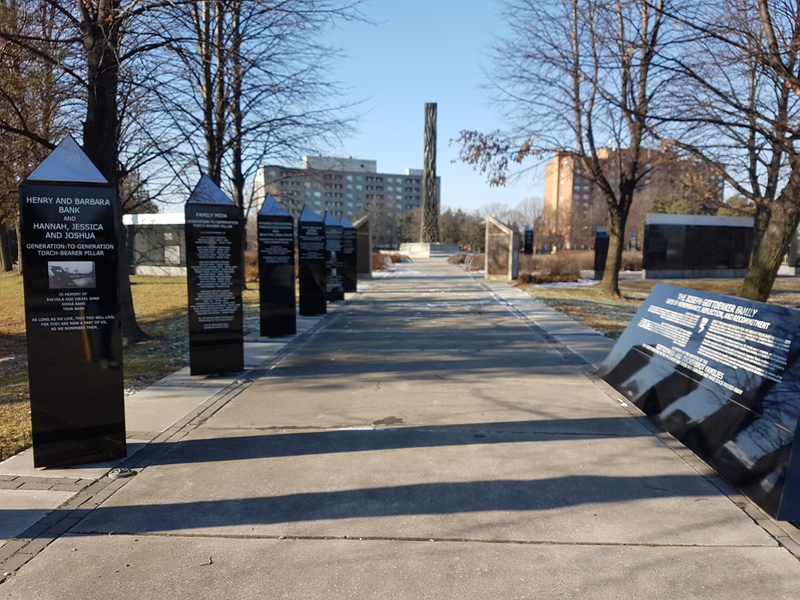 It was unveiled in 1991 with The Wall of Remembrance devoted to victims and survivors coming in 2001. Particularly sombre is the portion dedicated to children, including Anne Frank. 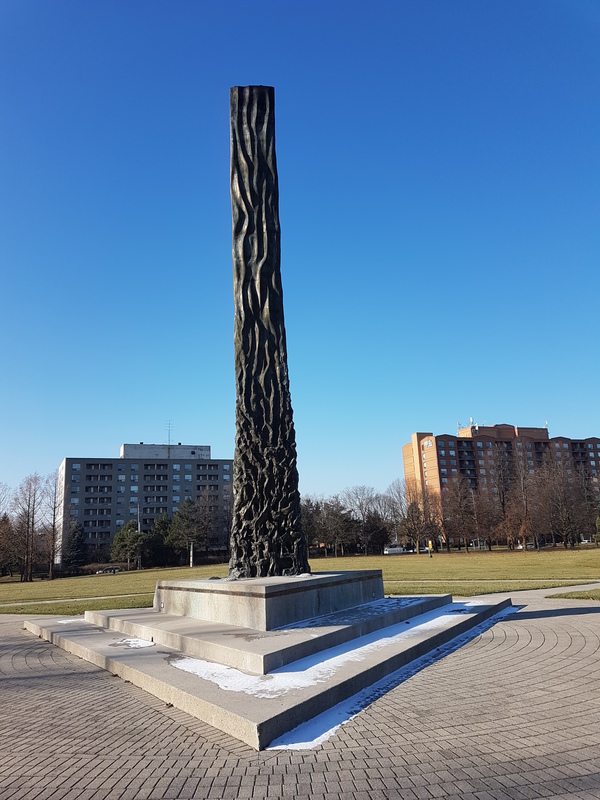 The obelisk is the Spirit of Bravery Memorial. 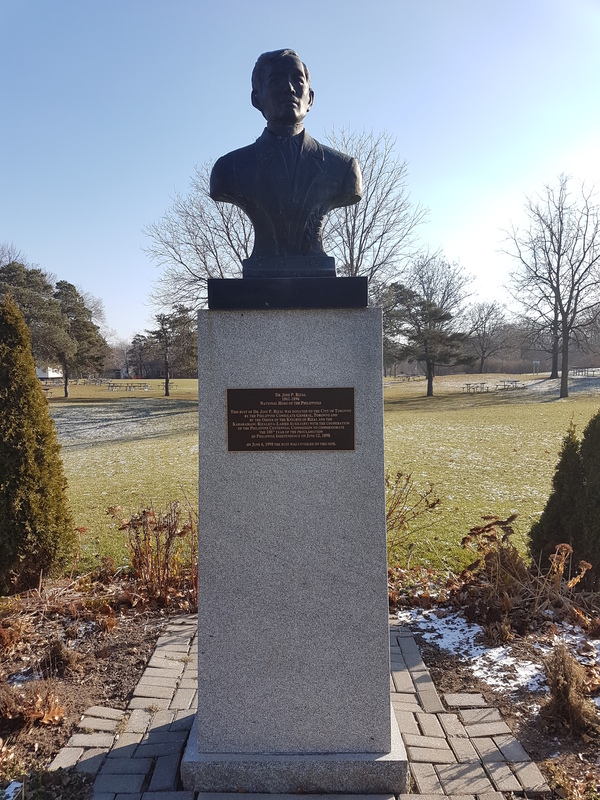 Finally, a bust of Philippine National Hero Dr. Jose P. Rizal came as a gift from the Philippine Government to the City of Toronto in 1998. These additions to Earl Bales Park represent the notion that parks can be and should be reflections of their environs. 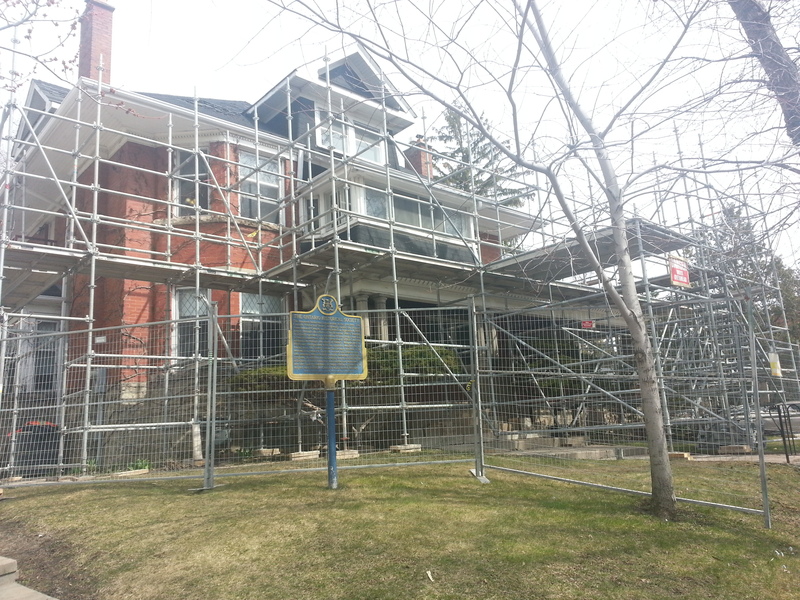 For example, the John Bales House — a representation of British colonial York — is now the Russian House Toronto. Since the end of the World War II, the area around the park along Bathurst Street gradually grew with new subdivisions and new populations. Toronto’s Jewish population (and Eastern Europeans in general) moved north on Bathurst to Forest Hill by 1950 and even further to Bathurst Manor in 1957. Toronto’s Filipino population arrived to the city mostly in the 1960s, first to St. Jamestown and then to ‘Little Manila’ at the Bathurst and Wilson area. 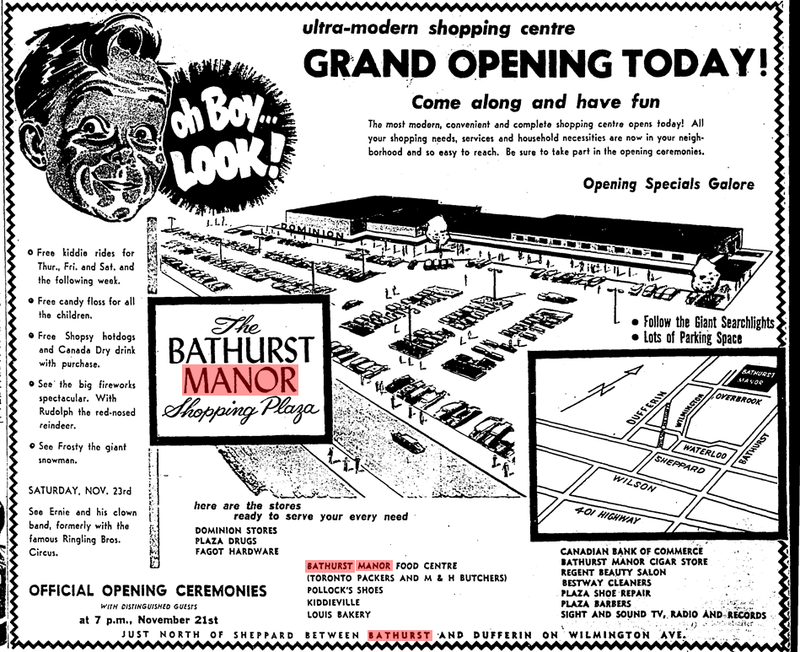 “Bathurst Manor Shopping Plaza Grand Opening”, Globe and Mail, November 21, 1957. Credit: Toronto Public Library. One neighbouring area tied to the history of the York Down Golf Course is Armour Heights. The community, located directly south of Earl Bales Park, is named for the Armour family who were contemporaries of the Bales clan. 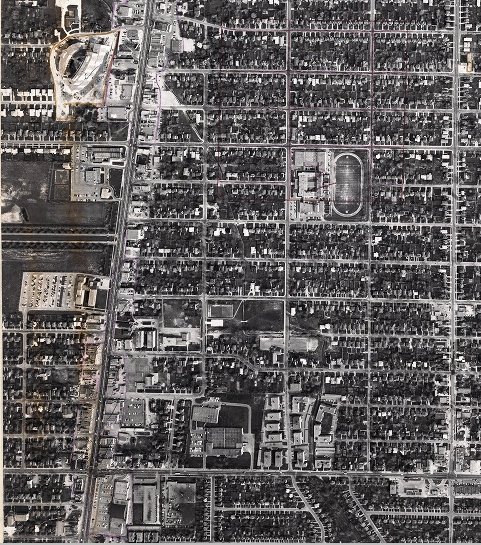 The Armour lands came under the control of the Robins Real Estate Limited in the early 20th century, who in the 1910s and 1920s intended on making three master-planned, upscale communities in north Toronto: Armour Heights, Ridley Park, and Melrose Park. Together these were to be the ‘Highlands of Toronto‘. 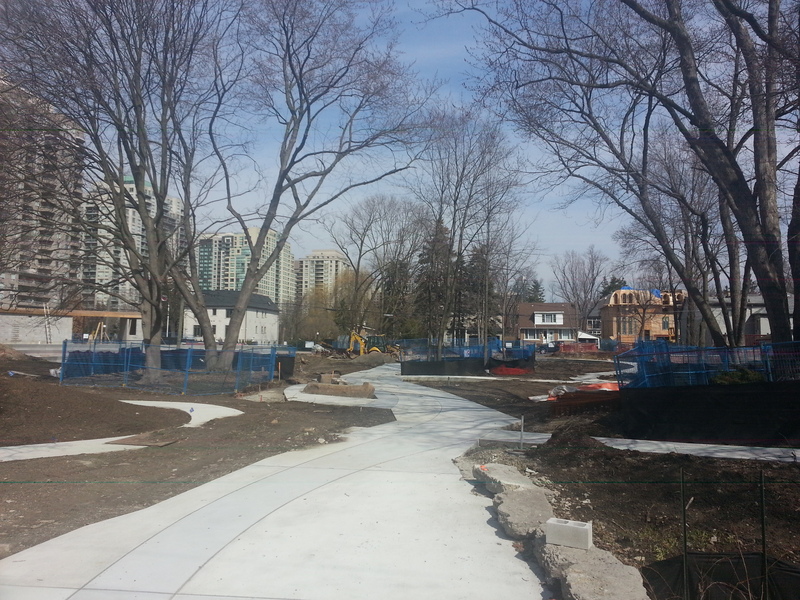 Robins Ltd also had a hand in Cedarvale’s ambitious genesis. 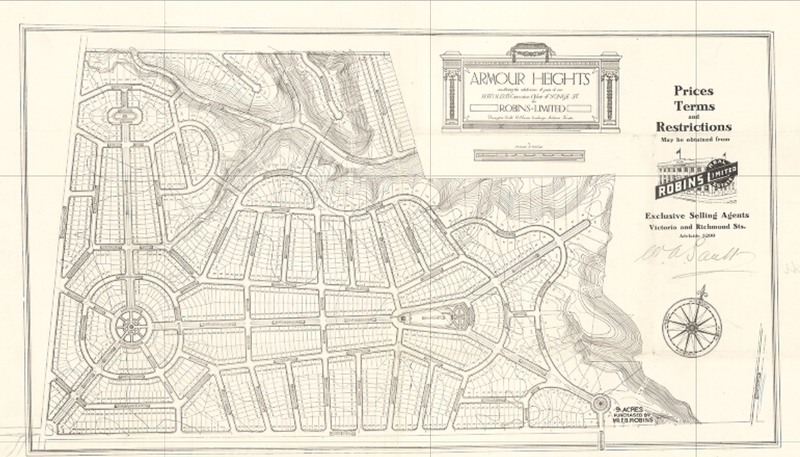 Much in the same way as that suburb, Armour Heights was planned with lavish roundabouts, gardens, squares, and tennis courts and bowling greens. 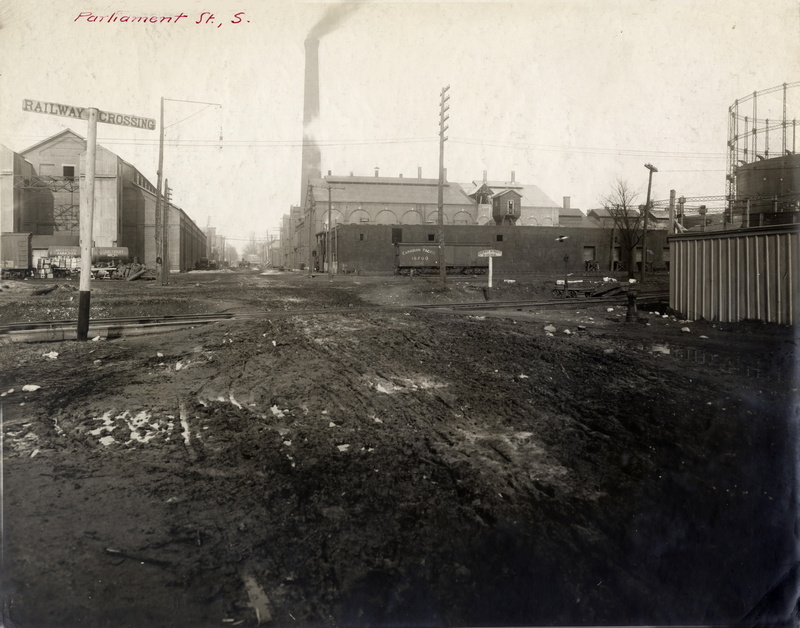 Armour Heights – being the subdivision of parts t lots 11, 12, 13, Concession 1, west of Yonge Street, circa 1913. Credit: City of Toronto Library. 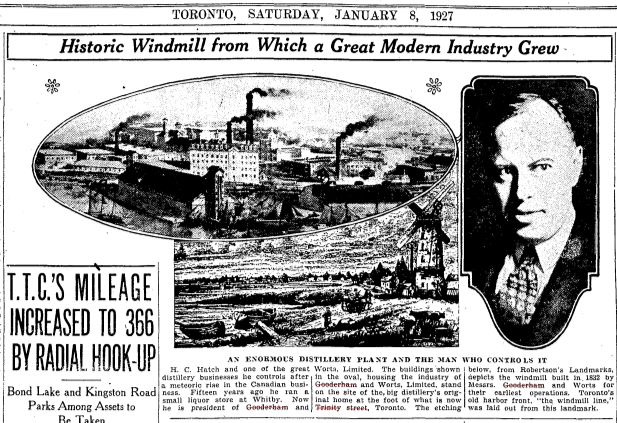 “The Highlands of Toronto”, Toronto Daily Star, April 13, 1923. Credit: Toronto Public Library. 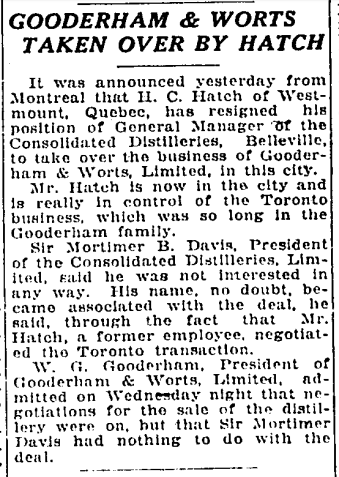 “Why People Are Buying in Armour Heights”, The Globe, April 9, 1923. Credit: Toronto Public Library. 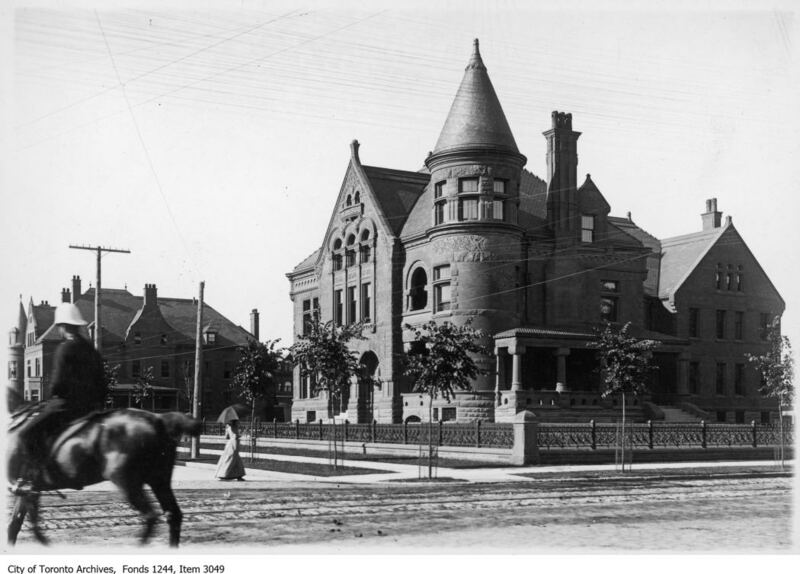 The owner, Colonel Frederick Burton Robins, built a Tudor-style estate house near Yonge Street and Wilson Avenue. 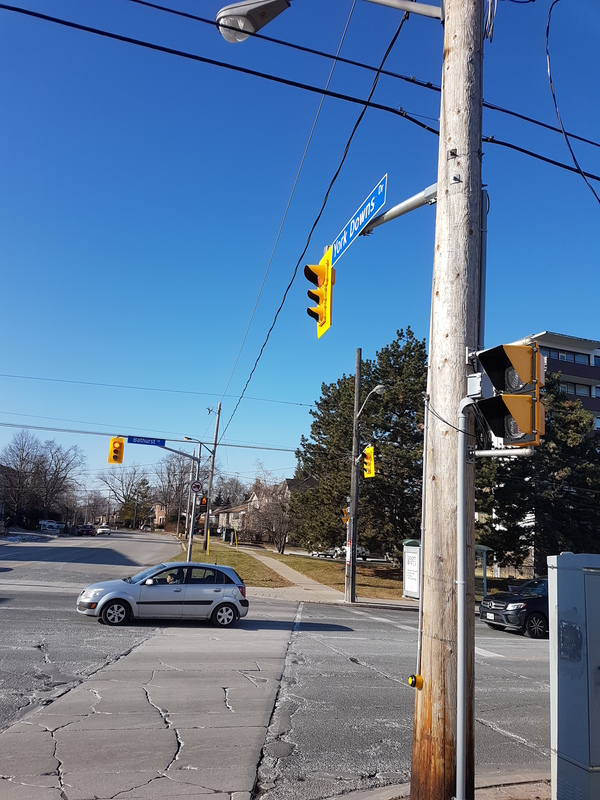 Marketing pieces highlighted a bus line between Yonge and Bathurst Streets via Yonge Boulevard and Armour Heights’ proximity to the York Downs Golf Course. Armour Heights hosted air demonstrations and was even considered by McMaster University for a campus. 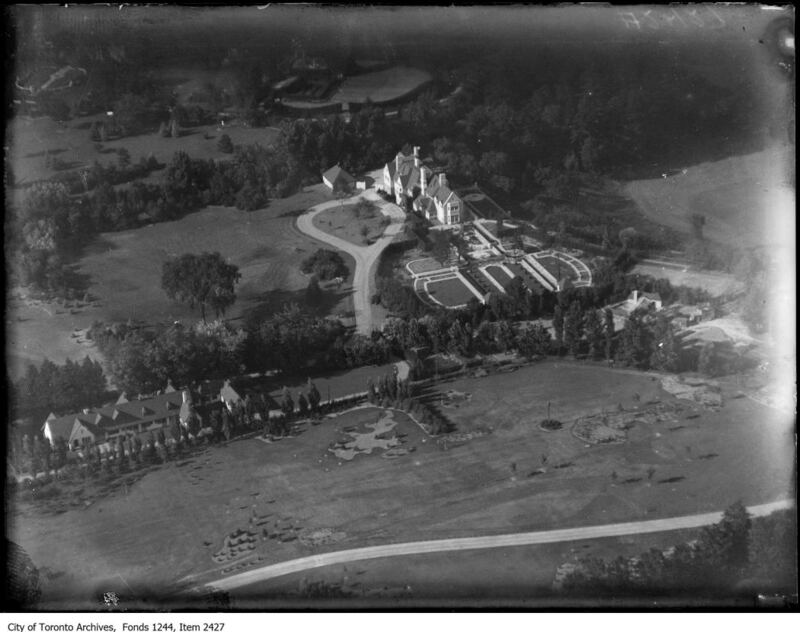 Robins Country Estate, Wilson Avenue west of Yonge Street, circa 1930. Credit: City of Toronto Archives. 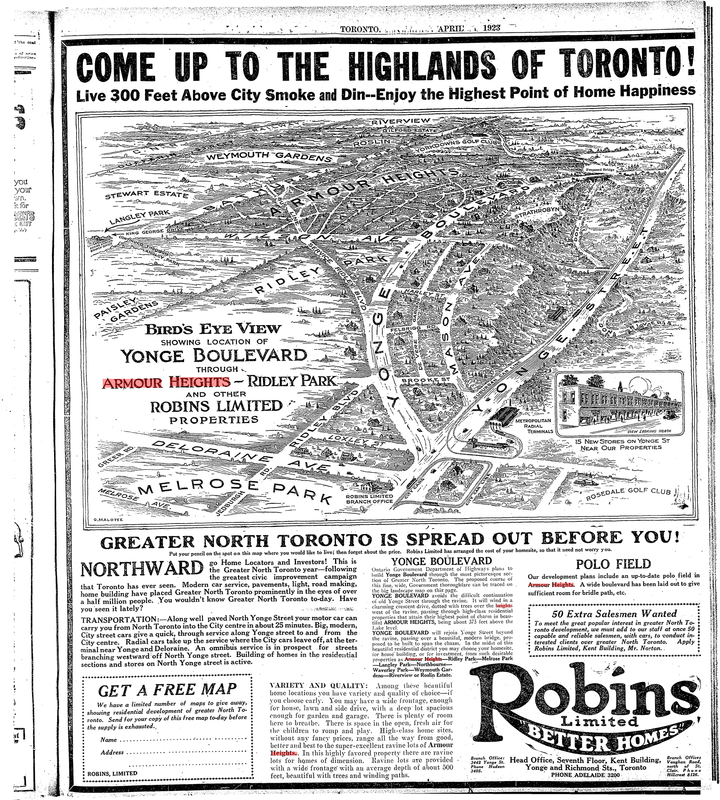 “Robins Limited Motor Bus Service”, Toronto Daily Star, May 21, 1914. Credit: Toronto Public Library. 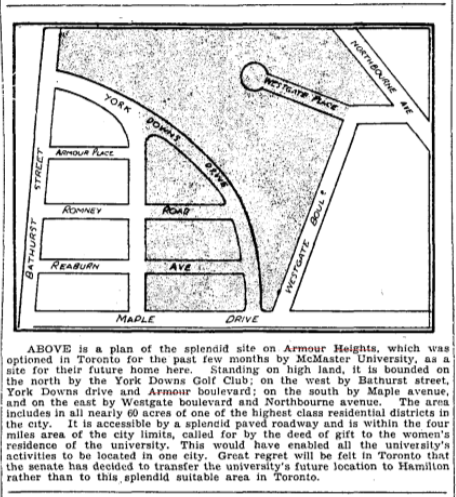 “A Plan of The Splendid Site on Armour Heights”, Toronto Daily Star, December 24, 1926. Credit: Toronto Public Library. Like in Cedarvale, Colonel F.B. Robins’ vision for Armour Heights never fully materialized. By 1929, he sold the 300 acres to R. K. Lillico and associates for $930,000. Their idea was to re-brand the area as ‘Beverley Hills’, but the moniker never caught on. The street grid developed under its current form, filling out completely by 1950. It did eventually receive its bus line with the Toronto Transit Commission’s Armour Heights route in 1952. Armour Heights Robins’ grand estate house is now used by the Canadian Forces College. 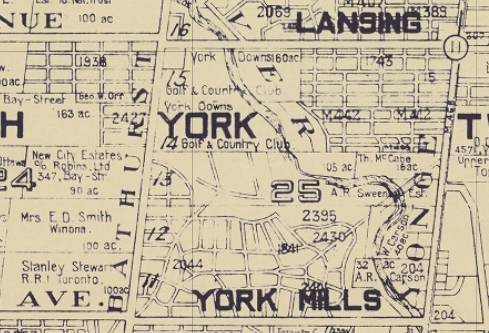 Today York Downs Boulevard — one of the early streets — remains as a tribute to the golf club and fittingly connects the park and subdivision. Back in Earl Bales Park, a man-made pond exists on the southern end. 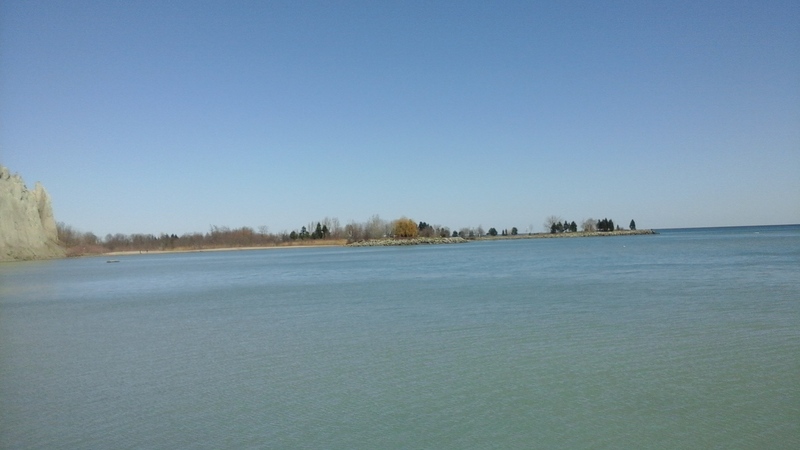 Earl Bales Lake is a storm-water management pond. Beyond it is the Don Valley Golf Course. The Hoggs Hollow Bridge portion of Highway 401 runs over the course. The Toronto By-Pass, as the expressway was known before it was numbered, opened here in 1953, splitting up the golf course and Armour Heights. Don Valley Golf Course, Yonge St., w. side, from s. to n. of Macdonald-Cartier Freeway; looking n.w. to Macdonald-Cartier Freeway bridge over West Don River., 1955. Credit: Toronto Public Library. 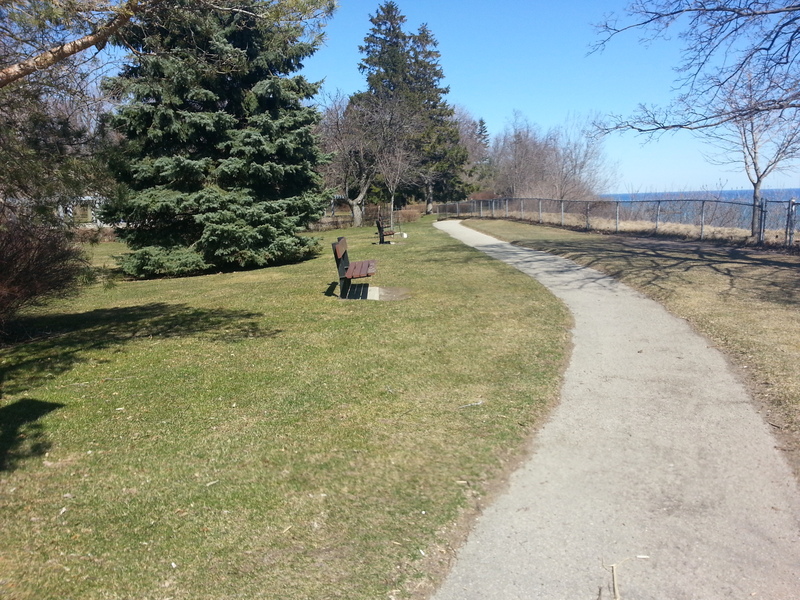 The east side of Earl Bales Park is scenic walk through nature. One is struck by the tree cover, both on this hills and in the valley. 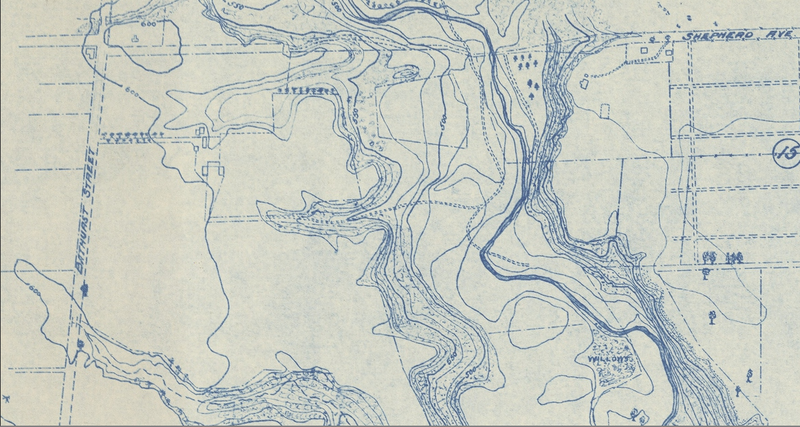 A topographical map of the West Don River from 1915 shows off the contours and some cases the tree types of the land that would become the park. 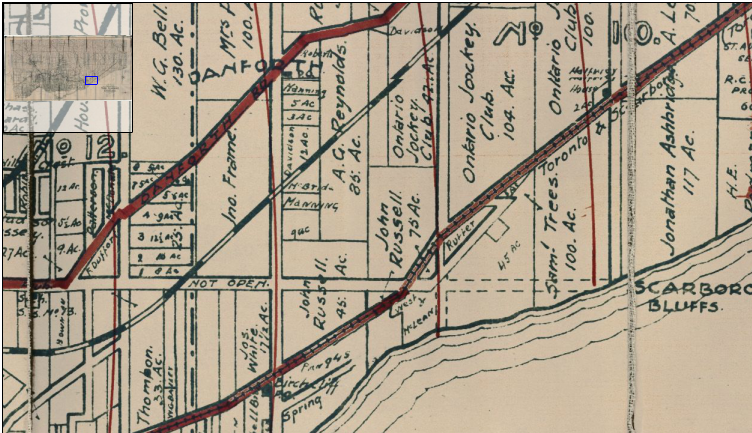 Plan of west branch Don River Valley from Lawrence Avenue to corner Sheppard and Bathurst, 1915. Credit: City of Toronto Archives. 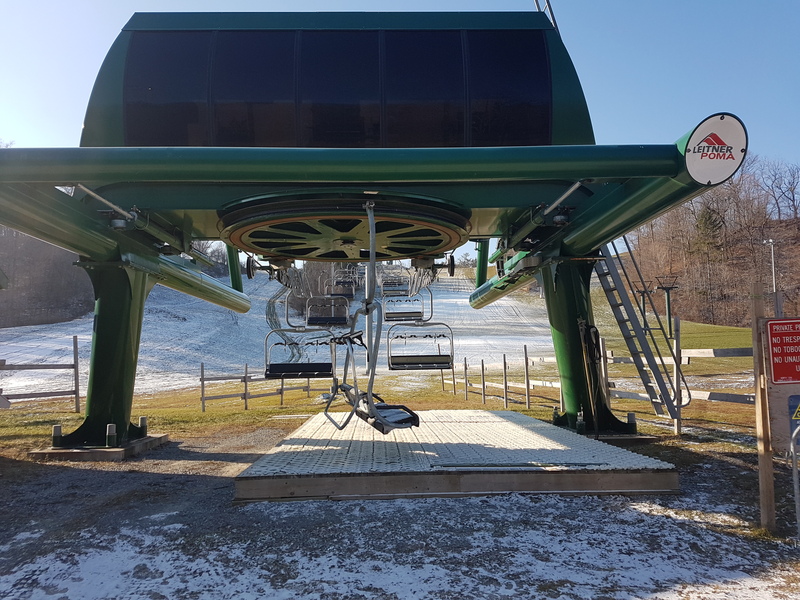 One also gets a look from below at the ski slope. 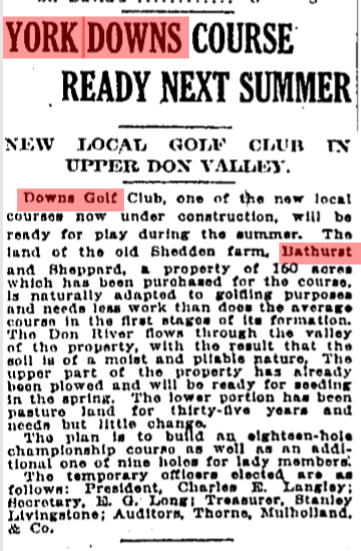 ‘Downs’ refers to a grassy hill, so this might explain the naming of golf course. A shallow west branch of the Don River runs through the edge of the property. The river and the way across it has had a few interventions in the second have the 20th century. 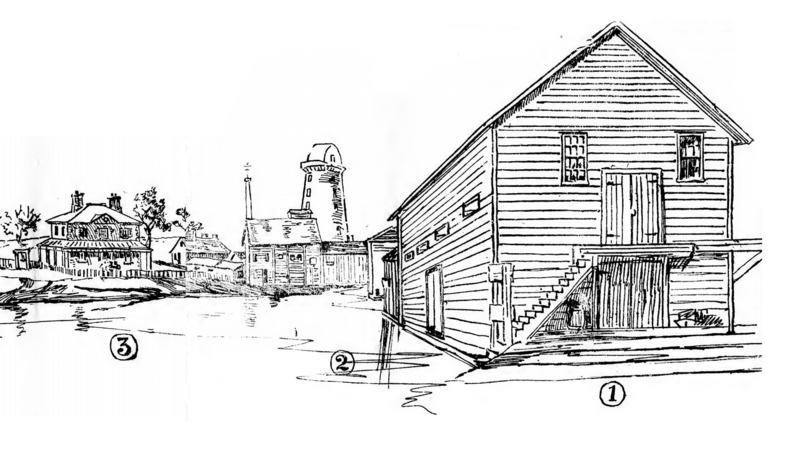 At one time, albeit north and south of the park, the waterway hosted saw and grist mills. In 1956, the river’s winding course was straightened. West Don River, 1953-1956. Credit: City of Toronto Archives. 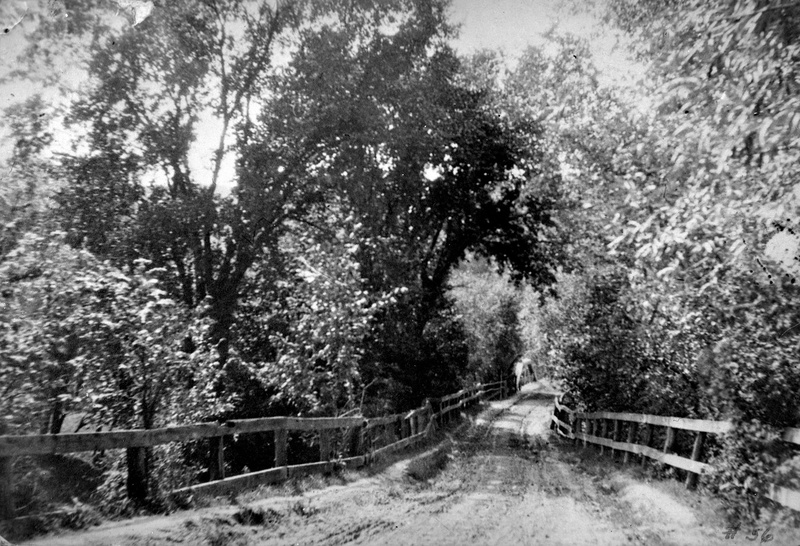 The history is unclear, but the first photographed bridge was a wooden construction that existed until at least from 1910 (its construction date is unknown). Sheppard Avenue bridge over the Don River near Bathurst Street., 1910. From North York Historical Society. Credit: Toronto Public Library. 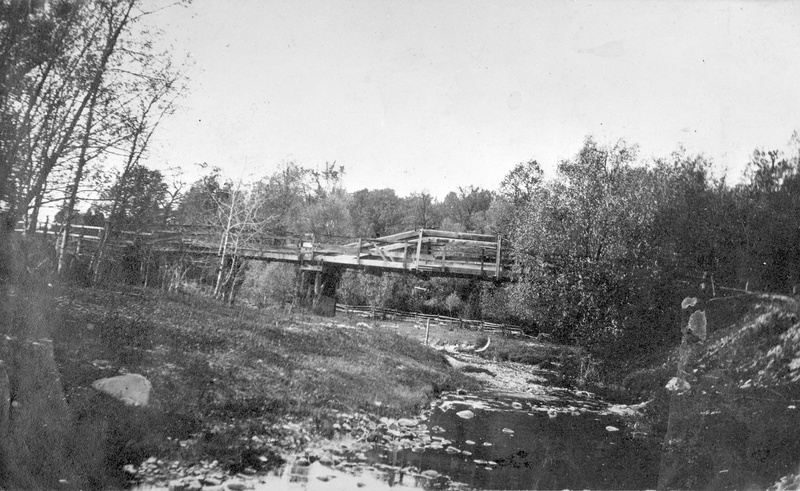 Wooden bridge over Don, 1908-1910. 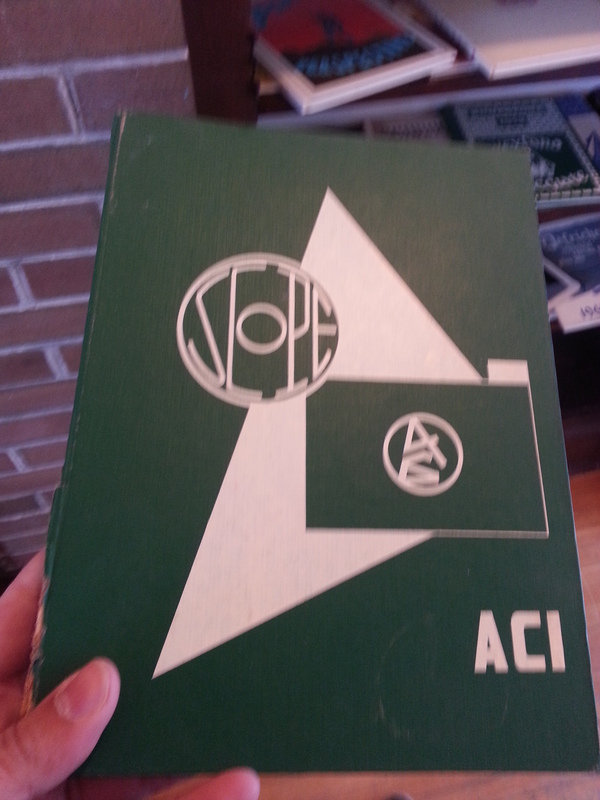 From North York Historical Society. Credit: Toronto Public Library. Its replacement — a more sturdy setup — came by 1920. 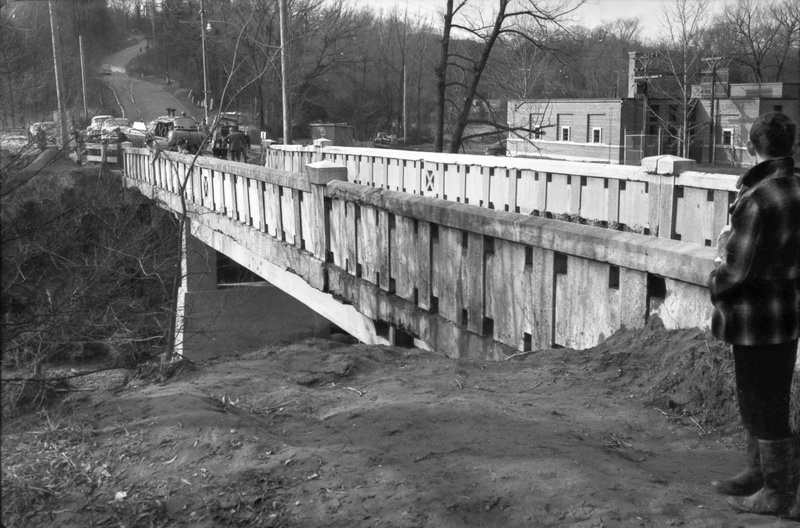 Flood damage from Hurricane Hazel briefly closed the bridge in November 1954. The storm did, however, completely wipe out the nearby Bathurst Street Bridge. The event might have led to the bridge’s replacement in the following decade. 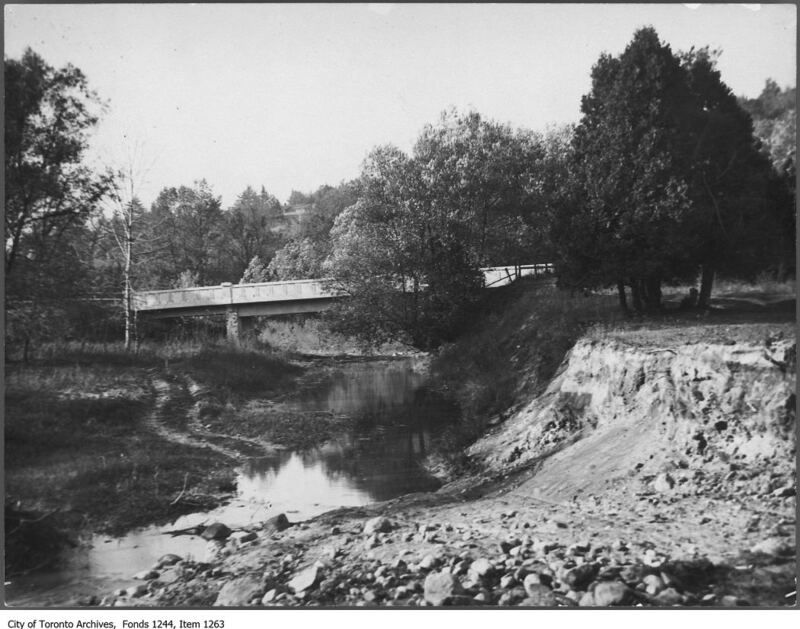 Sheppard Avenue West bridge over West Don River, 1920. This is the same view as the above wooden bridge photo. Credit: City of Toronto Archives. 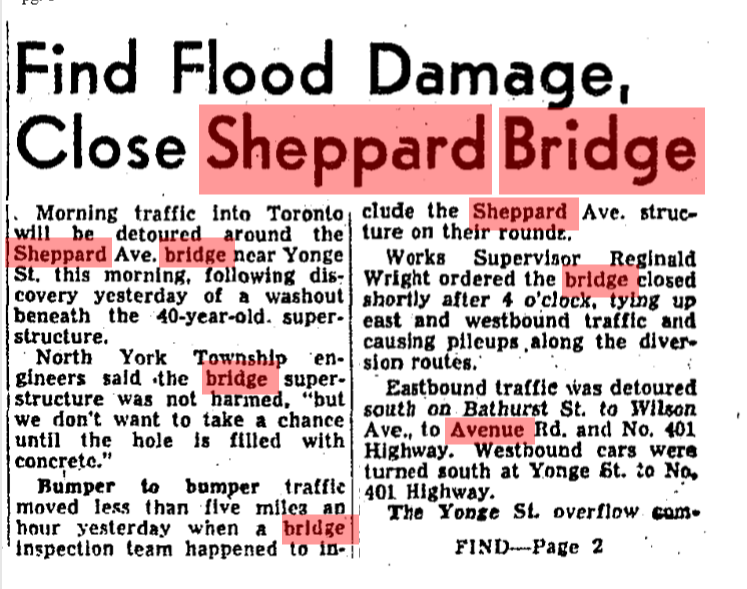 “Find Flood Damage, Close Sheppard Bridge” Globe and Mail, November 26, 1954. Credit: Toronto Public Library. Don River (West Don R.), looking w. across Sheppard Ave. bridge, 1954. Photographer James Salmon notes the bridge’s washout after Hurricane Hazel. Credit: Toronto Public Library. The third – and present – bridge began construction in 1961 and opened by 1962 or 1963. 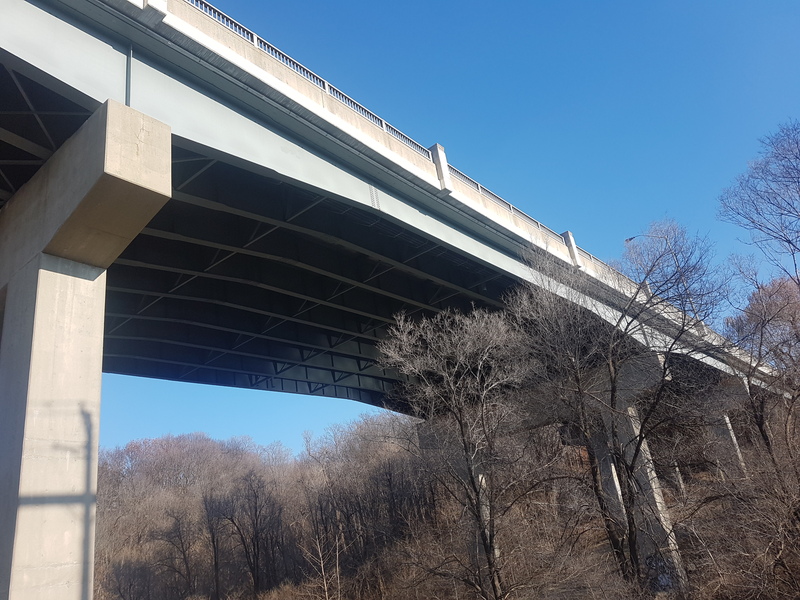 The section of the West Don River below it was channelized with concrete holdings. 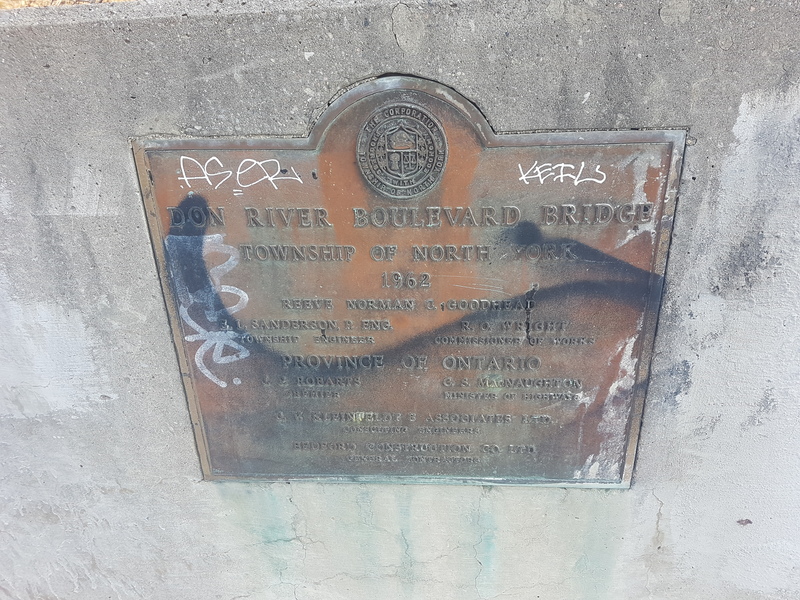 Also in 1962, the Don River Boulevard bridge was replaced. The short and quiet street curiously dates to the 19th century – at least to 1860 by cartographic accounts – and ran through the Shepard family property in Lansing to Bathurst. When both bridges were replaced in the 1960s, Don River Boulevard was also reconfigured to circle up the Sheppard Avenue, linking the street with the park. Sheppard Avenue over Don River, 1962 & 1963. Credit: City of Toronto Archives. Exiting Earl Bales Park, one may go up to the main street or cross the bridge into the Hinder Property, leaving behind a great history. 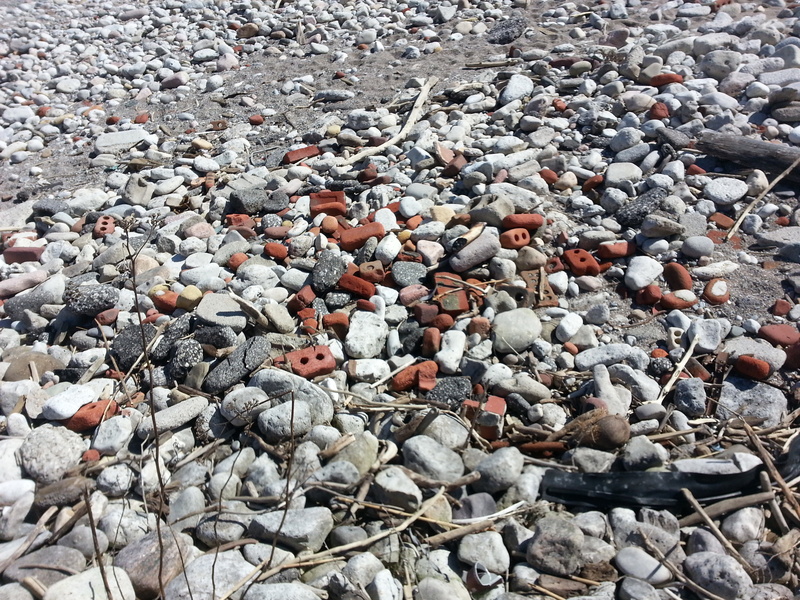 Toronto was a brick-making town. Going through the city today, you would not realize it right away. This lost and remade industrial and natural geography is remarkable. Great clay refining enterprises from the Don Valley to Leslieville to Yorkville to North Toronto to the West Toronto Junction now carry transformed greenspaces or residential communities. 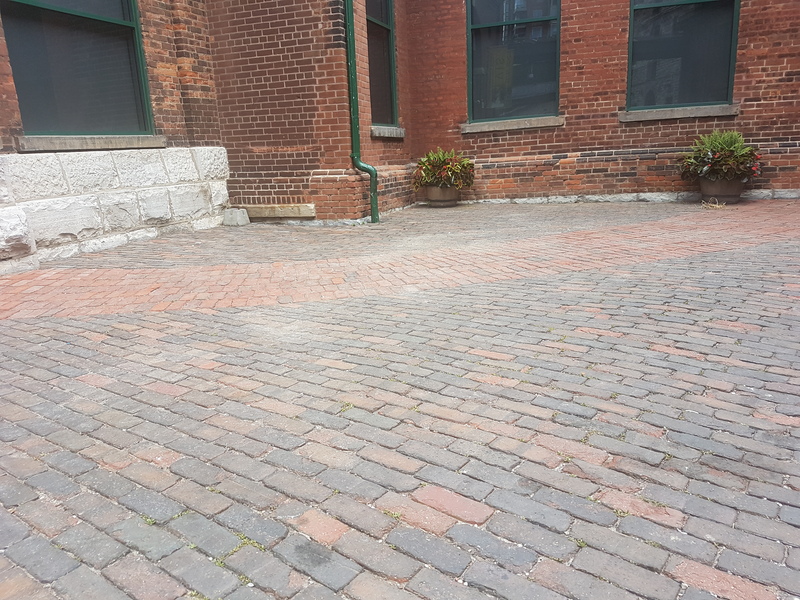 The Evergreen Brick Works is one of those spaces. Don Valley clay pits, part of Don Valley Brick Works (Toronto). James Blomfield. June 10, 1939. Credit: City of Ontario Archives. 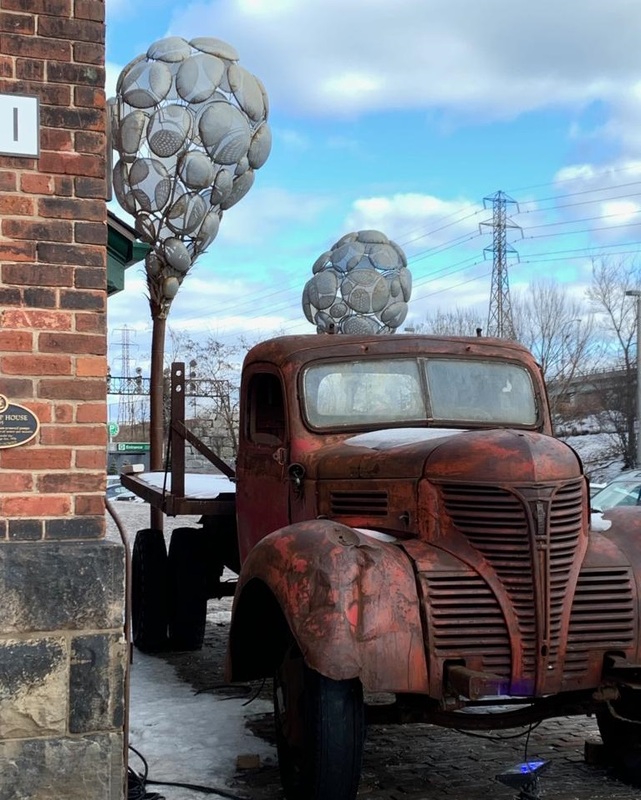 The Don Valley Brick Works began operations in 1889 and lasted quite a long time, providing the literal building blocks for the city of Toronto until 1984 — not a long time ago. 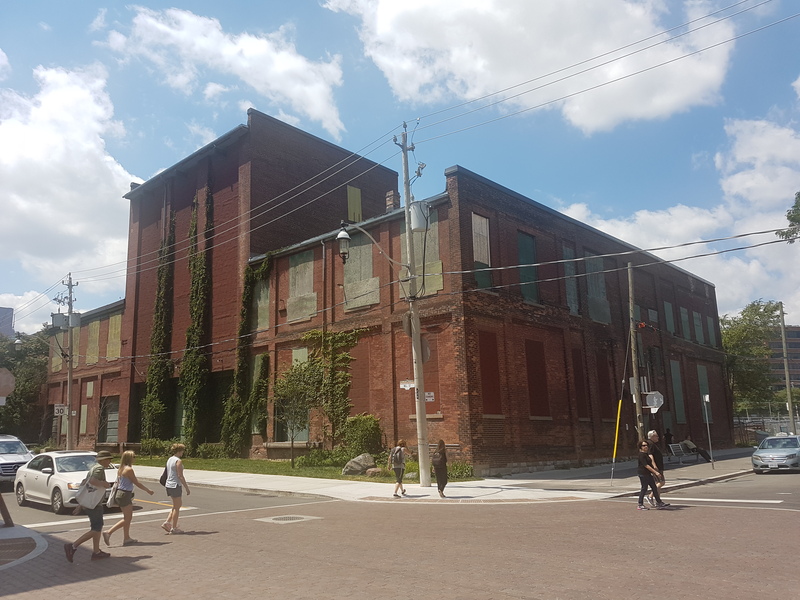 One can think of the Brick Works as the last bastion for smokestack-raising, pollution-spewing, heavy manufacturing in Toronto. Don Valley Brick Works, Bayview Ave., w. side, s. of Chorley Park in Don Valley; looking s. from Chorley Park, 1952. Credit: Toronto Public Library. 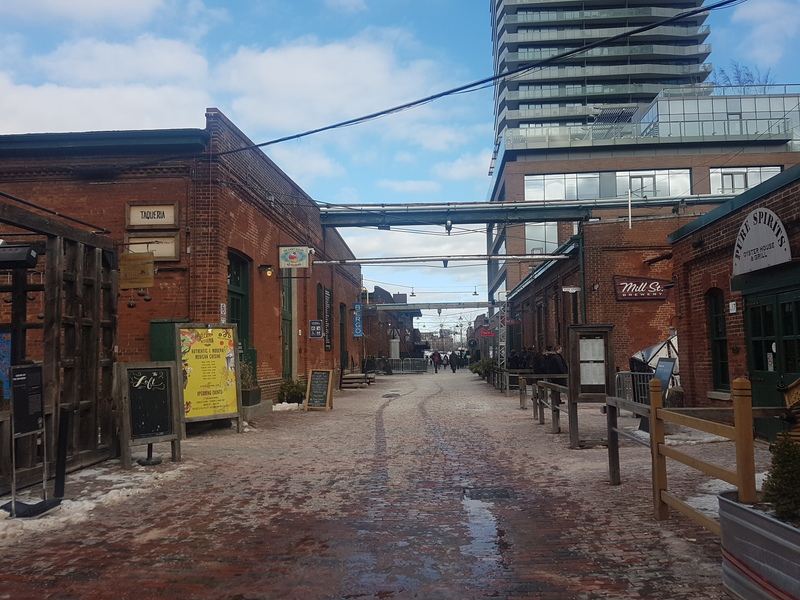 Following its closure, much like a lot of discussions then and now in how to imagine the post-industrial metropolis, the Toronto and Region Conservation Authority and City of Toronto looked to expropriate former brickyard as public space. During this ‘transition’ time, the abandoned factory became a haven for urban explorers. Don Valley Brickworks, 1986. Credit: Toronto Public Library. Brickworks, 1990. Credit: Toronto Public Library. What came out of it was a rejuvenated community hub and parkland with a mandate for environmental sustainability and conservation, led through the efforts of Evergreen. 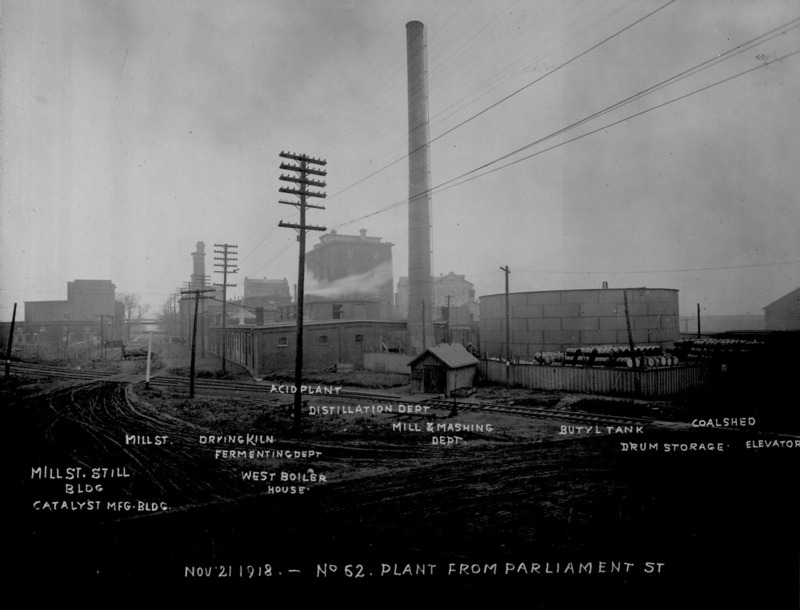 Much of the complex still stands, showing off ovens and other former operations of the Don Valley Brick Works. Today, they make great event and exhibition space which house among other things a great farmer’s market. Only one of the four chimneys remain, though. 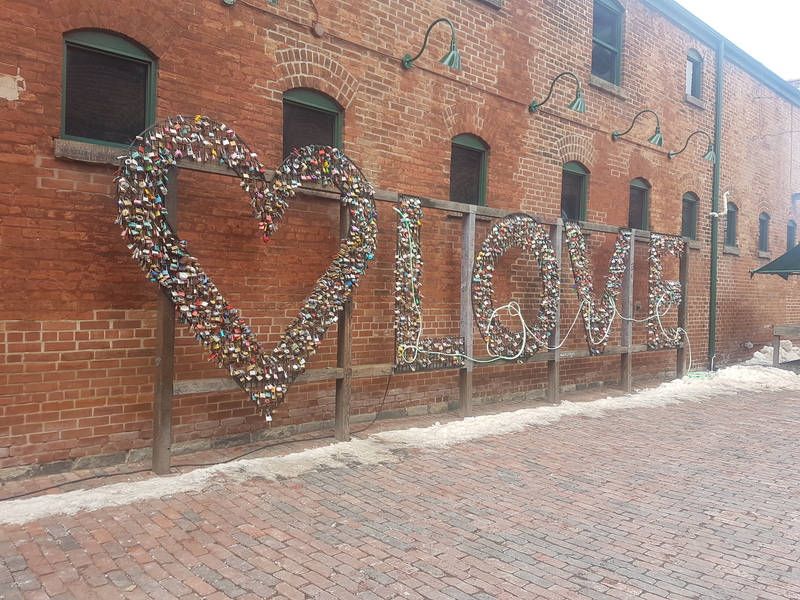 The Evergreen Brick Works is a locale full of discovery, starting with its artistic displays. A favourite of mine is “Watershed Consciousness”, which neatly showcases Toronto’s ravines as the sort of veins and life blood of the city. Fitting. One quizzical installation is a giant pair of metal shoes. 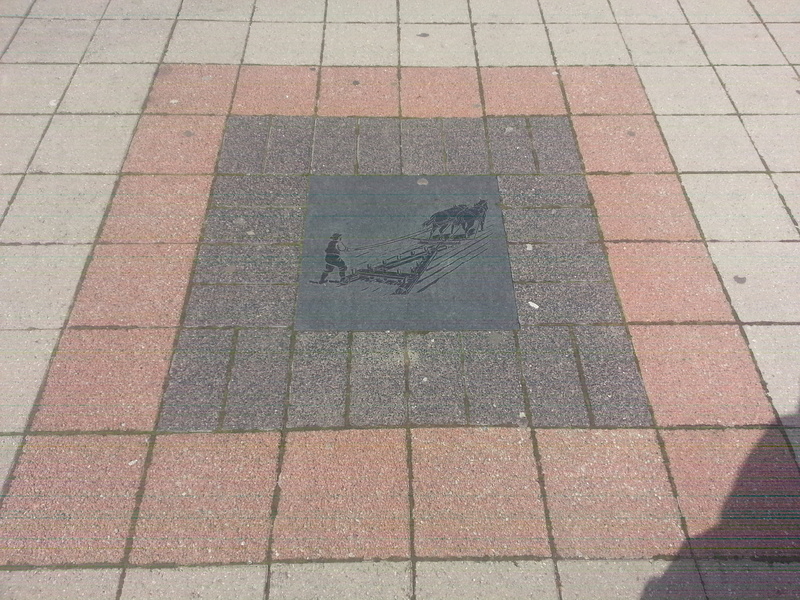 This is “Legacy (the mud beneath our feet)” by David Hind, an homage to geologist Arthur Philemon (A.P.) Coleman. 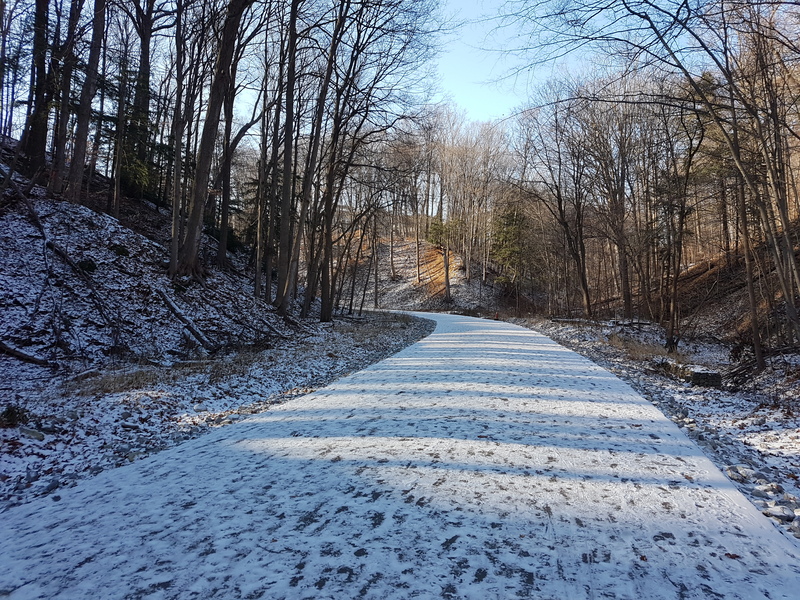 Mr. Coleman got his boots dirty many times over at the Don Valley Brick Works, using the quarry’s north cliff to research Toronto’s Ice Ages. A nearby display, “A Rare Geological Study”, presents Coleman’s notes. 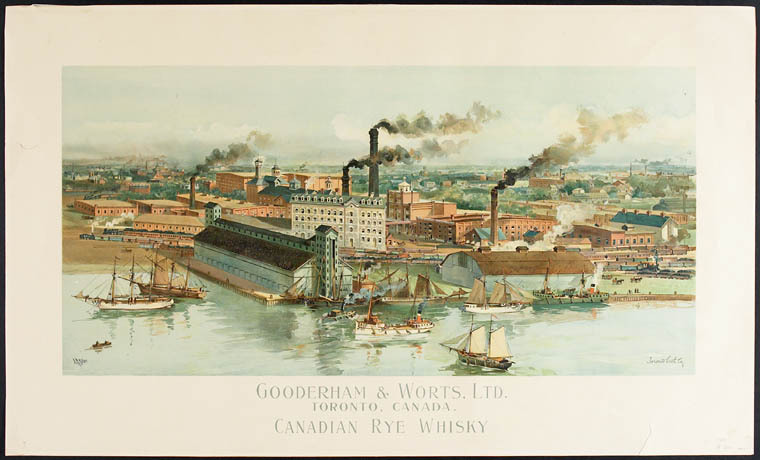 Coleman was instrumental in understanding the literal layers and pre-history of Toronto. He noted ancient beavers, moose, and bison that roamed Pleistoscene Toronto, and also mapped out the old shore of Lake Iroquois. 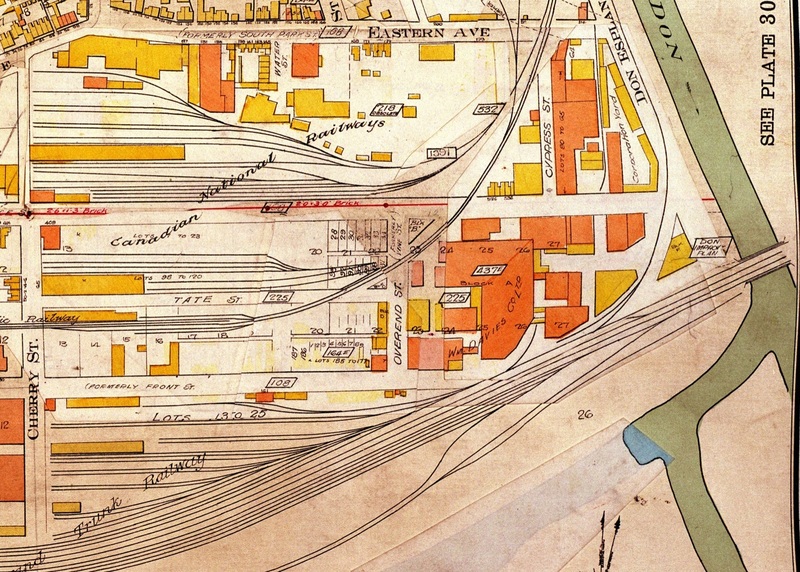 Map of Toronto and Vicinity To accompany part 1, Volume 22, Report of Bureau of Mines, 1913. Credit: University of Toronto Map and Data Library. The Pleistocene of the Toronto region Including the Toronto interglacial formation, 1932. Credit: University of Toronto Map and Data Library. 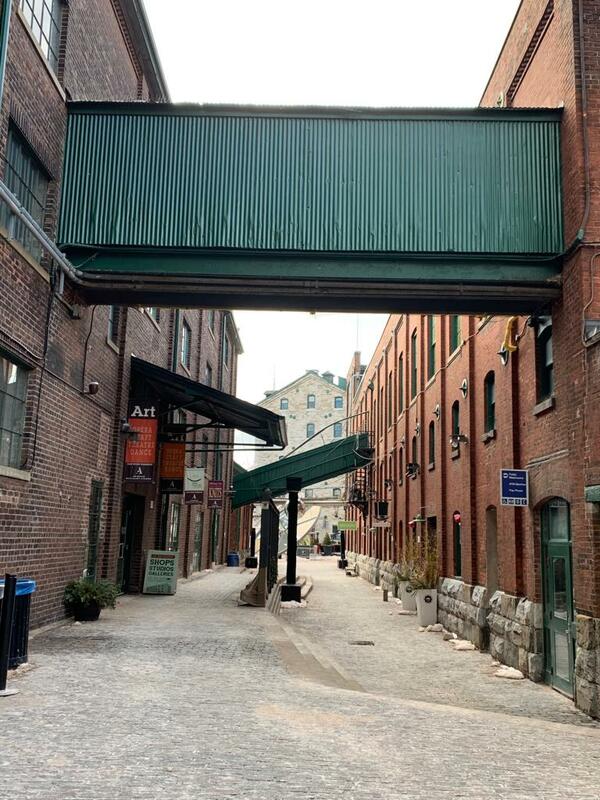 The allure of the Evergreen Brick Works is its physical landscape. Each step offers more discovery and new vantage points. Wandering deeper into the Weston Family Quarry Garden and its tall reconstructed wetland, the factory behind disappears, aside from the chimney. 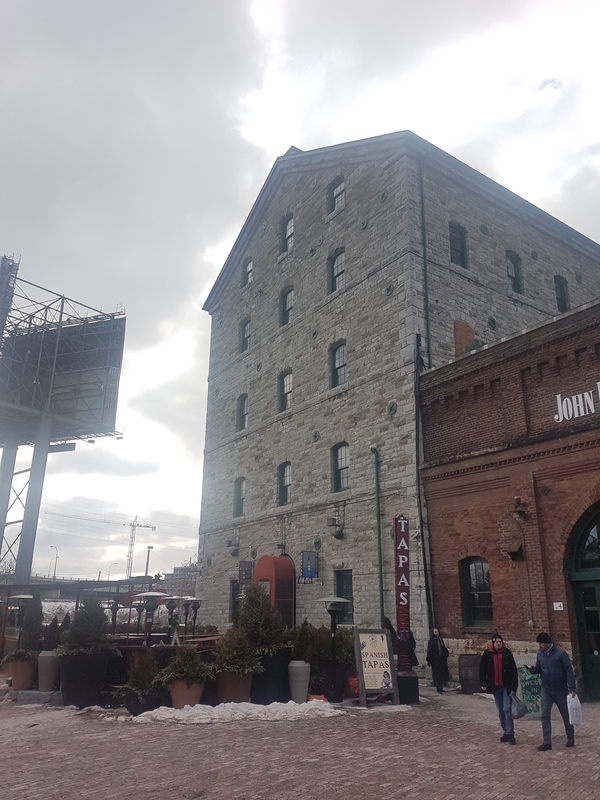 Running between the handsome factory buildings is a channelized Mud Creek (which might be the best and worst name for a waterway in Toronto). There’s a more naturalized version of the stream as well, running under the great Governor’s Bridge as one moves out of the park. Veering away from the marked trails, there is the abandoned Don Branch of the Canadian Pacific Railway, last operating in 2007. 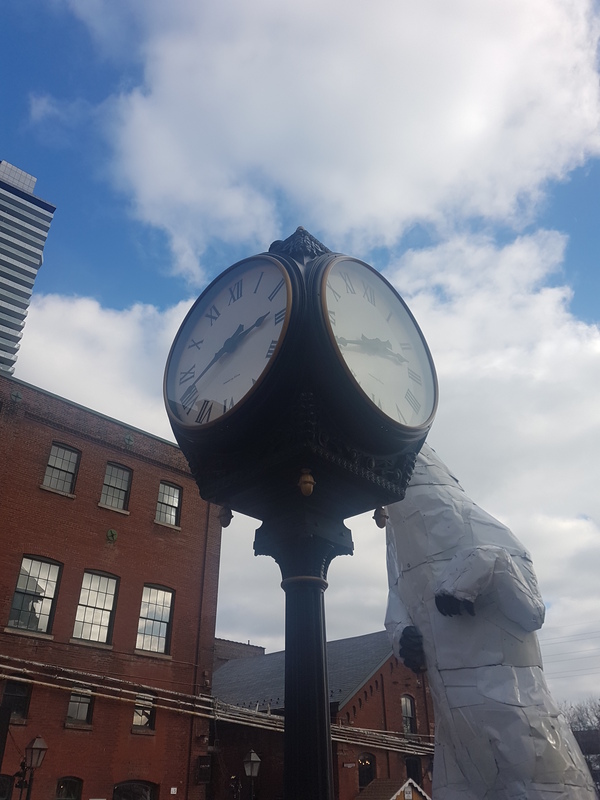 With the Belt Line Trail also nearby it’s the second ghost line of sorts at the Brick Works. Following the CPR tracks takes one to the Half-Mile Bridge, seen as one enters the Evergreen Brick Works. 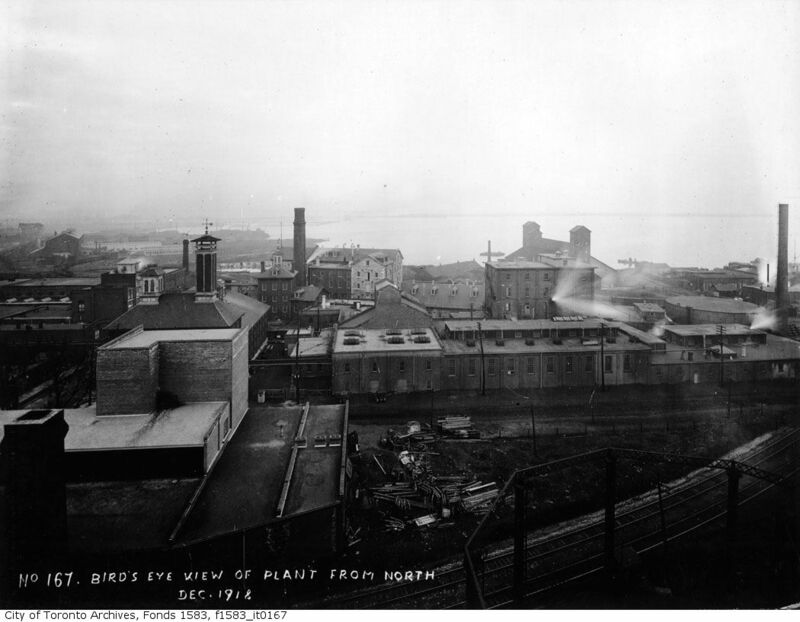 Don Valley Brick Works, Bayview Ave., w. side, s. of Chorley Park in Don Valley; looking w. from Broadview & Mortimer Ayes. 1955. Source: Toronto Public Library. 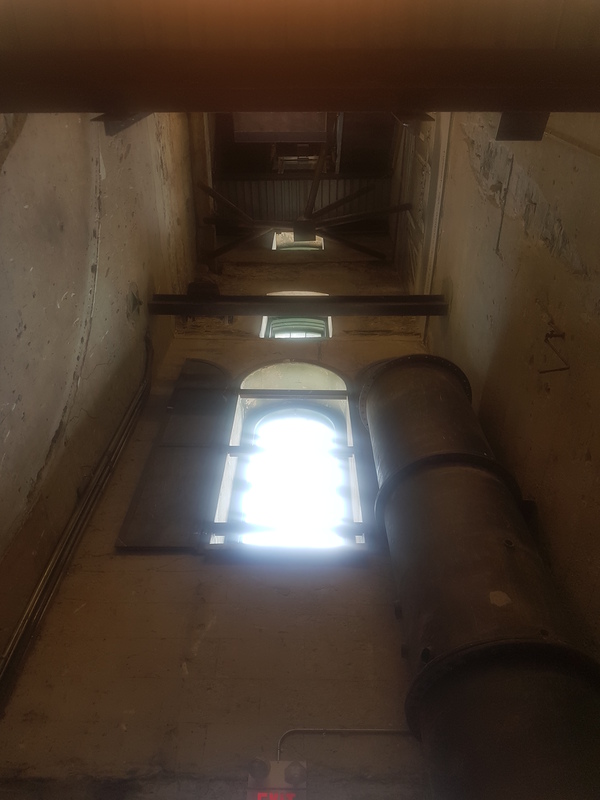 Perhaps the most inspiring experience of the Brick Works is the view from above. Moving up the cliff one takes in the awe of the full expanse of the site, its winding trails and ponds below, and the houses of Rosedale overlooking the valley. One can only take in this reclaimed natural landscape and think of its layered makeup. 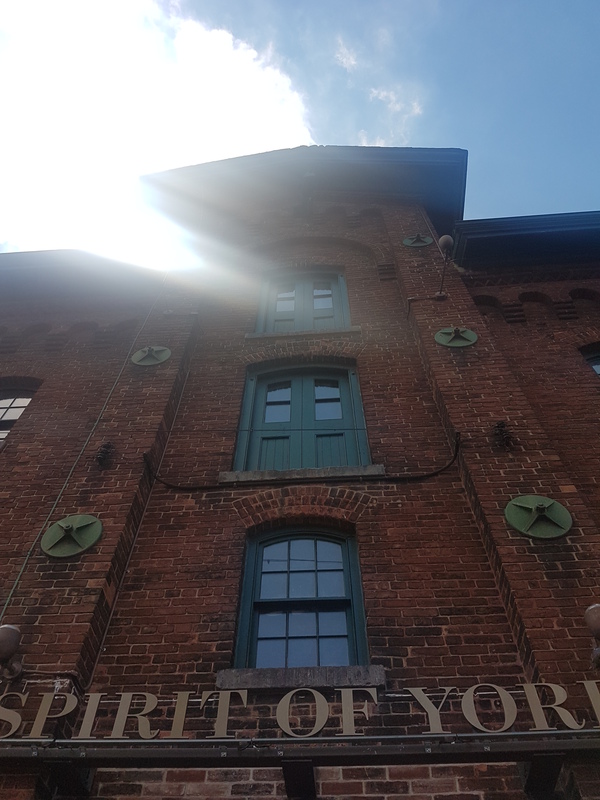 The intersection of industrial, geological, and environmental history make the Evergreen Brick Works make it a special place. A walk around it only proves that. 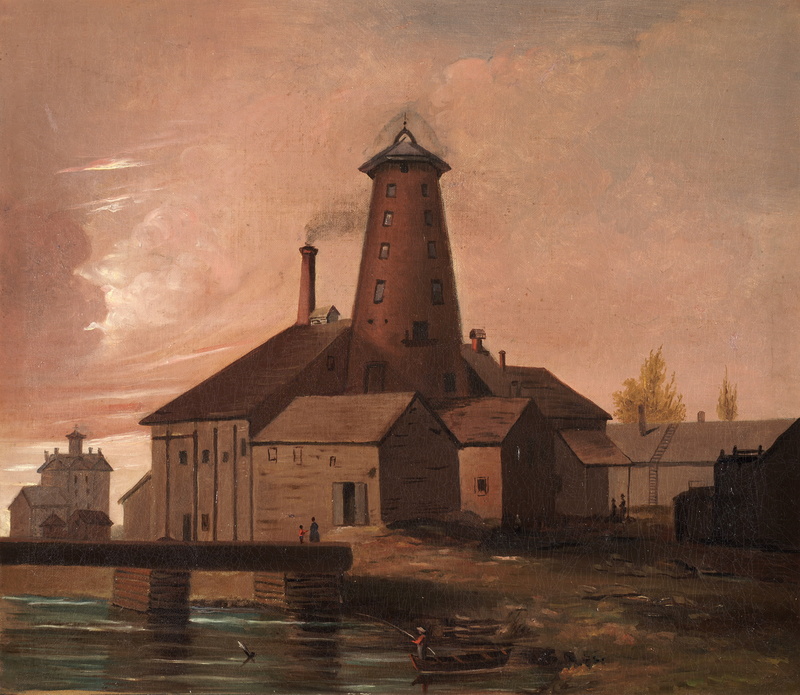 What presumably started as pristine wilderness for many Indigenous peoples, the area that came to be Kensington Market began to take shape under the 1793 colonial park lot system established and administered by John Graves Simcoe and his successors. Here, plots 17 & 18 passed through several owners, eventually falling to Denison family. While today we associate the block between College & Dundas Streets and Spadina Avenue & Bathurst Street with a dense mix of narrow streets and an unlikely mishmash of altered structures, the only built form in the first part of 19th century was the Denisons’ Georgian manor, Belle Vue (also spelt Bellevue). 1842 Cane Topographical Plan of the City and Liberties of Toronto. Credit: Old Toronto Maps. 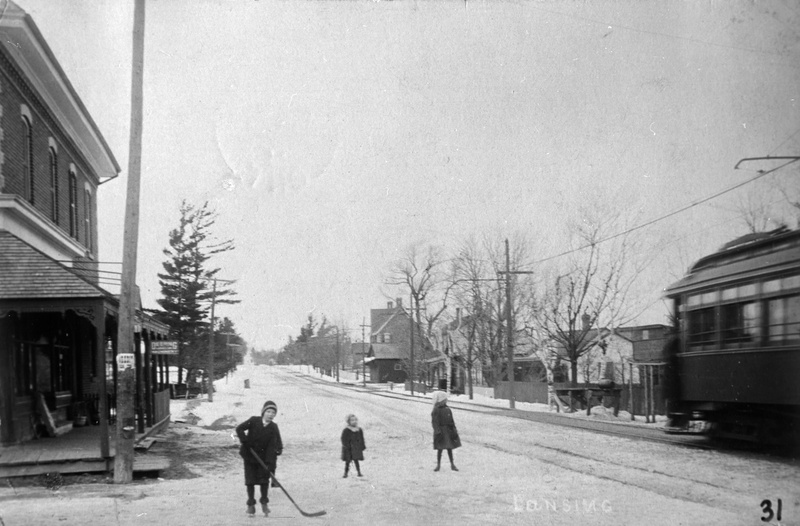 Denison, George Taylor, ‘Bellevue’, Denison Sq., n. side, e. of Bellevue Ave. 1912. Credit: Toronto Public Library. Lost in the modern geography of Kensington Market is the waterway and pond situated just above Belle Vue. 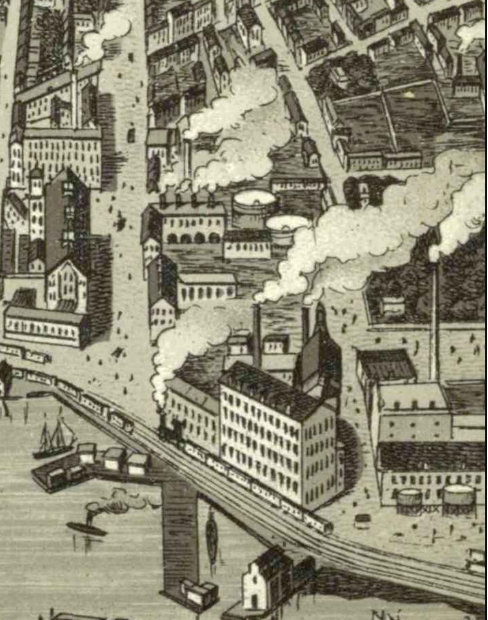 Named for a rather unpleasant character in Toronto history, Russell Creek passed through the southern half of the block towards today’s Entertainment District before flowing into the old shore of Lake Ontario near Front & Simcoe Streets. 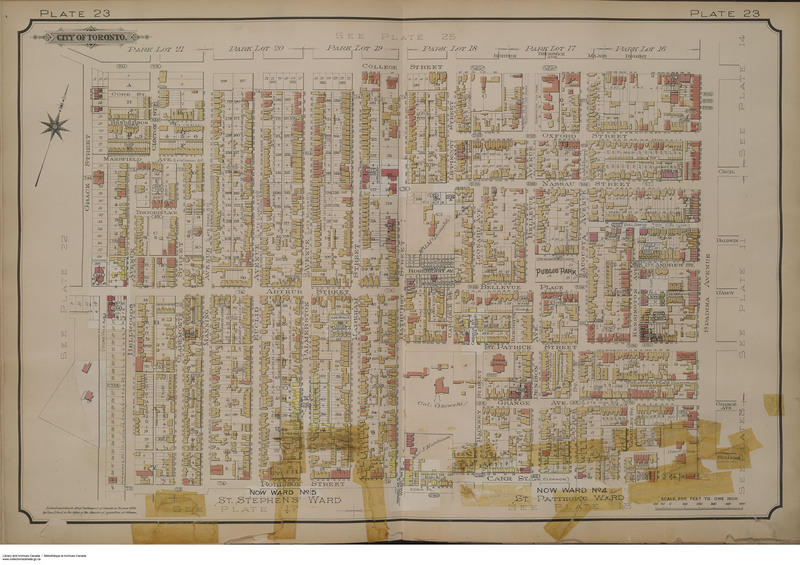 1862 HJ Browne Plan of the City of Toronto. Credit: Old Toronto Maps. 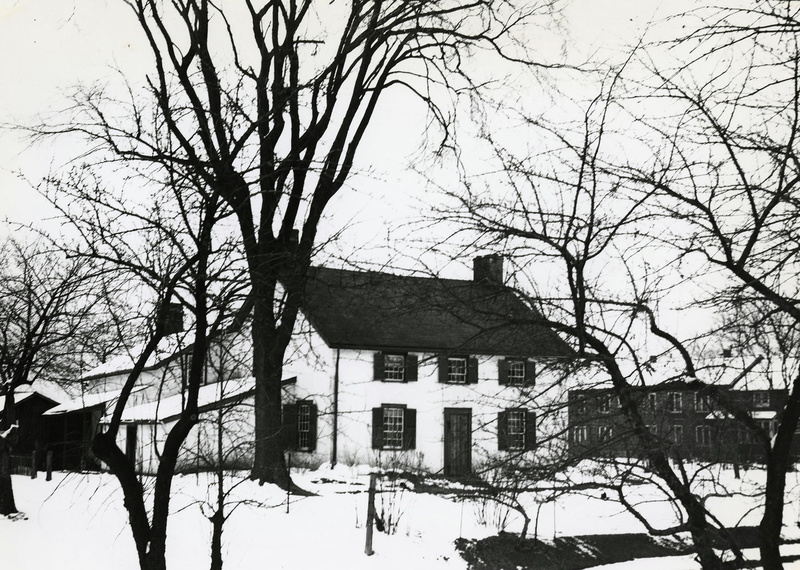 In the mid-1800s, the Belle Vue Estate was subdivided and town lots were put up for sale. Several marketing pieces at the time advertised the lots for sale. 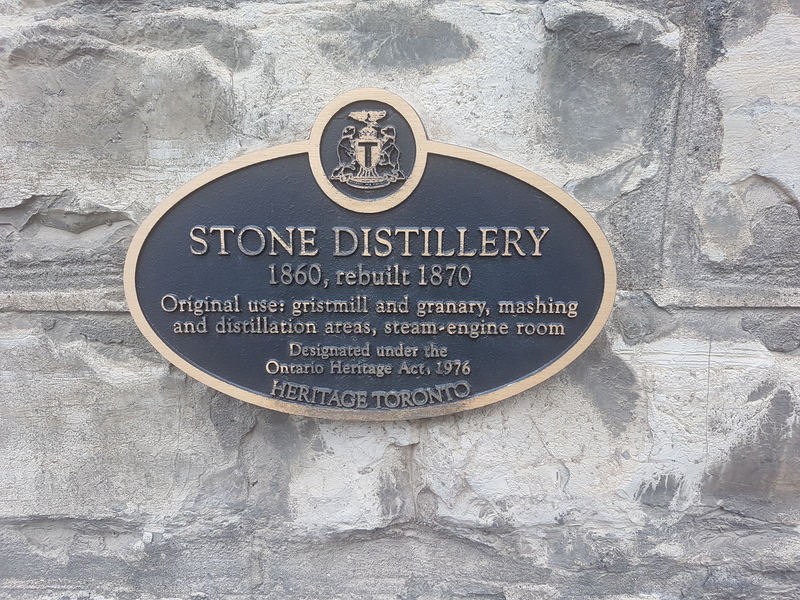 Notably, an 1854 pitch highlighted their location in “the most healthy and pleasant part of the city” at a great elevation from Lake Ontario. 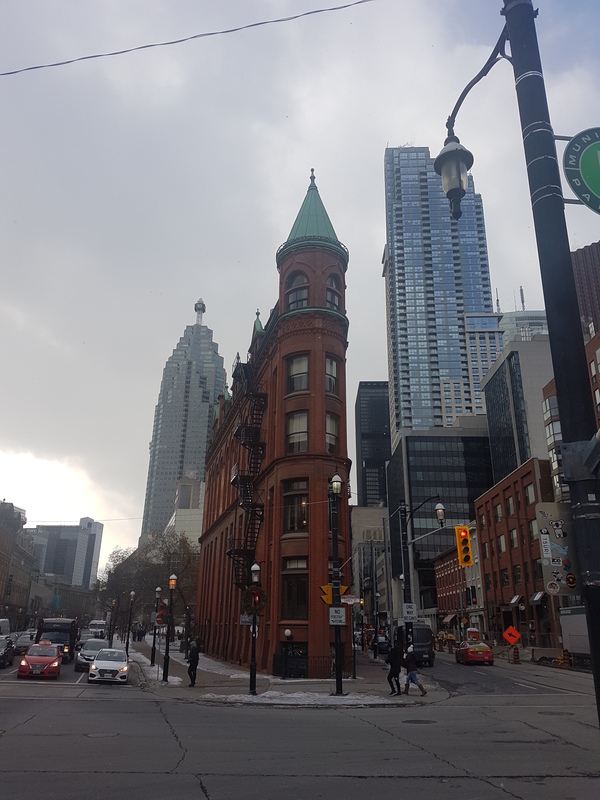 It also promoted the great proximity to the new Ontario Legislative Buildings and Government House, which as far as I know might have been proposed but were certainly never built (the current legislature opened in 1893). 1854 Plan of part of the city of Toronto showing the town lots on Bellevue for sale by the trustees for the Denison Estate March 1854. Credit: Toronto Public Library. 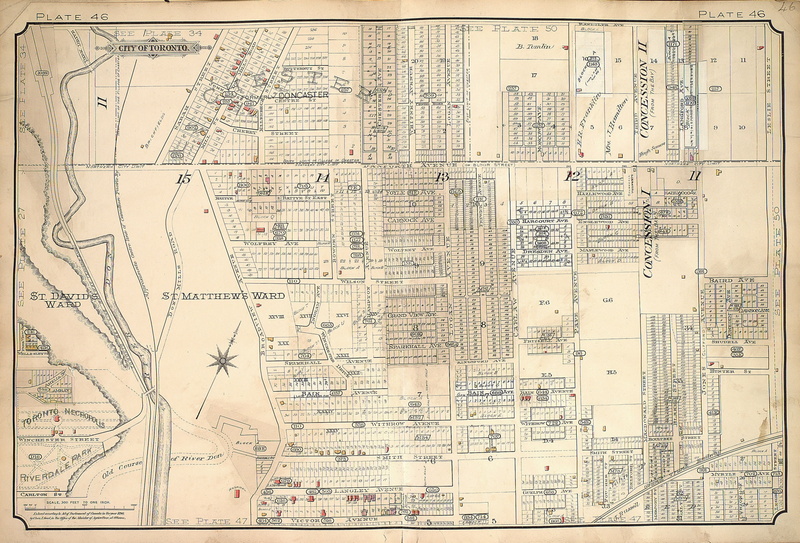 1869 Plan of building lots on part of the Belle Vue estate in the City of Toronto, the property of J. Saurin McMurray, Esq.. Credit: Toronto Public Libary. 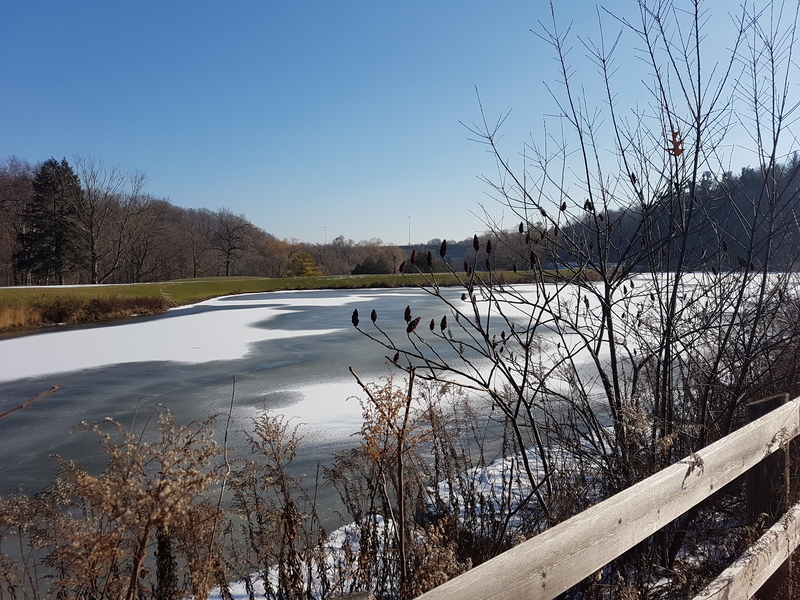 To make way for the residential neighbourhood, Russell Creek and its pond were buried in 1876, following a trend with other creeks in Toronto. Today, there is little trace of its existence. 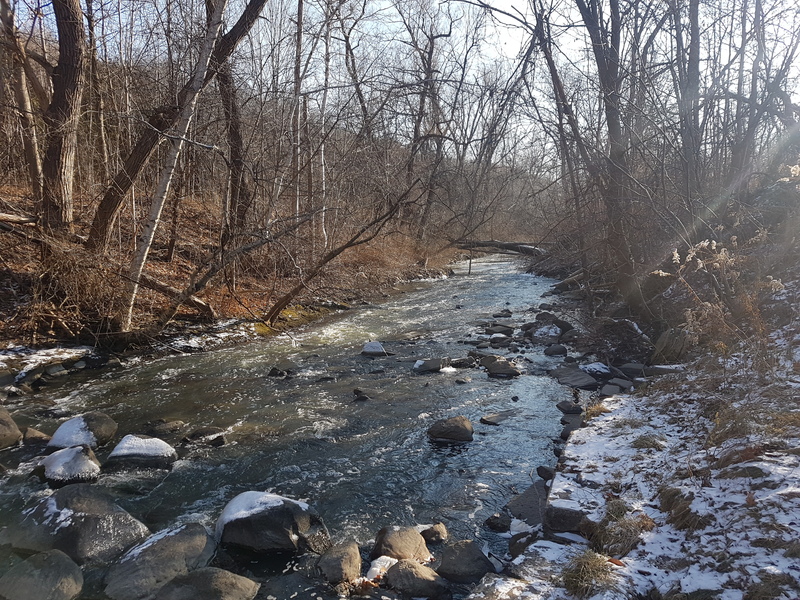 Compared to Garrison and Taddle Creeks though, Russell Creek seems to sit lower in the psyche and awareness of Torontonians as it is not as readily mentioned. Belle Vue would last for a few more decades, disappearing by 1890. 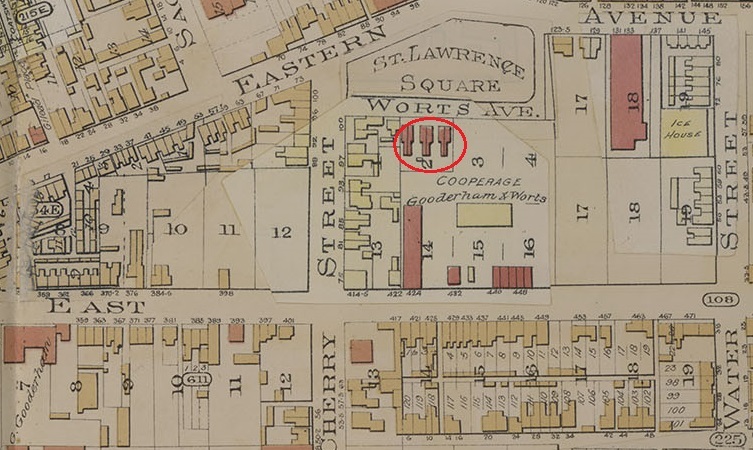 Strangely, it seems to shows up in the Goads fire insurance maps as late as 1903, however. It was replaced by houses and then finally the Kiever Synagogue in 1927. Although the house is gone, Belle Vue’s geographic imprint remains in a few locales. Bellevue Square, which historically served as the promenade grounds for the manor, was donated to the city as public space in 1887. Denison Avenue was the driveway to the grounds. The names of the streets themselves offer links to the Denison Estate and the English motherland in general with monikers such as Lippincott Street, Bellevue Avenue, Oxford Street, and of course, Kensington Street. 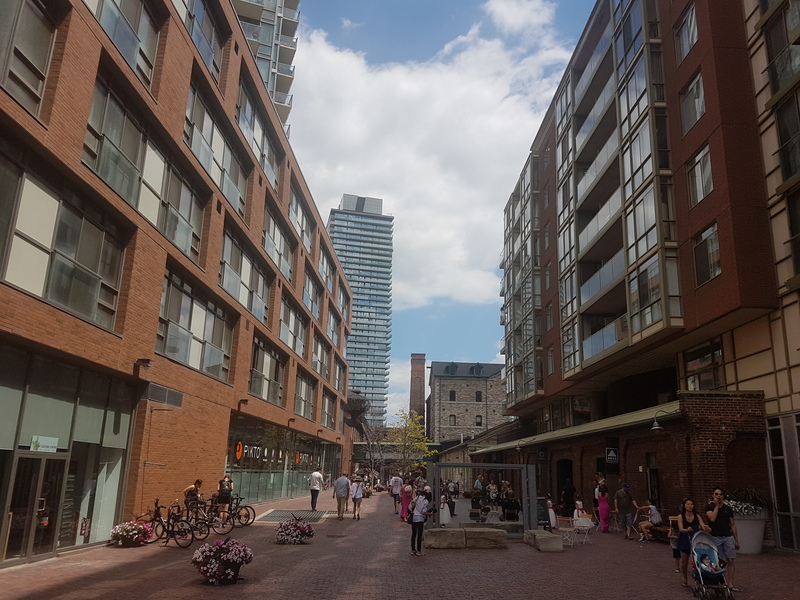 The latter is a throwback to the London commercial district of the same name (it is not clear who in Toronto drew the connection and offered the designation, though). Of course, there is also the Victorian housing stock whose architectural style by definition is referential to the reigning monarch at the time. The early occupants of the neighbourhoood were unsuprisingly of largely White Anglo-Saxon Protestant descent. What happened to some of these houses over the next few generations erased that early connection to Britain, however. Around the turn of the 20th century, the WASPs migrated to more favourable parts of Toronto. Finding opportunity and low rents, the Jewish community already situated in The Ward moved into those empty houses. 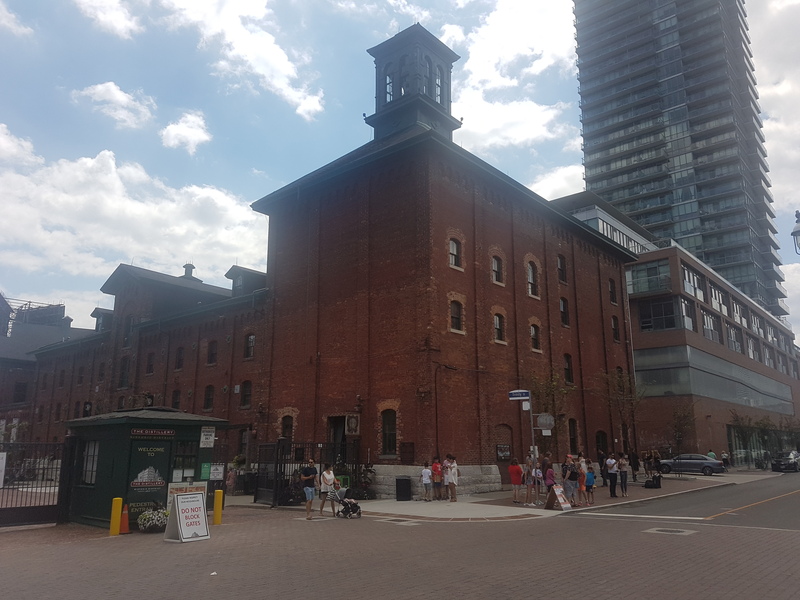 It’s a common story to Toronto: a group occupies a space, leaves after it outlives its utility, and then a new group moves in and remakes it accordingly. These East European Jews settled on Kensington, Augusta, and Baldwin Streets, not only residing in the former homes of their white predecessors, but also altering their fronts to accommodate commercial enterprise. And so began the ‘Jewish Market’. This ‘creation and re-creation’ happened over and over in Kensington Market. The Jews’ out-migration around World War II left their storefronts to other populations of Italian, Portuguese, Caribbean, and South & East Asian entrepreneurs, allowing new histories to be created. The former Sanci’s fruit shop was the first non-Jewish merchant in Kensington Market. There’s a cross in the brickwork atop the store hinting at the building’s roots. Baldwin Street, 1940s. Credit: Library & Archives Canada. The importance of Kensington Market in the lives of generations of Canadian immigrants led to its designation as a place of national significance and as a National Historic Site in 2006. In 2017, Historica Canada neatly and creatively distilled its layered history into its first animated Heritage Minute. 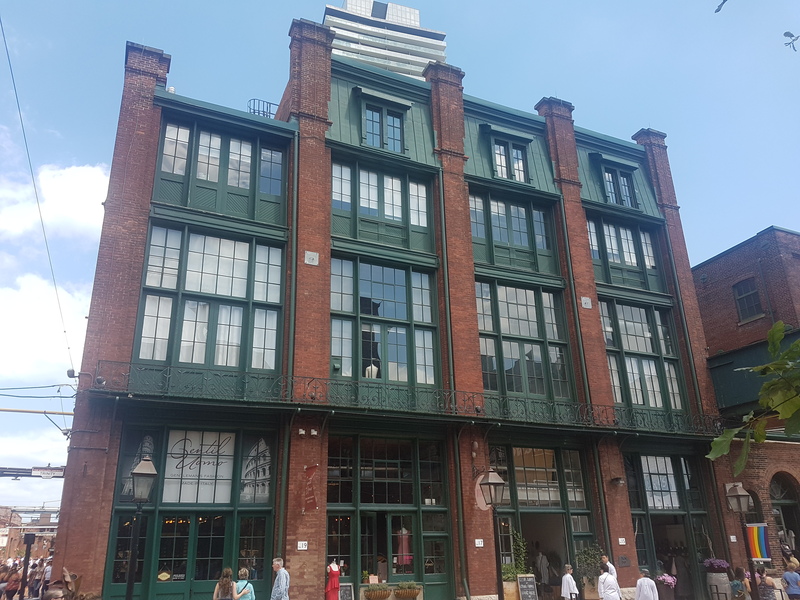 The clip nicely showcases the physical and cultural transformation of a shop through the decades, moving from the outside to the inside and back out again to show the masses of people who have frequented the Market through the ages. The grand narrative of Kensington Market has then been this intersection between tangible (geographic) and intangible (cultural). That is to say, the histories of the people within the same physical space they have all come to call “home” over the years. Many writers have explored the theme, including Na Li in her book Kensington Market: Collective Memory, Public History, and Toronto’s Urban Landscape. The original Victorian homes, as altered as it has become after generations of use and reuse, become vessels to tell these stories. 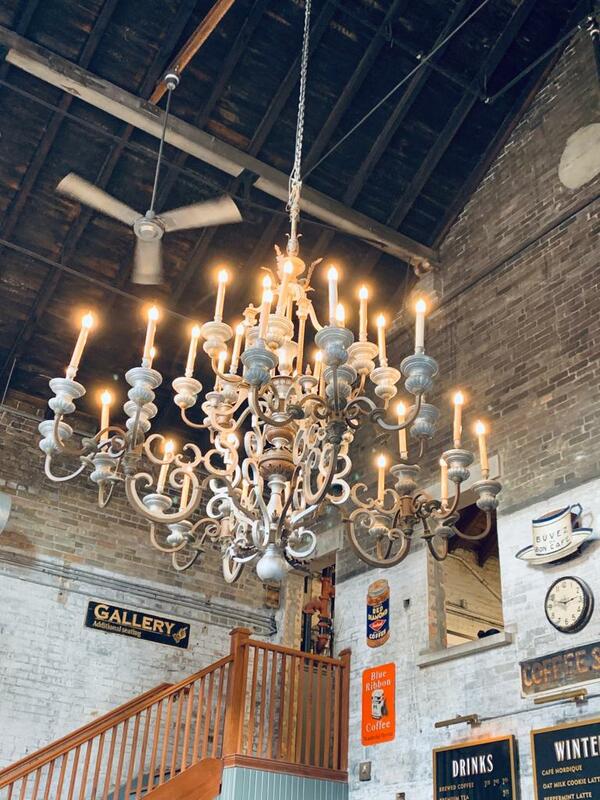 From the Baldwin family countryside to the cafe- and bar-filled nexus of today, Kensington Market’s evolution was unplanned, organic, and anarchic, and yet somehow still falling in line with what came before. It survived urban renewal plans in the 1960s whose purpose to preserve the neighbourhood would have actually destroyed it. The quirks in its murals, hidden backways, street sights, and people can only exist within its borders. It cannot be replicated. Eglinton Avenue is Toronto’s east-west midpoint. It is the only street in the city (although took some doing in the 1950s and 60s to make it so) that traverses all six former municipalities. This attribute has made it perfect for a crosstown transit line. 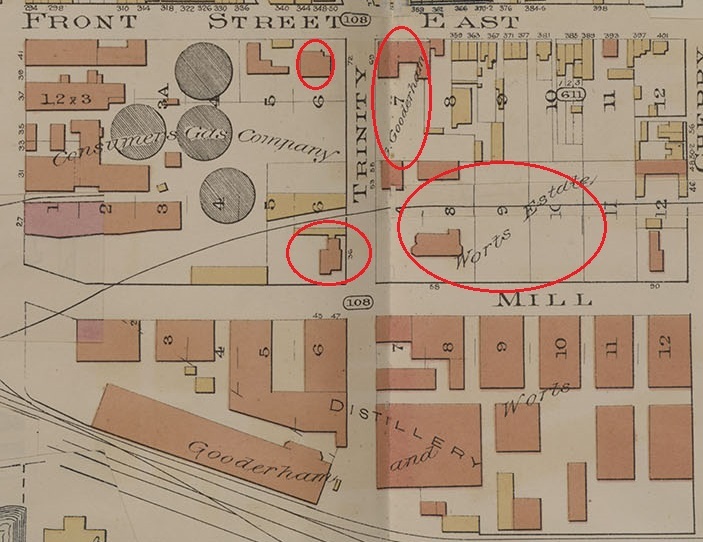 Although it was laid out in 1793 as the Third Concession from Lot (Queen) Street, I would argue that Eglinton’s form, at least from Yonge Street to Latimer Avenue, as we know it today does not begin to take shape until 130 years after it was laid out. Might’s correct city directory map of Greater Toronto, ca. 1940. 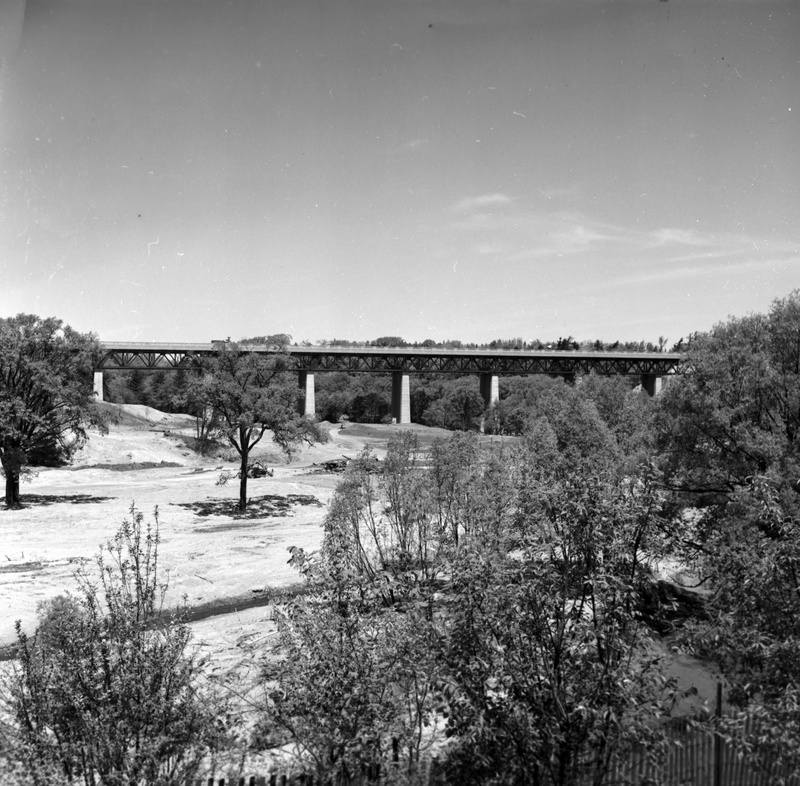 The extension across the Don River branches were completed by 1956. 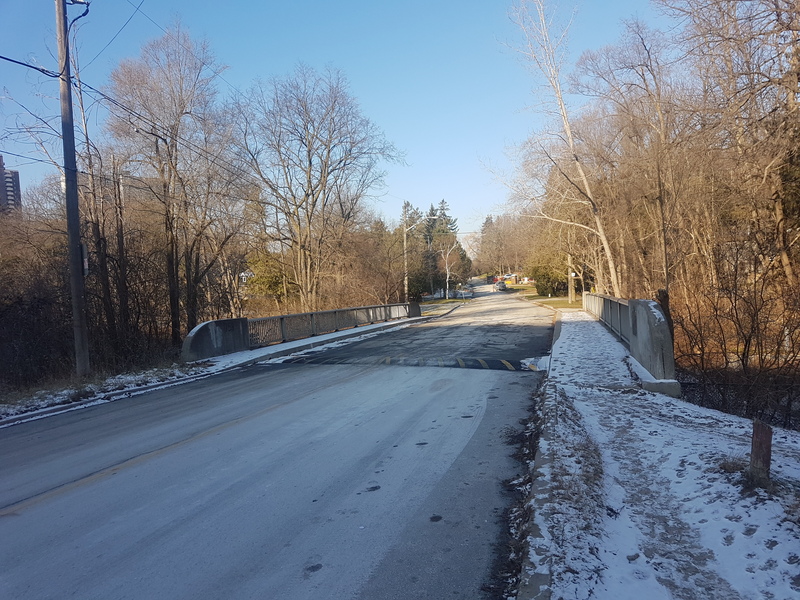 In 1967, Richview Sideroad in Etobicoke was absorbed into Eglinton Avenue when the two streets were joined via a bridge across the Humber River. Credit: Map and Data Library, University of Toronto. This stretch of Eglinton Avenue west of Yonge Street and the surrounding area was historically part of the Village of North Toronto. 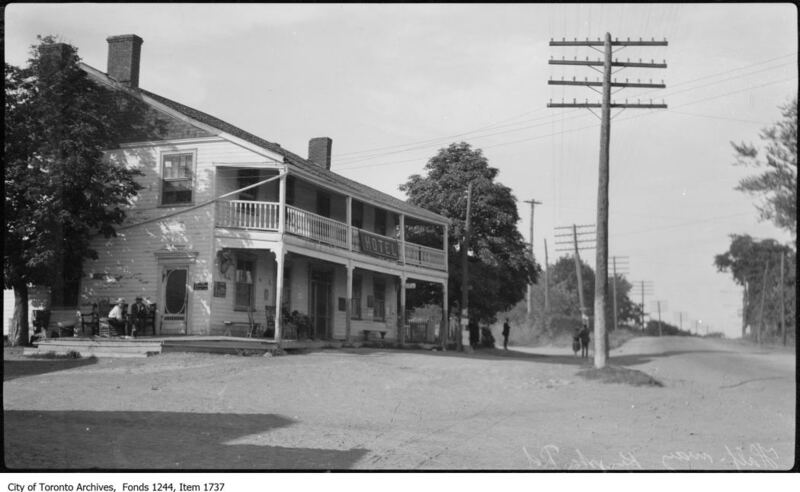 Even though the village was absorbed into the City of Toronto in 1912, allowing it to reap the benefits of better service delivery, the street was still a sparsely populated dirt road. 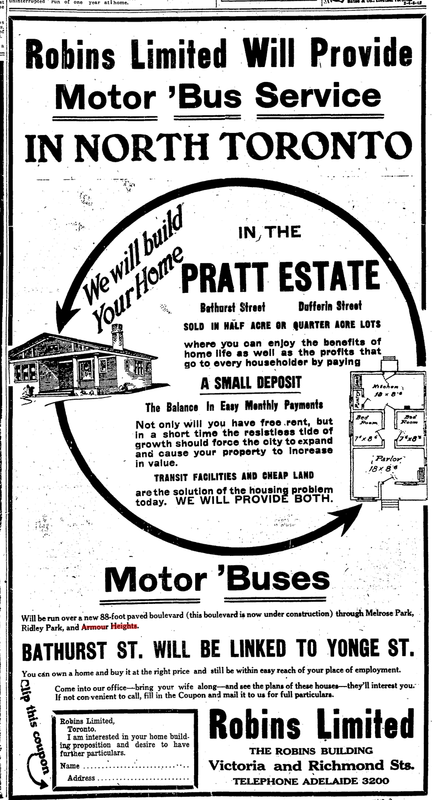 It wasn’t until the coming decades when Eglinton’s fields morphed into a mixed residential and commercial zone. By 1930, the road was paved and possibly widened. Eglinton Ave, west from Yonge, October 19, 1922. Fonds 16, Series 71, Item 1637. Eglinton Avenue west from Yonge Street, April 23, 1930. Fonds 1231, Item 1646. Credit: City of Toronto Archives. At Duplex and Eglinton stands a power station. 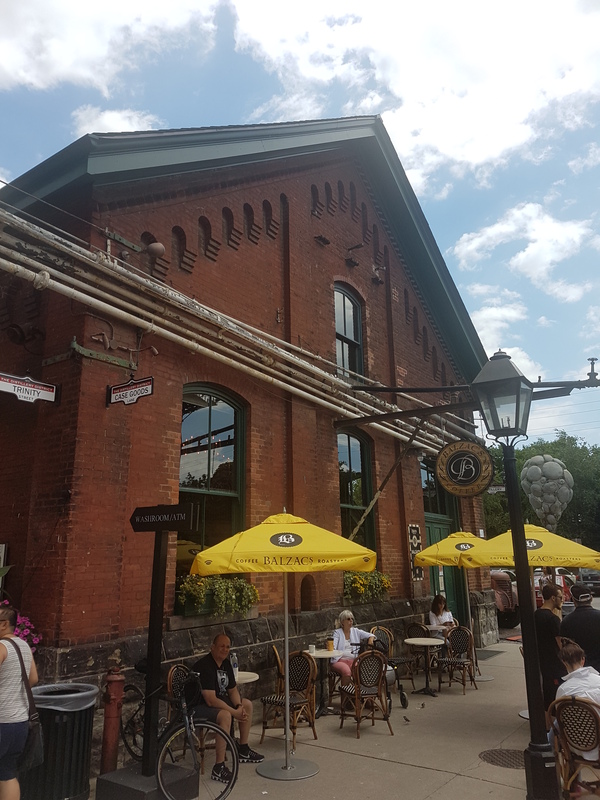 The yellow-bricked structure was built in 1920 at a time of rapid expansion in Toronto. 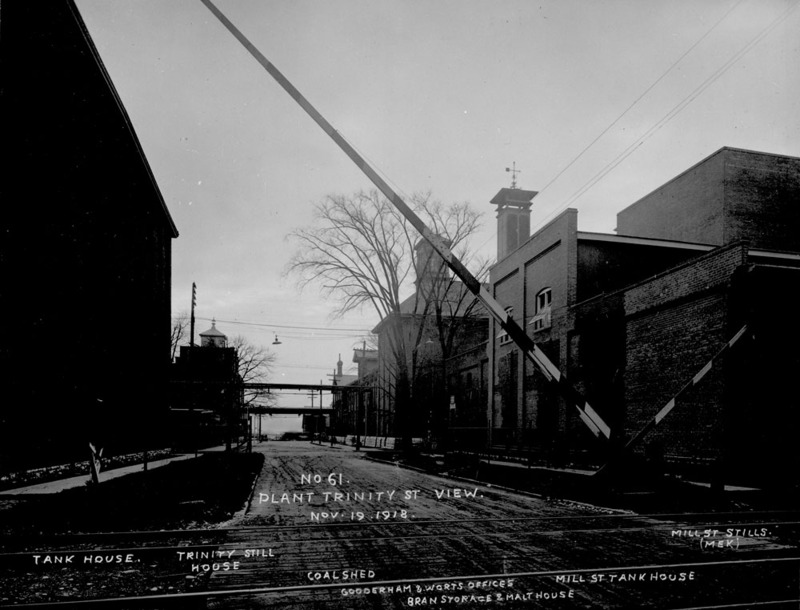 With the Toronto Hydro-Electric System (now known as just Toronto Hydro) becoming the only distributor of power in Toronto at the tail end of the 1910s, Toronto was experiencing the pressures of an electrified transit network and a growing population. Related, a short distance across from the station, there’s a row of mid-rise apartments. The positioning of these 1930s Art-Deco inspired buildings one after the other leads one to conclude that this was by design, although I wonder at their context considering the larger history the Toronto has with this kind of housing stock. 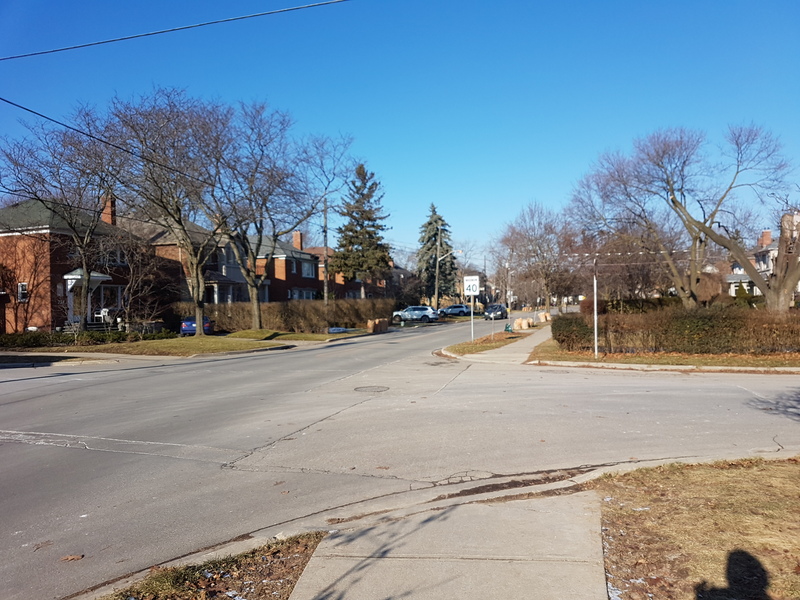 One historical narrative has been that whereas at the time the City of Toronto avoided this housing style, outlying communities like York and Forest Hill including them in their planning. 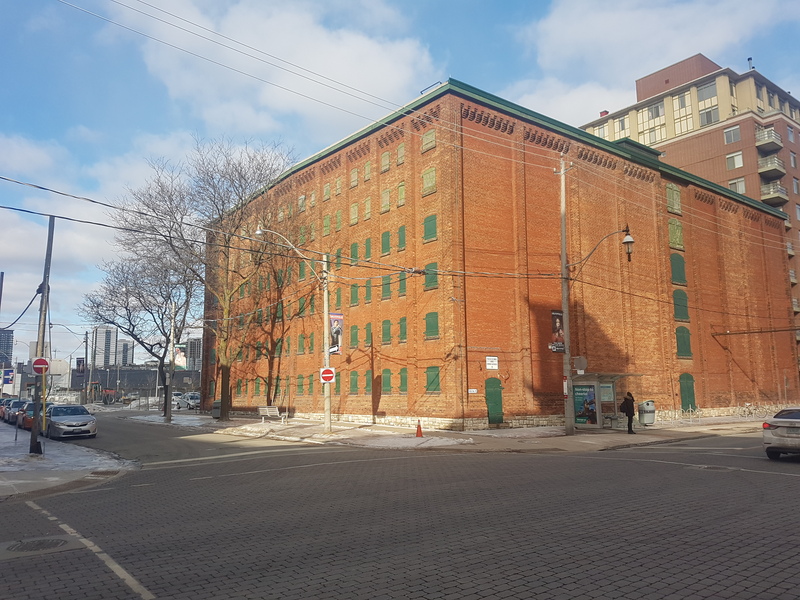 For example, a more prominent row of these decorative lofts exists further west on Eglinton near Bathurst Street in the former Village of Forest Hill. 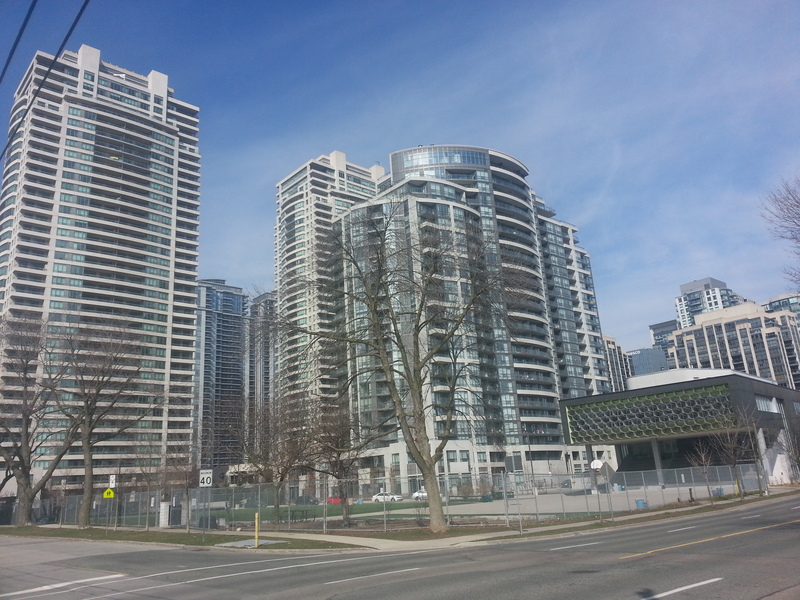 These ones close to Yonge would have existed on land already annexed to the city, though. Curious. 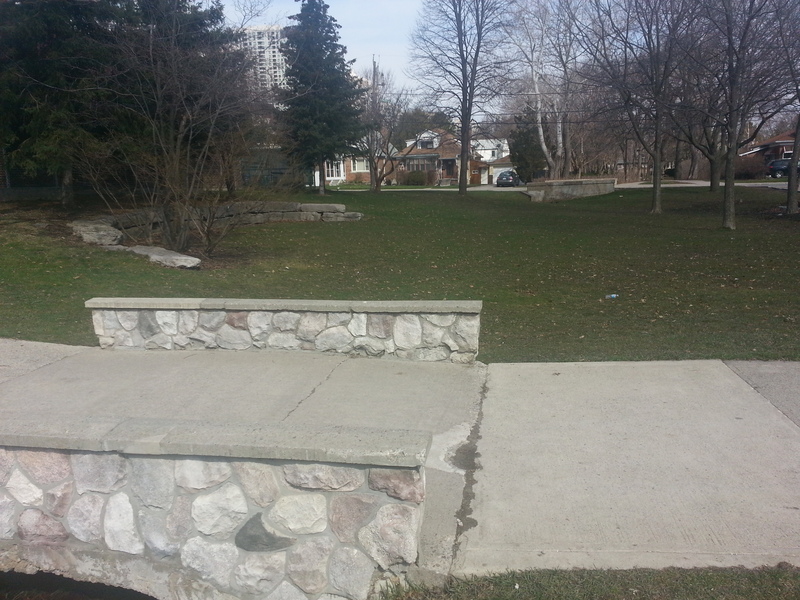 Next, Eglinton Park has a neat past. 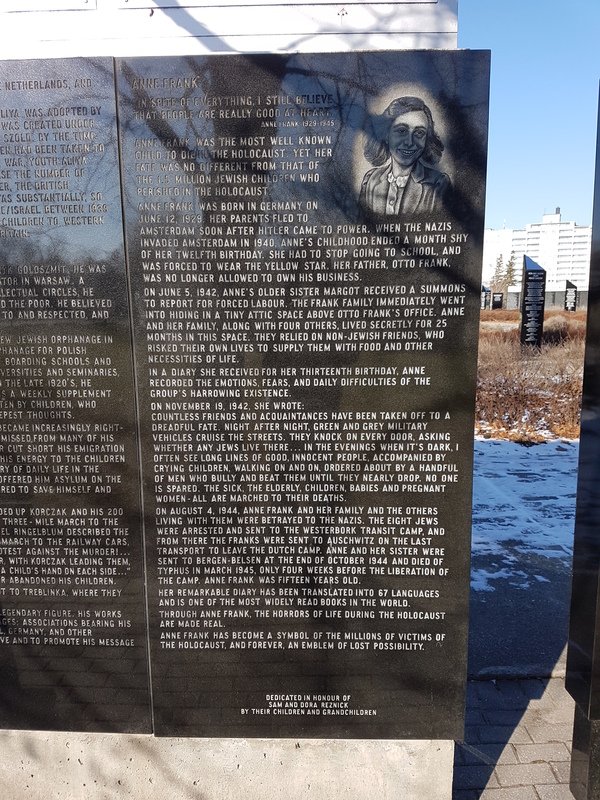 As Lost Rivers explains, long before its colonial period, Huron peoples occupied its land and the nearby area – notably, the site of Allenby Public School – in the 15th century. In more recent history, the park was a brickyard! Capitalizing on the clay beds created by the now buried Mud Creek, James Pears ran his establishment here beginning in the 1880s. 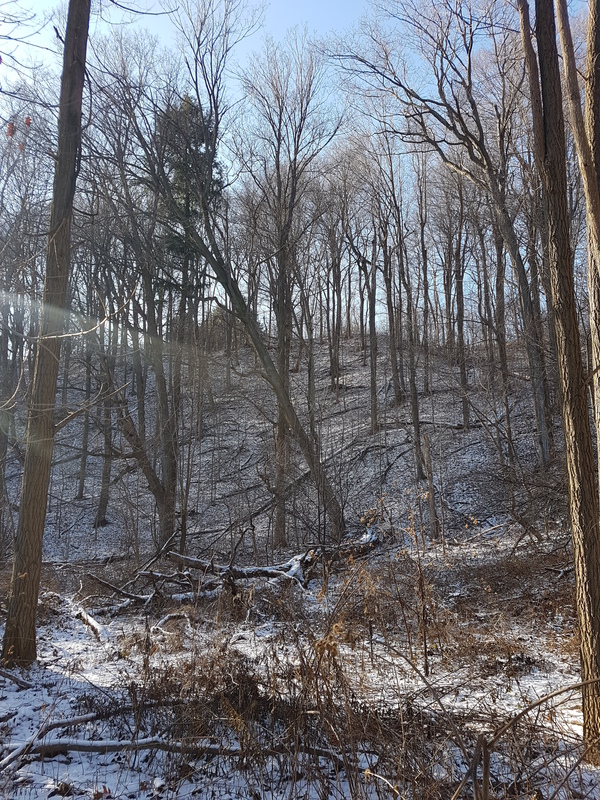 The modern geography within the park shows off the layers of time: the ‘dug-in’ escarpment leading up to Oriole Parkway, the hilly topography of Roselawn Avenue. Pears formerly worked out of today’s Ramsden Park in Yorkville before moving up Yonge Street, which has similar rolling features. These are the former lives of our parks. 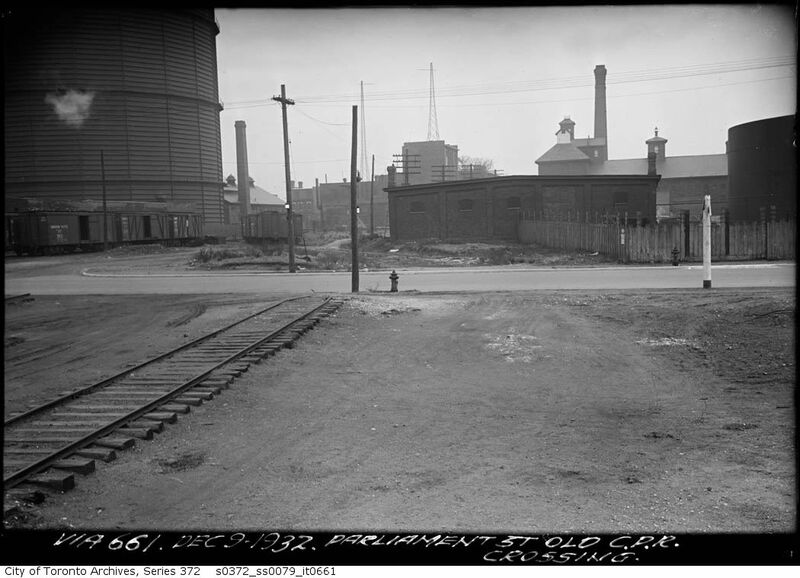 Later, with North Toronto annexed, the City of Toronto attempted to purchase the yard from Pears before outright expropriating it in 1922 when he refused. The entire exercise came at a time in the 1920s and 30s when the City’s Parks Department was expanding, creating parkland and accompanying infrastructure such as shelters, gazebos, and bandshells. In fact, the Toronto Archives has a wonderful collection of ink & pencil drawings as a part of an Architectural Drawings Scrapbook prepared by the Department of Buildings for the Department of Parks and Recreation. Eglinton Park (Roselawn Avenue) Shelter, August 12, 1930. Fonds 200, Series 372, Subseries 1, Item 934. Credit: City of Toronto Archives. Pears’ legacy did live on for a while as the space was unofficially known as Pears Park for a time (and still might be?). 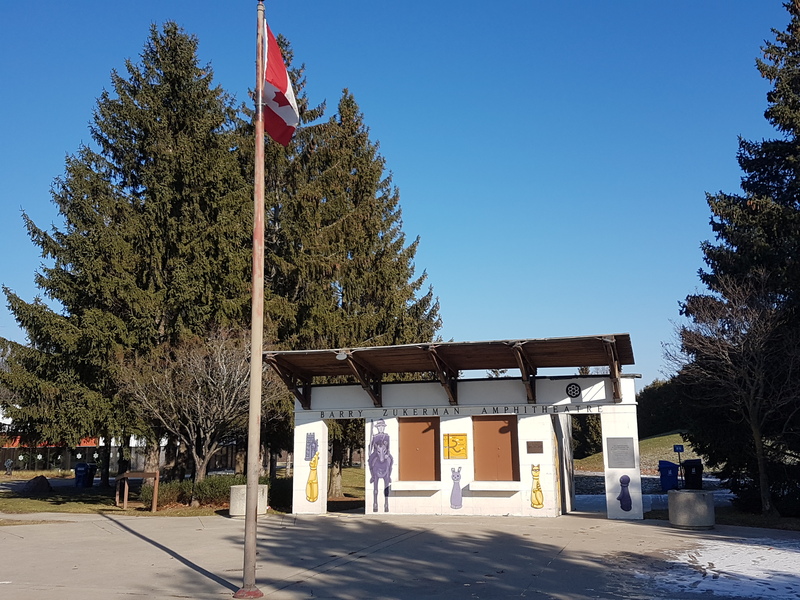 Modern amenities have been added to the park since then of course, including a community centre, playground, and a Cretan maze via the Toronto City of Labyrinths Project! A final sign of the street’s arrival was the eventual population of the street with commercial activity. 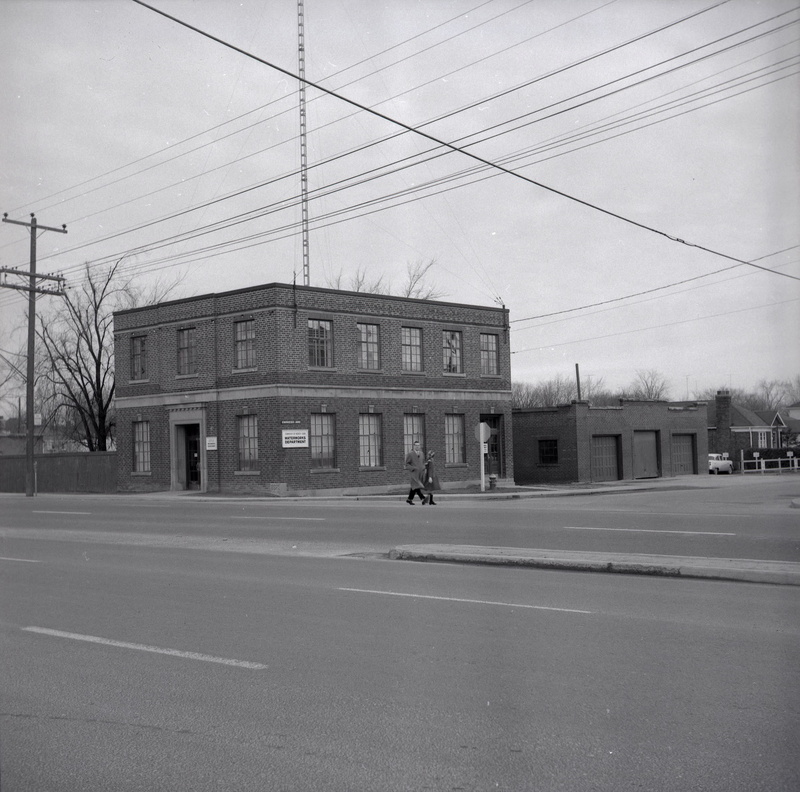 The north side of Eglinton east of Avenue was one of the first retail blocks, coming to us around 1930. CANATCO house index map of Toronto and environs, 1932. Credit: University of Toronto Map & Data Library. Eglinton Ave. north side Avenue Rd. looking east, April 23, 1930. 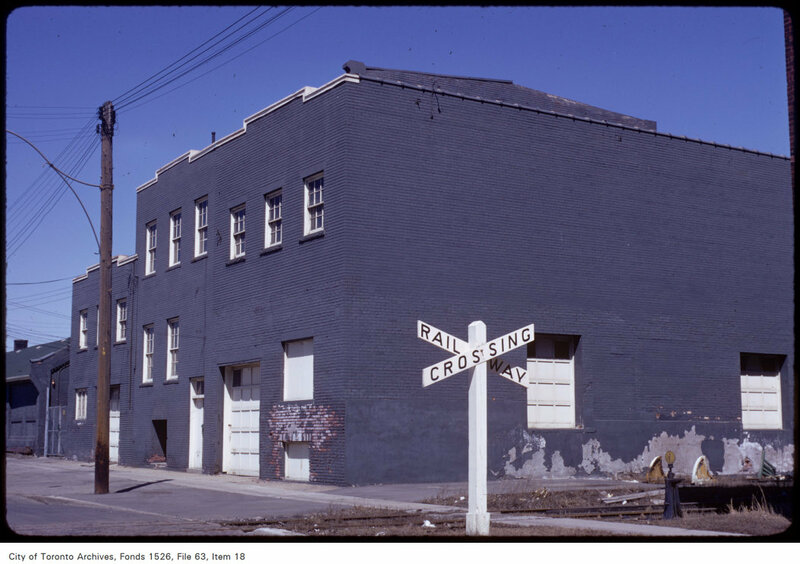 Fonds 200, Series 372, Subseries 58, Item 1223. Credit: City of Toronto Archives. With the opening of the Eglinton Theatre in 1936 to serve the growing local community, another commercial dimension was added. Neighbourhood theatres were abundant in Toronto by World War II, but The Eglinton was a benchmark in grandeur. Whereas other ‘nabes‘ were more low-key in aesthetic, the Kaplan and Sprachman-designed Art Deco movie house and its neon-lit tower announced itself on the commercial strip. It’s amazing considering this was also during the Great Depression. It was operational until 2002, remarkably late in the history of comparable theatres. Today it’s the Eglinton Grand. Outside of a McDonald’s and 7-Eleven at Yonge and Sheppard, there’s a blue plaque. 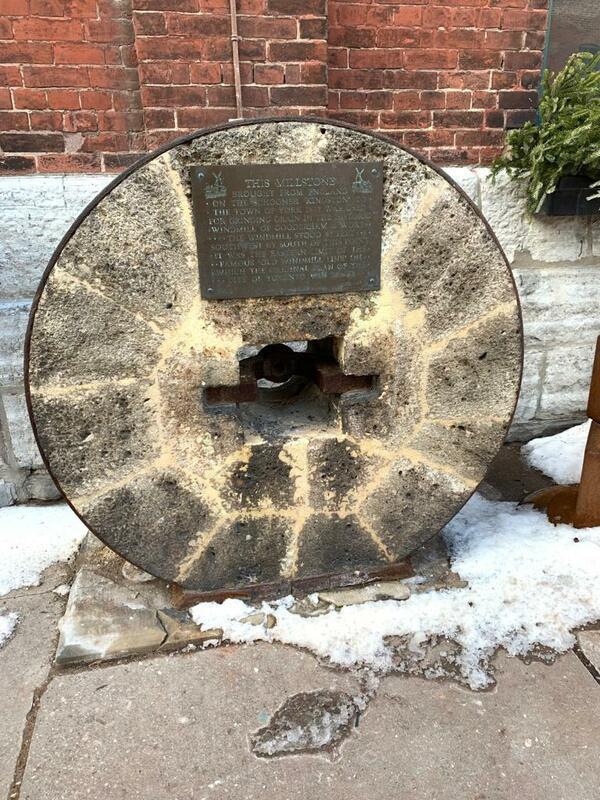 The City of Toronto and TTC marker commemorates the 1860 Joseph Shepard/Dempsey Brothers Store which once stood at this site. 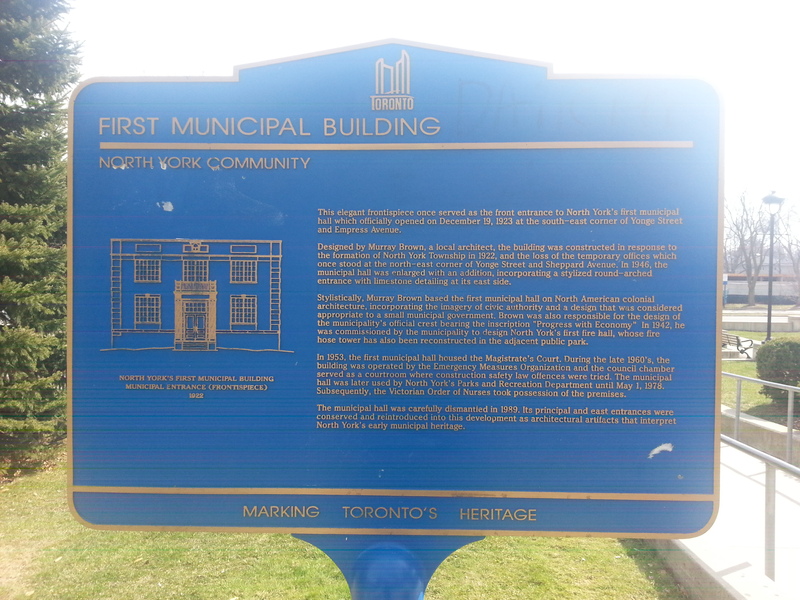 The plaque tracks the building’s history as a nexus in the historic Lansing community – from the residence of the pioneering Shepard family (for which Sheppard Avenue is named) and post office which gave birth to Lansing to the long-standing hardware store of the Dempseys. 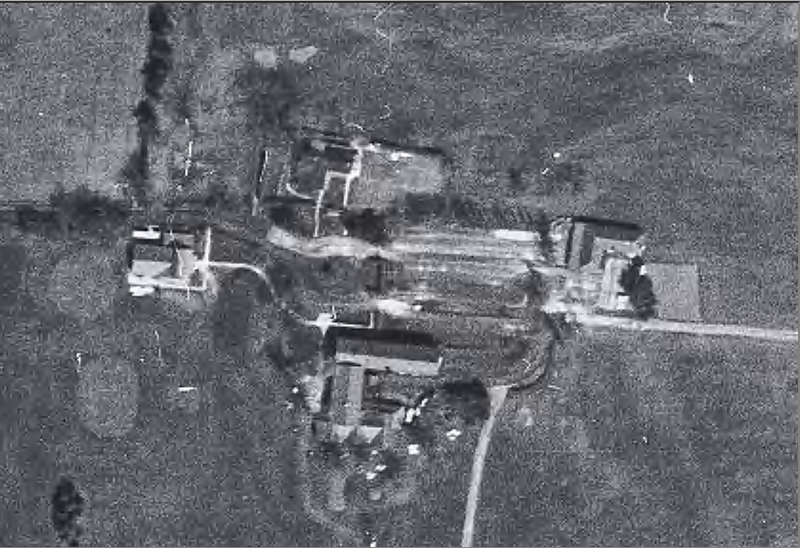 The funny thing is the building still exists – just not here. The store was transplanted to Dempsey Park on Beecroft Road in 1996. Yonge Street looking north at Sheppard Avenue, 1911. Joseph Shepard House/Dempsey Brothers Store at left. Source: Toronto Public Library. 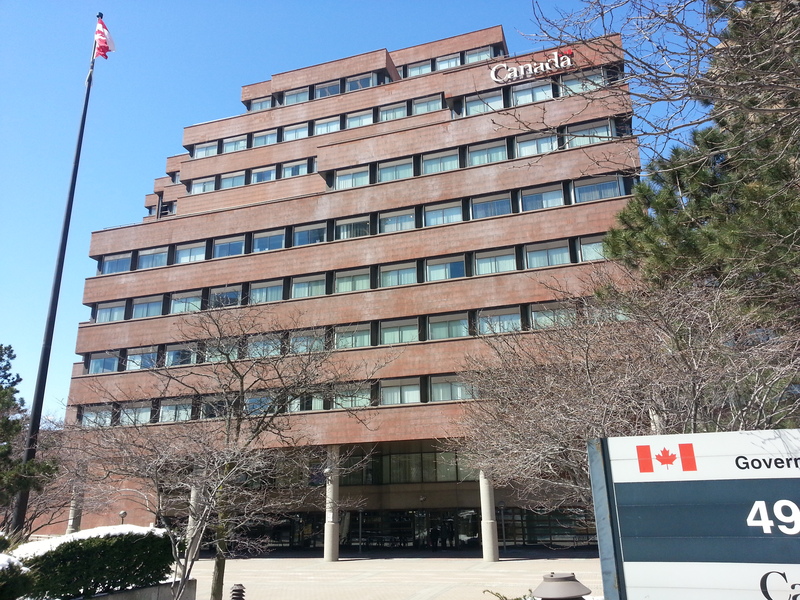 Nearby, the Joseph Shepard Government Building, built in 1977, also pays tribute to Mr. Shepard (albeit, sometimes spelled with inexplicably added “P”). 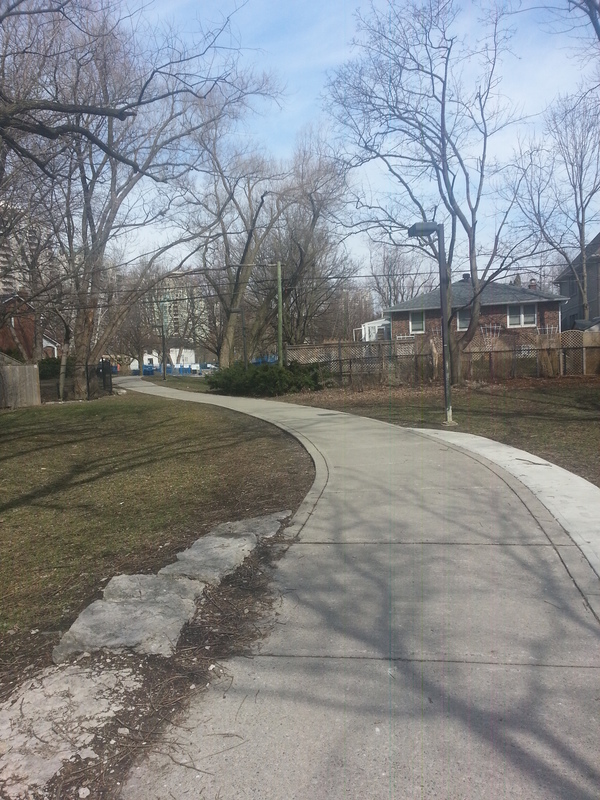 Despite running parallel to it only 300 metres to the east, Doris Avenue is noticeably more quiet than Yonge. It offers a great view of its tower-filled skyline. 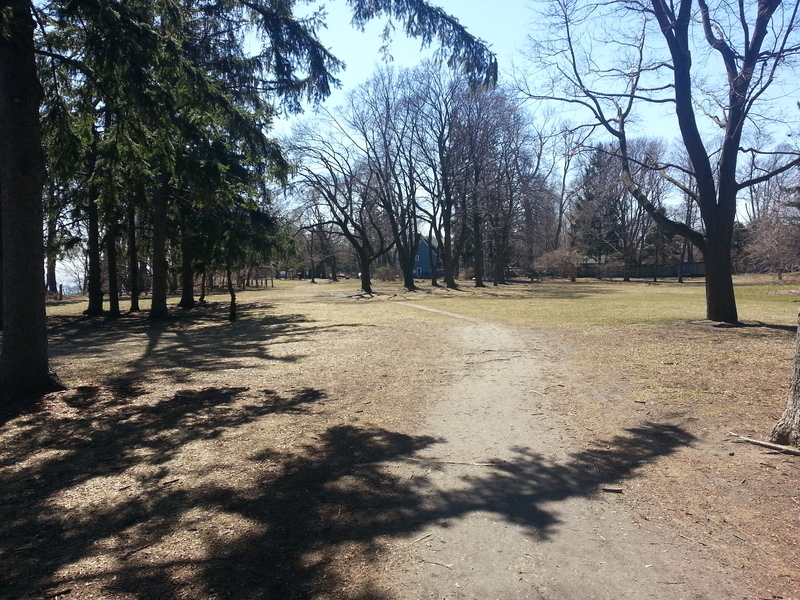 Also on Doris: Willowdale Park. In addition to a large central space with tennis courts and playgrounds, a curving path continues north, crossing a few residential streets. The linear park is a little peculiar to me – until I realize that the indent in the land and the sewer grates probably signify a buried waterway. As it turns out, Wilket Creek flows under Willowdale! 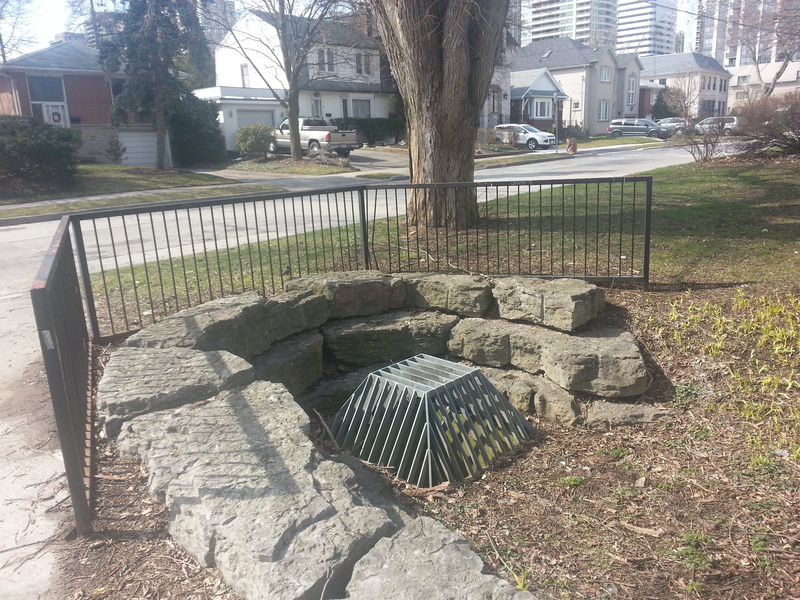 A section of the creek running northwest from York Mills and Bayview was buried and put into storm sewers in the early 1970s. 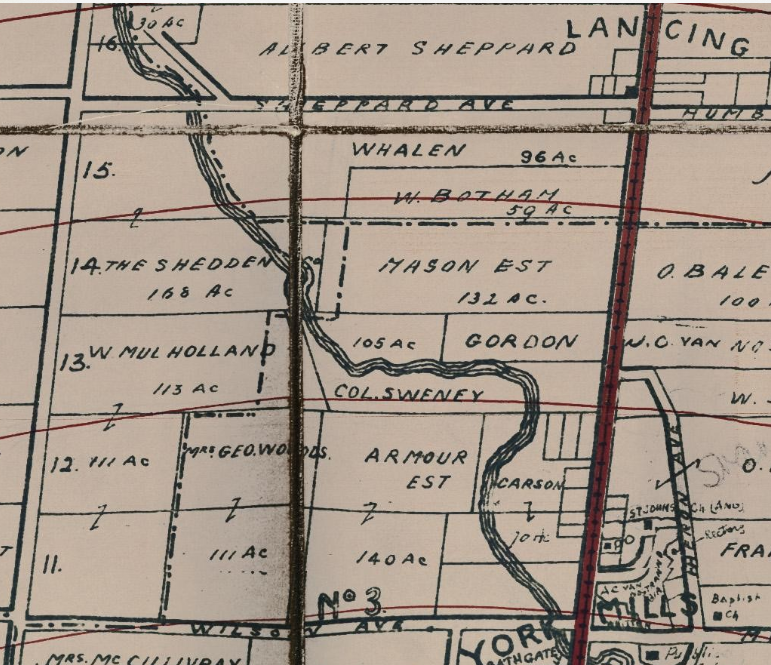 Lansing & Willowdale from the Map of the Townships, York, Scarboro, and Etobicoke, 1916. Source: University of Toronto Map & Data Library. Lansing & Willowdale, 1966. Source: City of Toronto Archives. 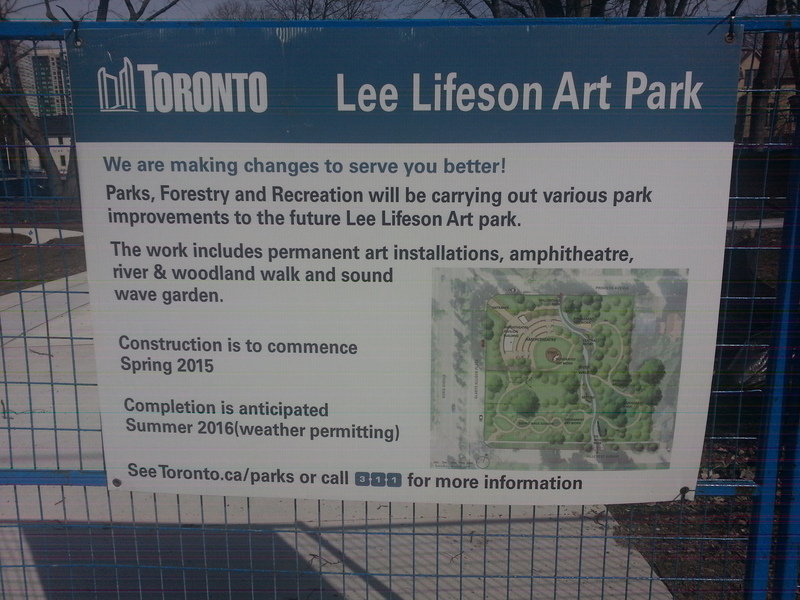 Another surprise in Willowdale Park: Lee Lifeson Art Park! 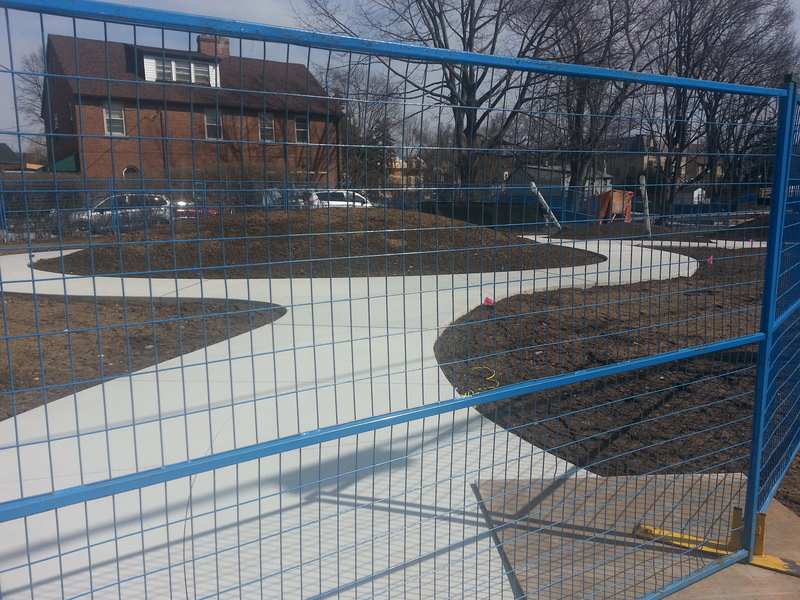 The soon-to-be art and green space honours founding Rush members and Willowdale natives, Geddy Lee and Alex Lifeson. 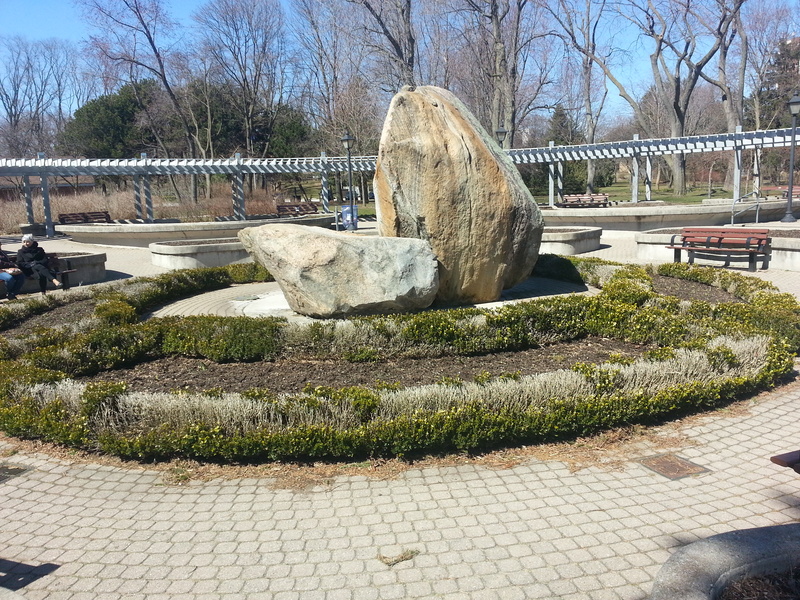 The park was conceived by the local city councillor and voted on in 2014. Construction began the following year. 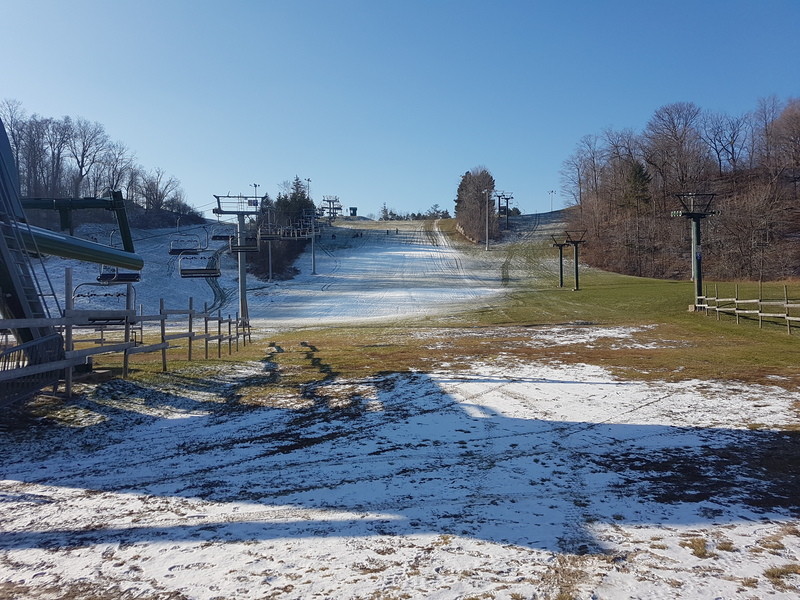 It – river and all – awaits opening some day. Across the street, Princess Park looks like a grand courtyard leading up to 1999’s Empress Walk mall and condos. It’s probably my own impression, but something about it seems a little too “planned”. I suppose it functions well for a park, though: things to see, places to sit and linger. 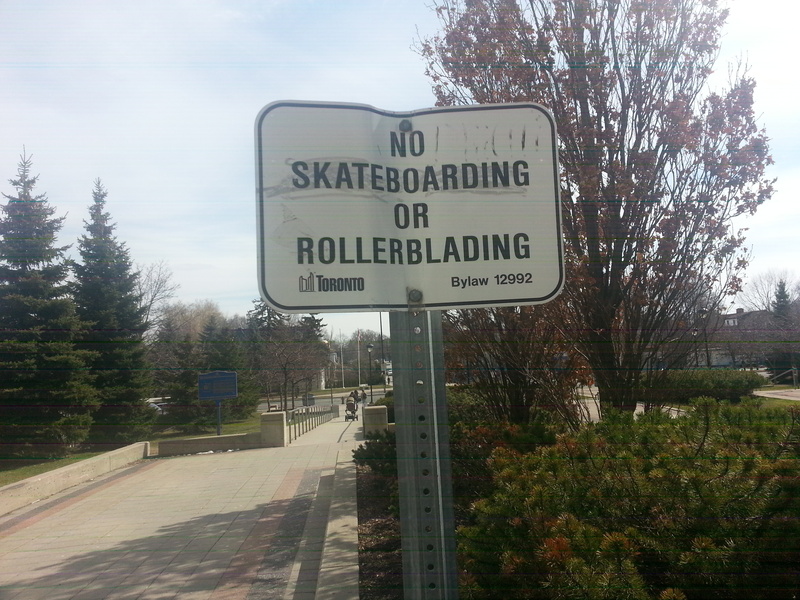 No skateboarding, however. 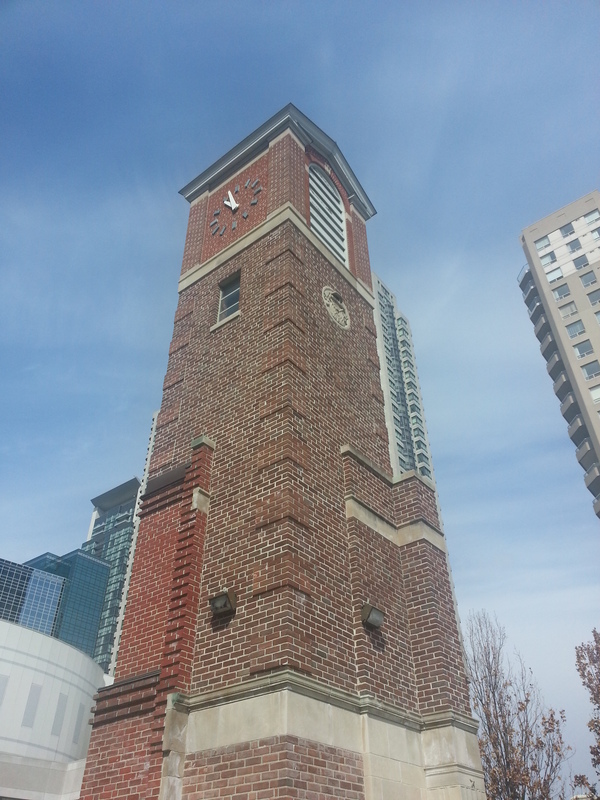 The focal point is a restored hose tower, part of North York’s First Fire Hall. 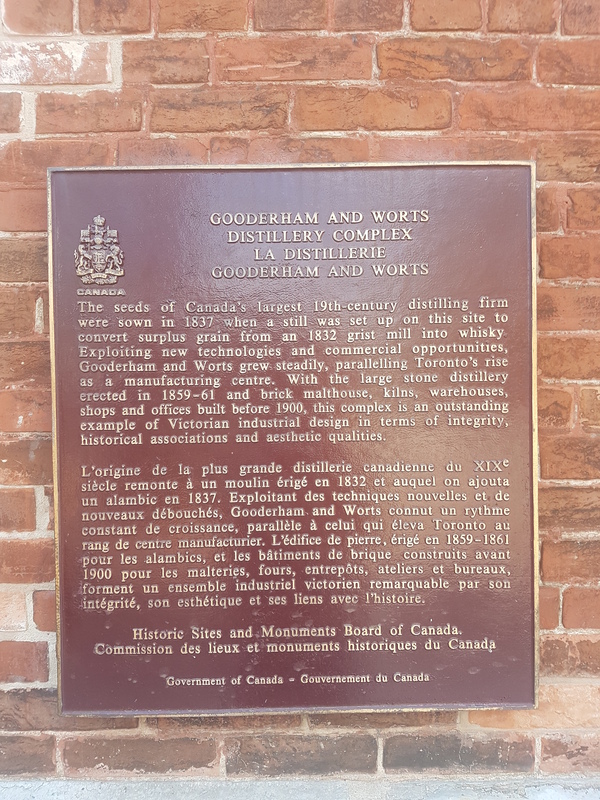 A plaque dates it to 1941. 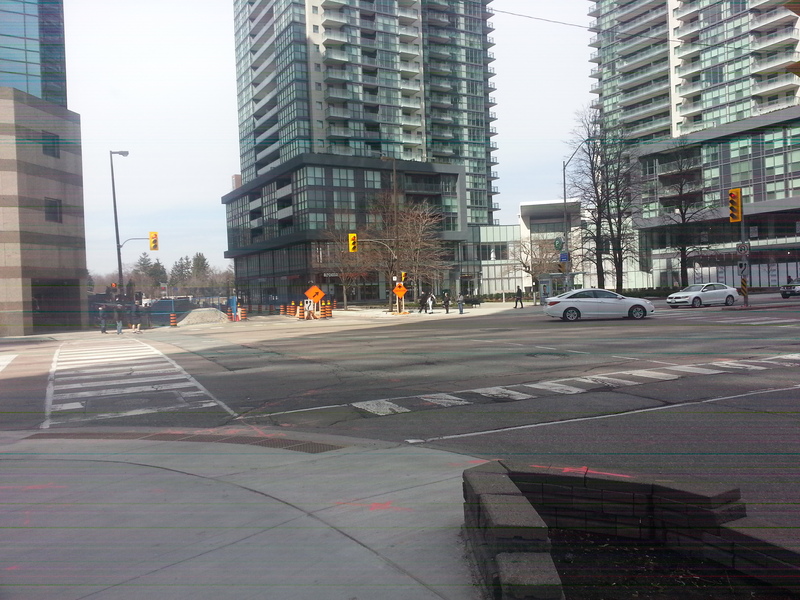 It was moved here from Yonge & Empress. 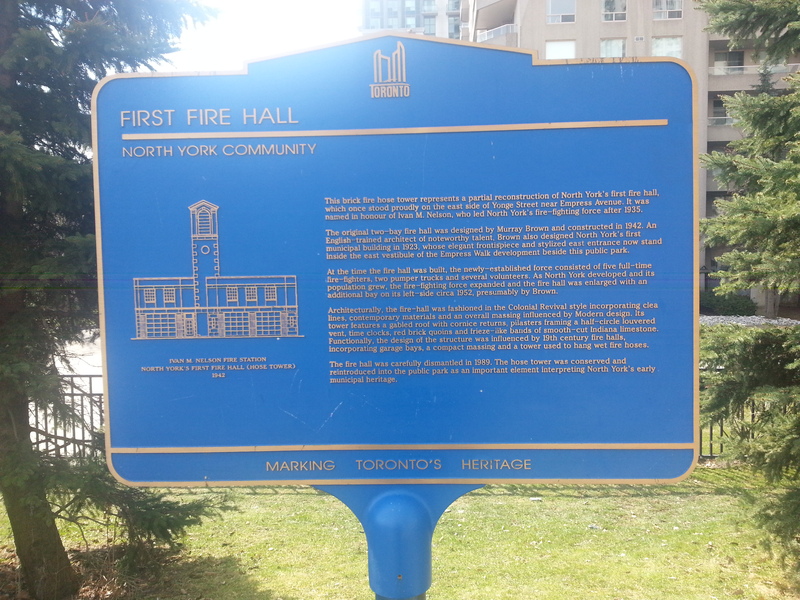 A second plaque tells the story of North York’s First Municipal Building, completed in 1923 on the south east corner of Yonge and Empress. The building is largely gone, but its facade was built into the mall’s eastern entrance. There’s also a floor tile with what looks like a plow. An homage to Willowdale’s farms. 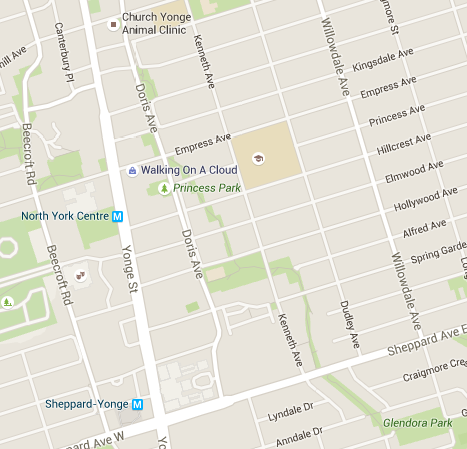 If one thing comes out of Princess Park, it’s that Yonge and Empress was a historic nexus. But you’d never know it. 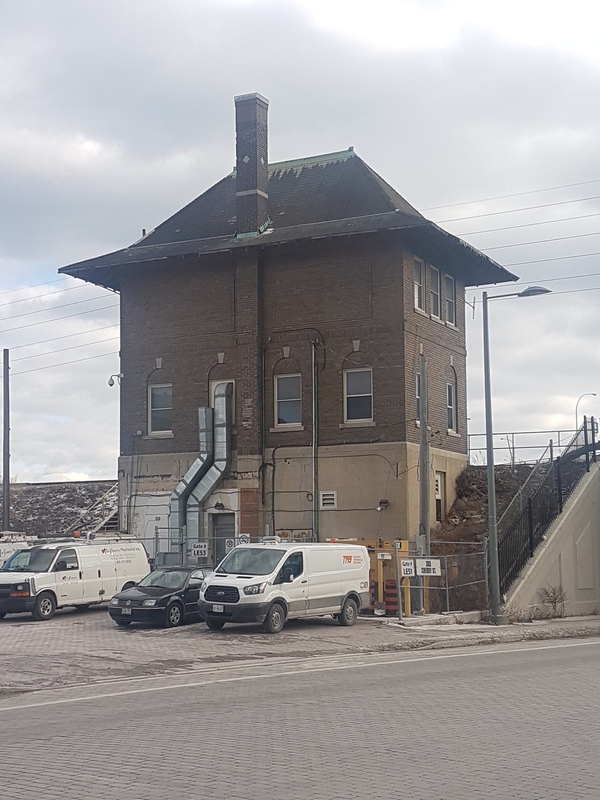 As is the case with Dempsey Store, it’s great that the fire hall and civic building still exist in some capacity, but the transplanting of the buildings and plaques away from Yonge Street literally pushes heritage to the side. Their context is diminished. 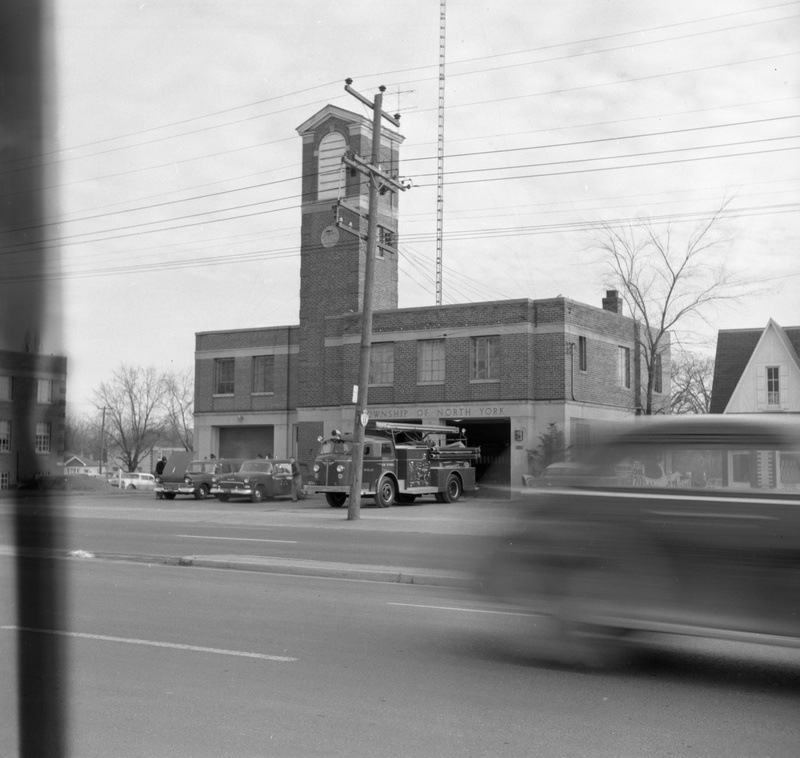 North York Fire Hall, Yonge Street, 1957. Source: Toronto Public Library. North York Municipal Offices, Yonge Street, 1957. Source: Toronto Public Library. The intersection is surrounded on three sides by towers and the mall. On the remaining corner: a much more modest two-storey shop. A cornerstone dates it to 1929. Uptown Yonge has a few of these tiny older stores mixed in with the towers, but the street doesn’t have the character of downtown Yonge, whose history as a retail strip still prevails even among intensification. 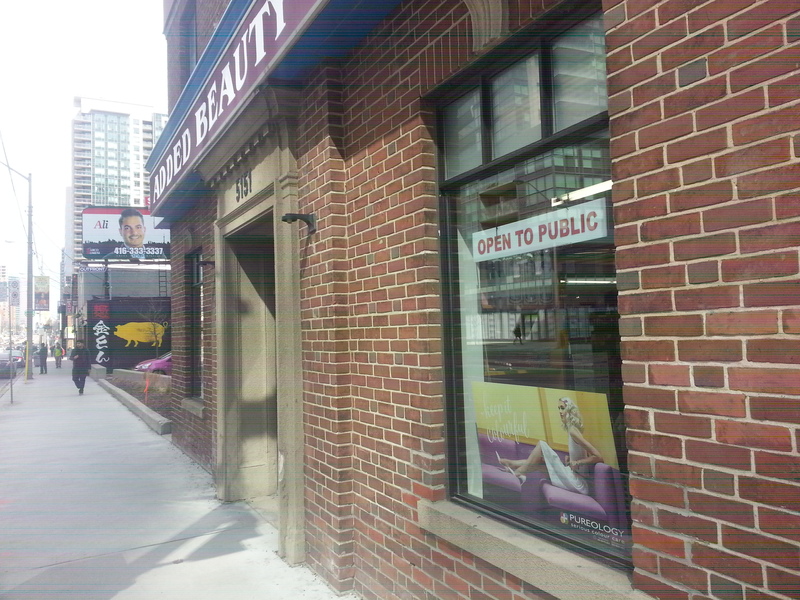 The store, a beauty supply shop, was oddly enough the North York Waterworks. Again, you wouldn’t know it. A parking lot surrounds the building; one wonders how long it will last before another condo takes over the corner. 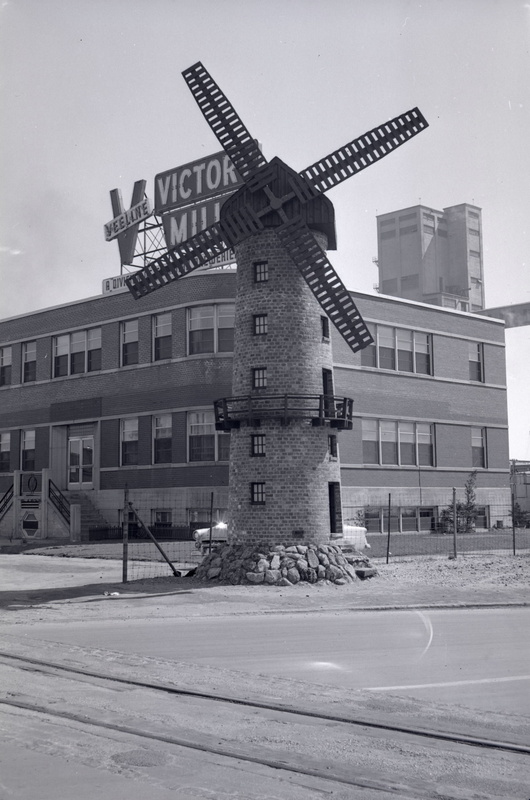 North York Waterworks, Yonge Street, 1957. Source: Toronto Public Library. Finally, on Parkview Avenue, there’s the John McKenzie House, a beautiful Queen Anne/Edwardian/Arts and Crafts farmhouse built in 1913. 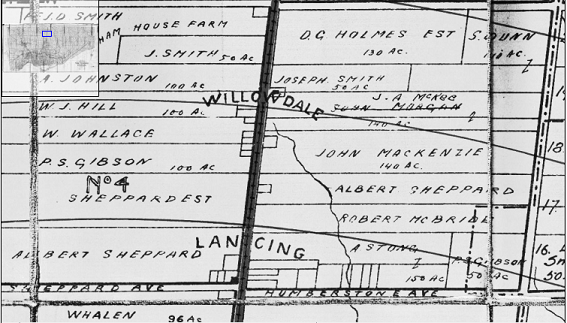 The McKenzies were pioneers in Willowdale who in 1884 purchased a portion of land from the Cummers, the original European settlers of Willowdale in 1797. The McKenzie farm came to amass some 140 acres from Yonge to Bayview. 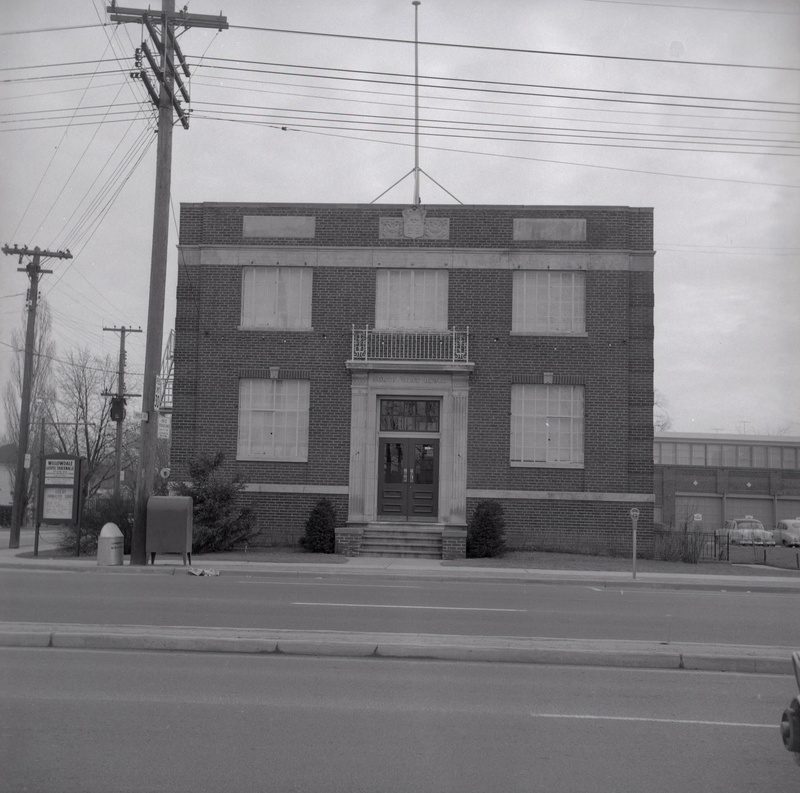 In 1993, the Ontario Historical Society took the house on as their new headquarters, saving it from demolition. 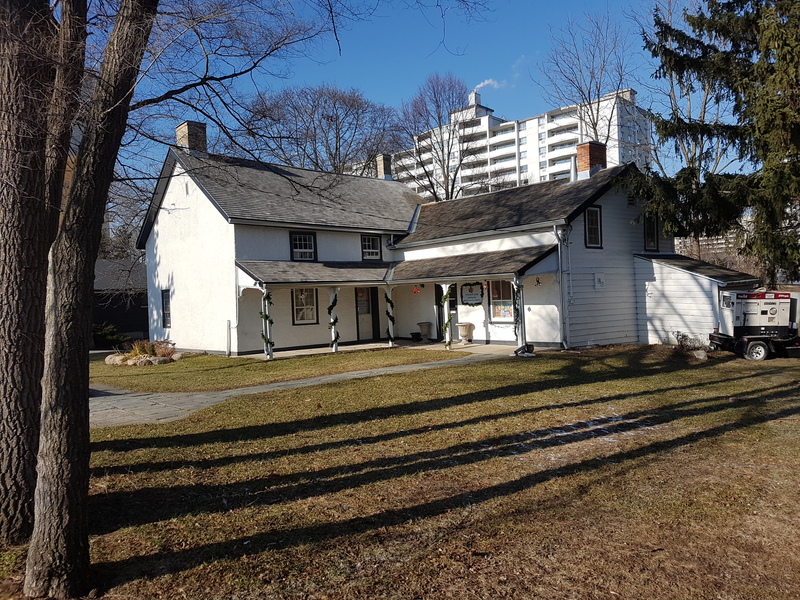 Before moving in, the City of North York agreed to fund the $600,000 restoration of the heritage house. 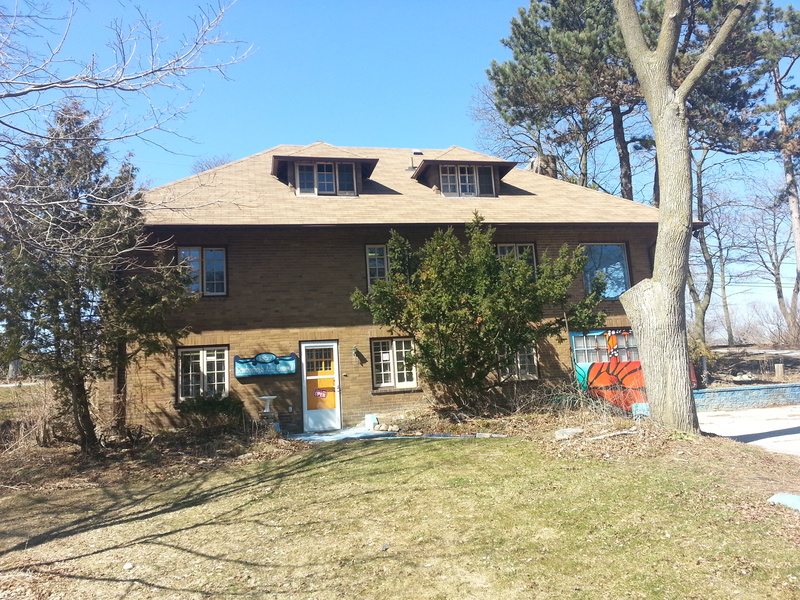 In 2016, the John McKenzie House is getting a new roof. 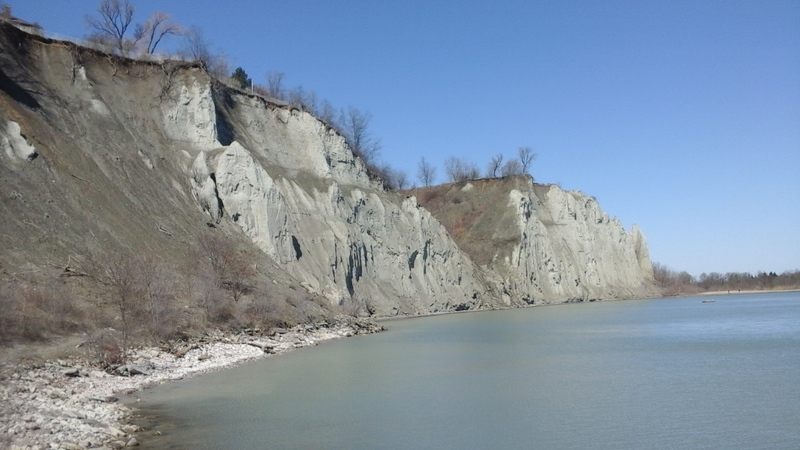 The Scarborough Bluffs are Scarborough’s claim to fame and claim to name. 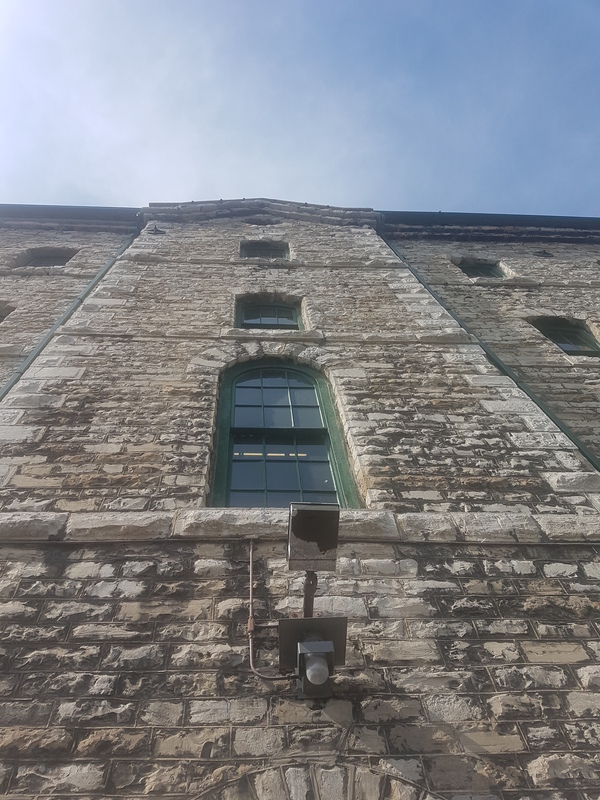 Although the southern part of borough and its winding main streets are another world to me personally, I know that in the general consciousness of Torontonians, the Bluffs usually come up in Scarborough word association. Or, at least, they should. 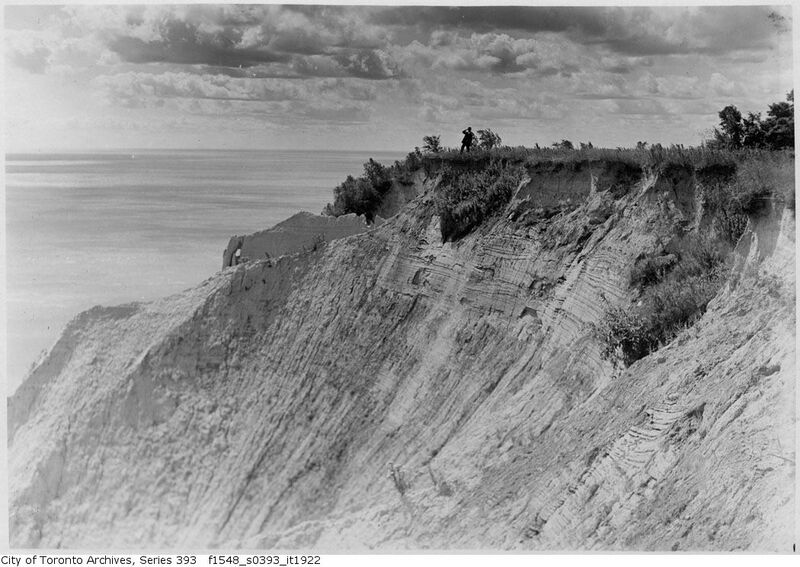 The built form of the southern end of Scarborough is a result of the Bluffs, including Kingston Road, whose course roughly follows the top of the landform. Laid out in 1817, it is one of the oldest European routes in the borough. In a pre-401 world, Kingston Road was the highway in and out of Toronto from the east. Its existence made it ideal for hotels and inns to aid travelers in their voyages. Some motels still dot the street today. 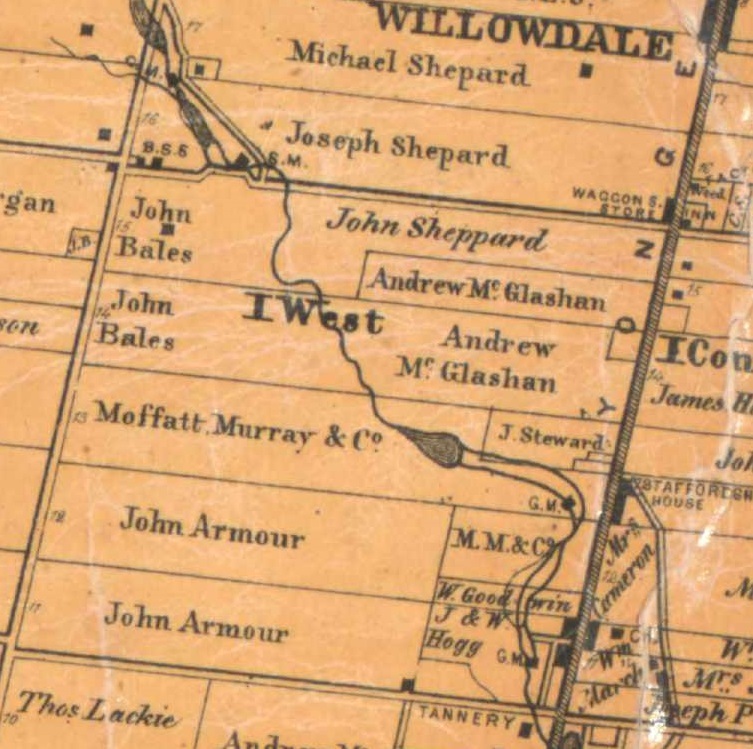 Map of Scarborough Township, c. 1916. Source: University of Toronto Map & Data Library. Halfway House, Kingston Road & Midland Avenue, c. 1920. The building is currently situated at Black Creek Pioneer Village. Source: City of Toronto Archives. 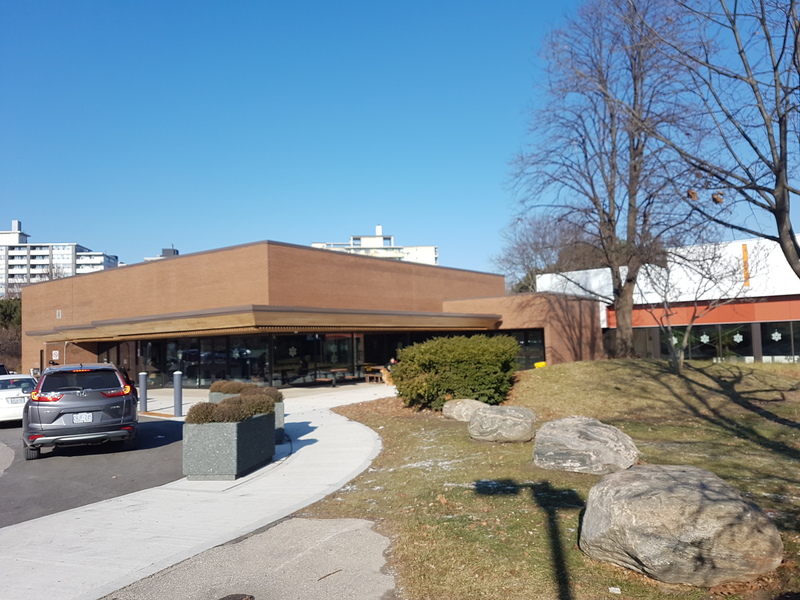 One notable landmark near Birchmount Road is not a rest stop but Scarborough Arts. 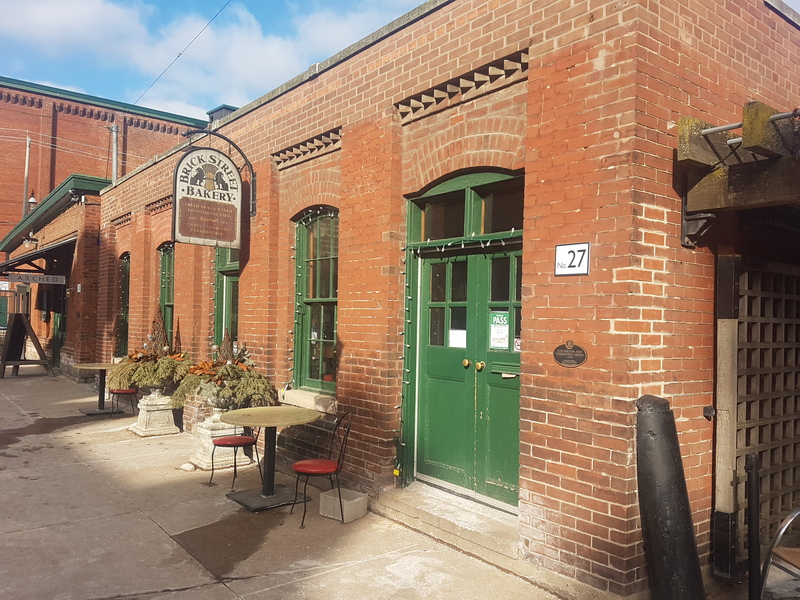 The non-for-profit arts organization has a mandate “to create and cultivate innovative arts and cultural programs in Scarborough.” It’s a good one. 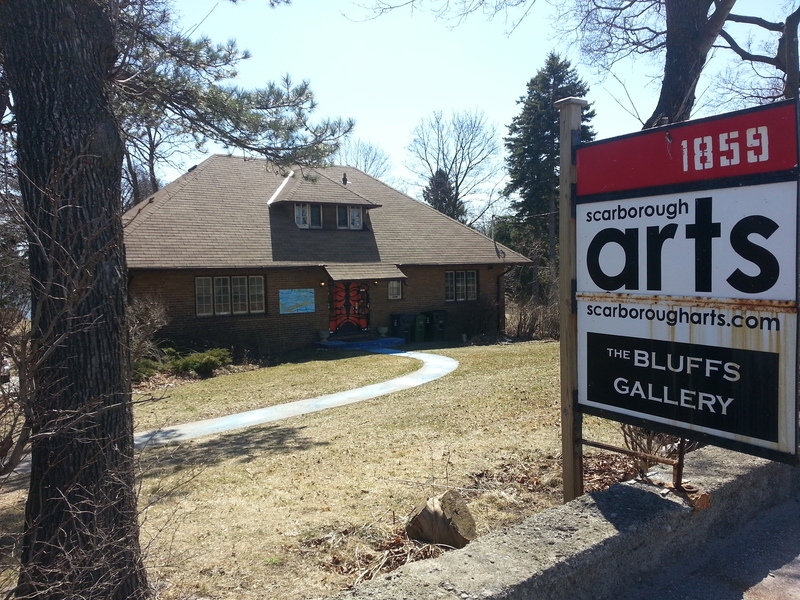 In addition to facilitating and promoting artistic programs, Scarborough Arts also has rotating exhibition space, appropriately named the Bluffs Gallery. 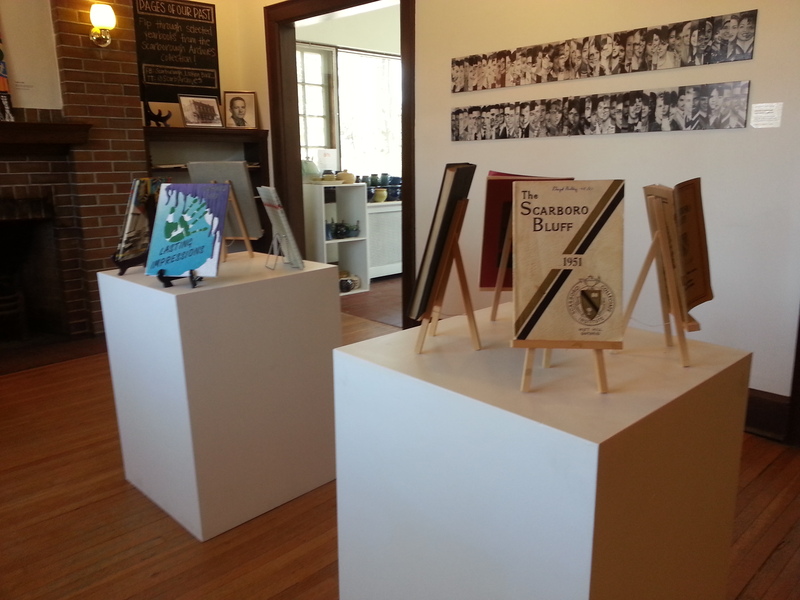 In March 2016, its showcase was ‘YEARBOOK’, a brilliantly-conceived and -executed exhibit which utilized high school yearbooks to tell Scarborough’s history and its remarkable demographic change in particular. It’s not a surprising discovery, but Scarborough didn’t begin to really diversify until around the 1980s. 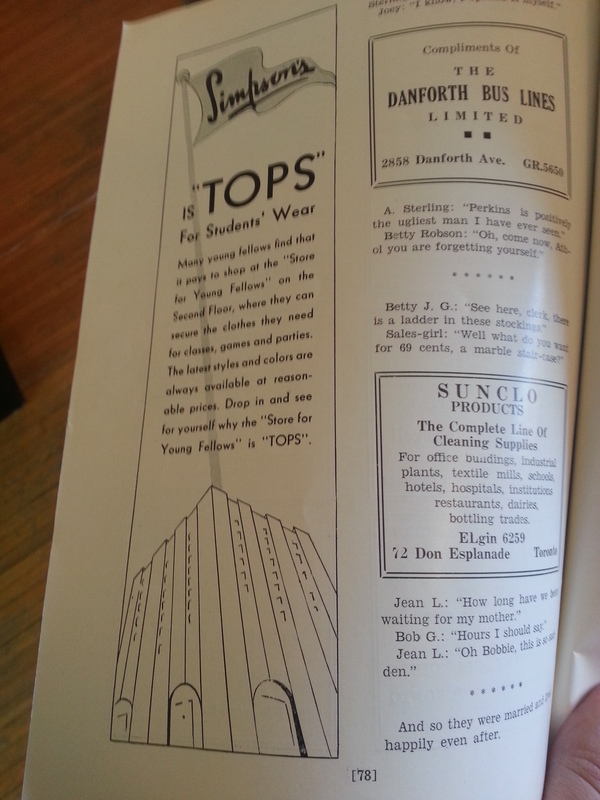 In addition to offering demographic snapshots, I enjoyed the cultural tidbits that could be gleaned from the yearbooks, such as what kind of school clubs existed and the advertisements of local businesses of the day. 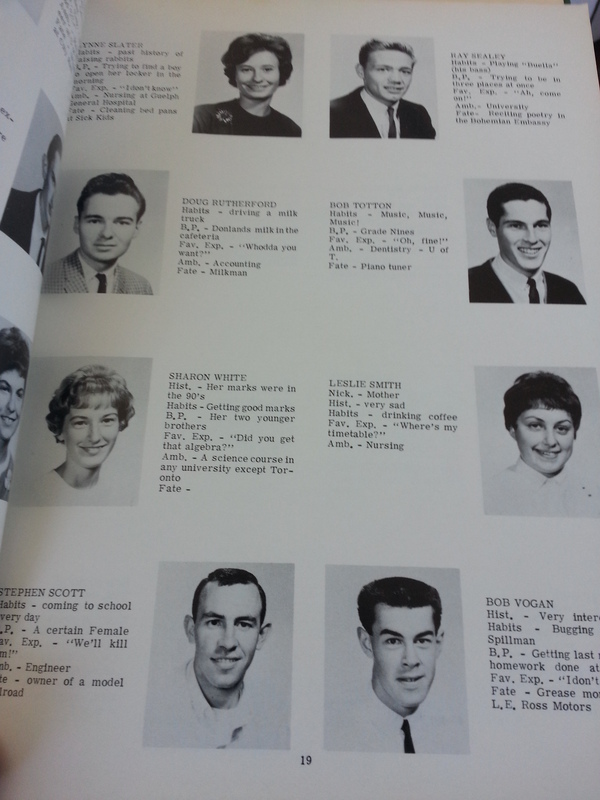 Agincourt Collegiate Institute yearbook, 1964. I attended and graduated from the school some 50 years later. 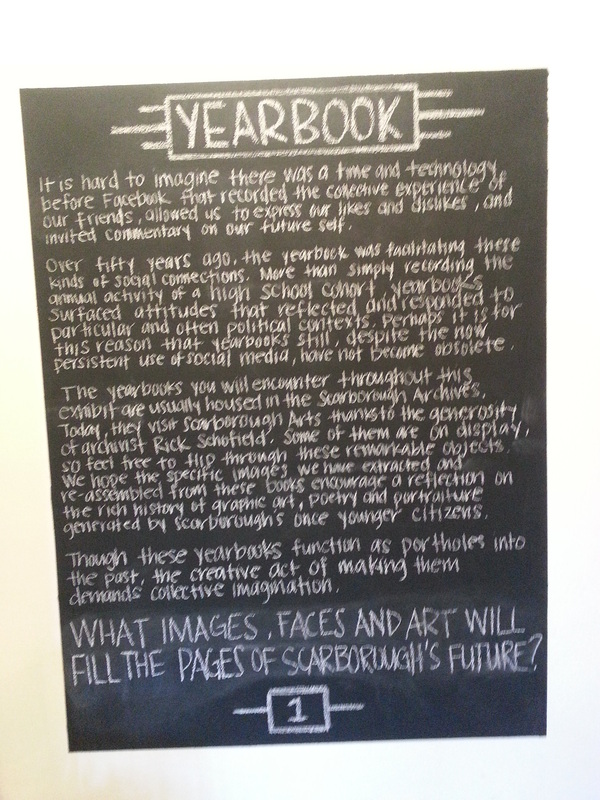 The Scarborough Arts office is a little unconventional in that it is housed in a converted 1920s dwelling. Its ‘backyard’ is the Harrison Properties, which makes up part of the Waterfront Trail and whose name strikes me as having some sort of history perhaps relating to a previous owner of the lot. I’ve found nothing on the topic, however. 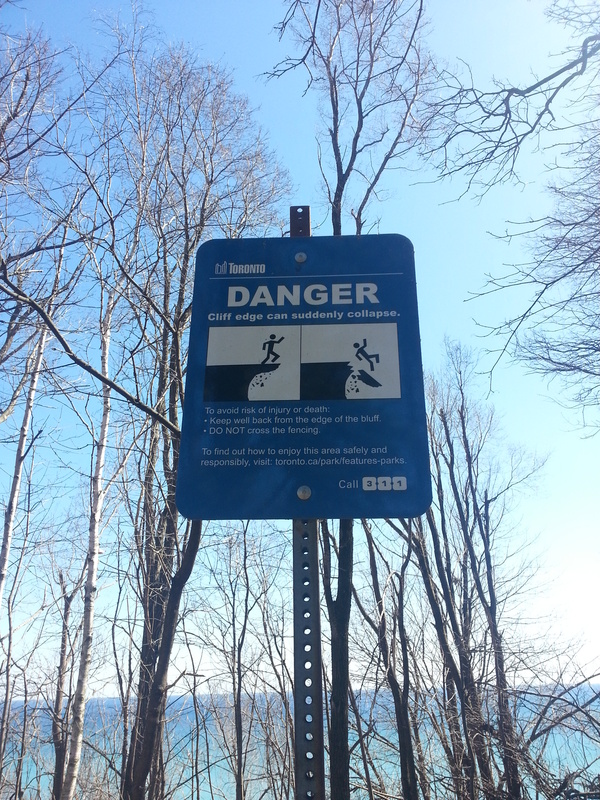 The park backs onto the Bluffs, although a fence and a warning blocks access to the ridge for safety reasons. More on that later. 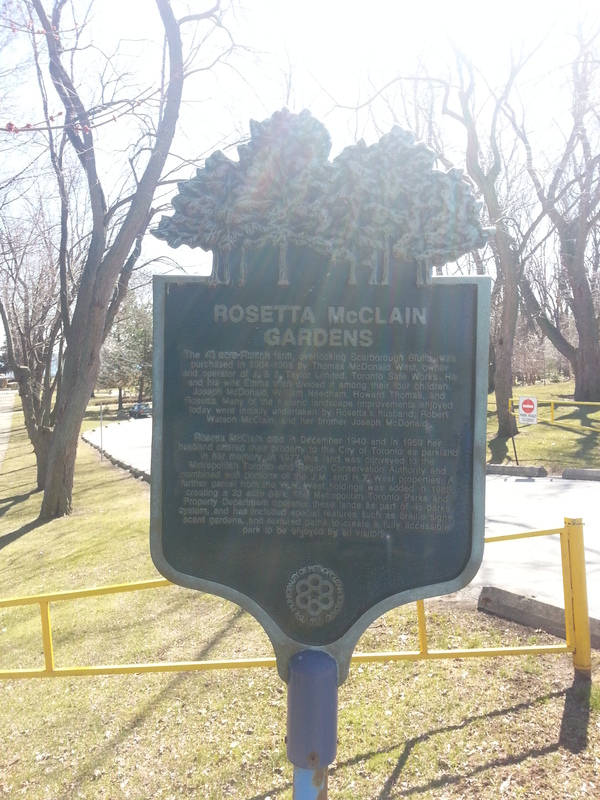 Further up Kingston is the Rosetta McClain Gardens. The backstory of this gem is fortunately known and offered up in a couple of plaques. 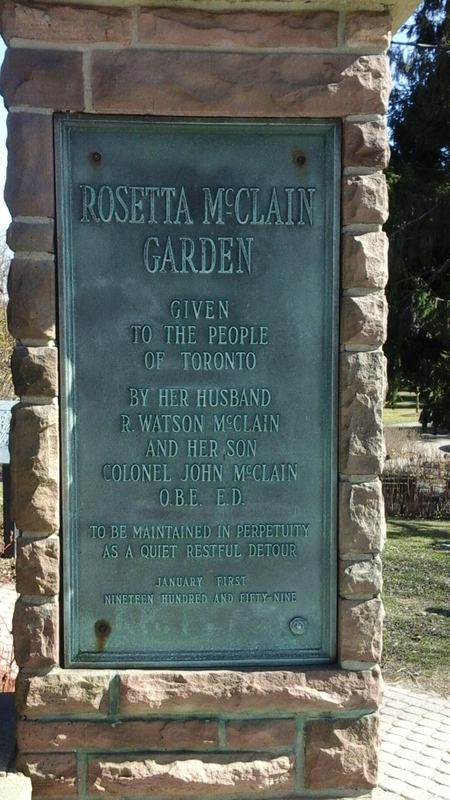 Rosetta McClain once owned this land, and upon her death, her husband and son gifted the lot to the City of Toronto for a public park. Interesting to me in the story is McClain’s father was in charge of the J & J Taylor Safe Works operation in Old Town. 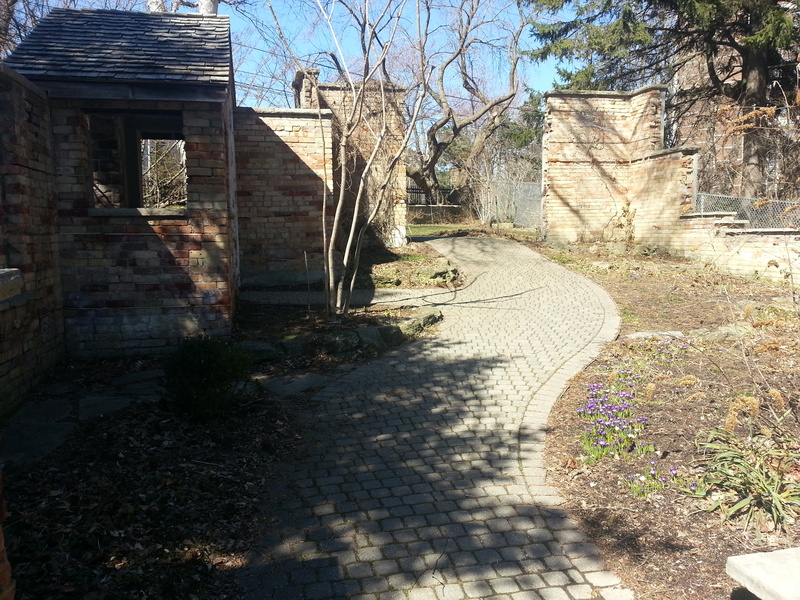 The gardens are naturally a better a sight in the summer, but even in spr-winter the awe of the space is evident. The frame of the old McClain house also still stands in the park as a monument…and as a backdrop for wedding shoots. 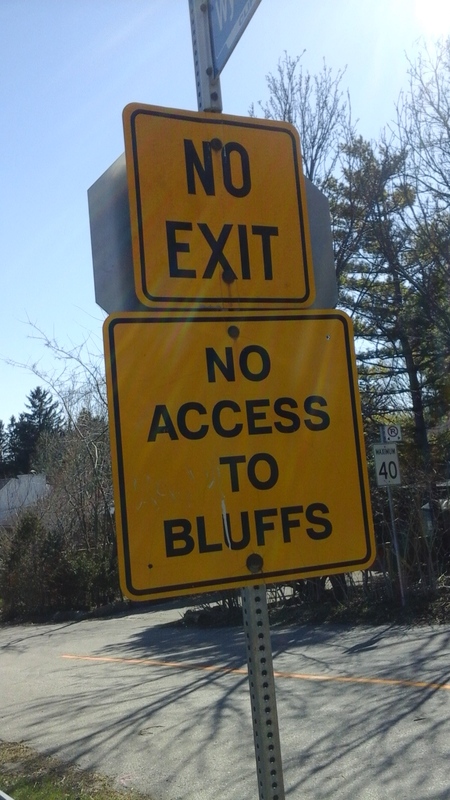 Access to the Bluffs themselves can be tricky and elusive. There are many’a sign on local streets south of Kingston which advise people to, well, go away. It reminds me of the ire of local Hollywood residents concerning tourists trying to get to the Hollywood sign. 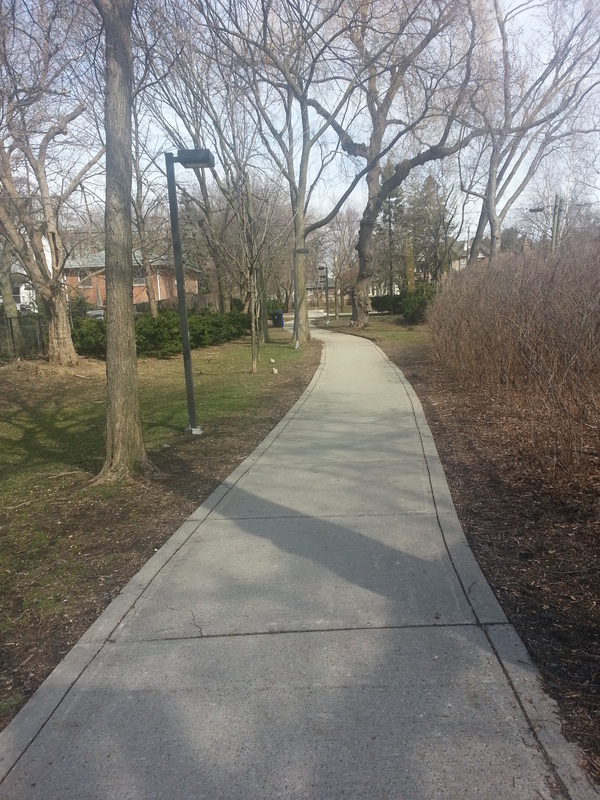 Fortunately, there is a path beside Wynnview which leads down to Scarborough Heights Park. The bottom of the steep trail delivers a great view. 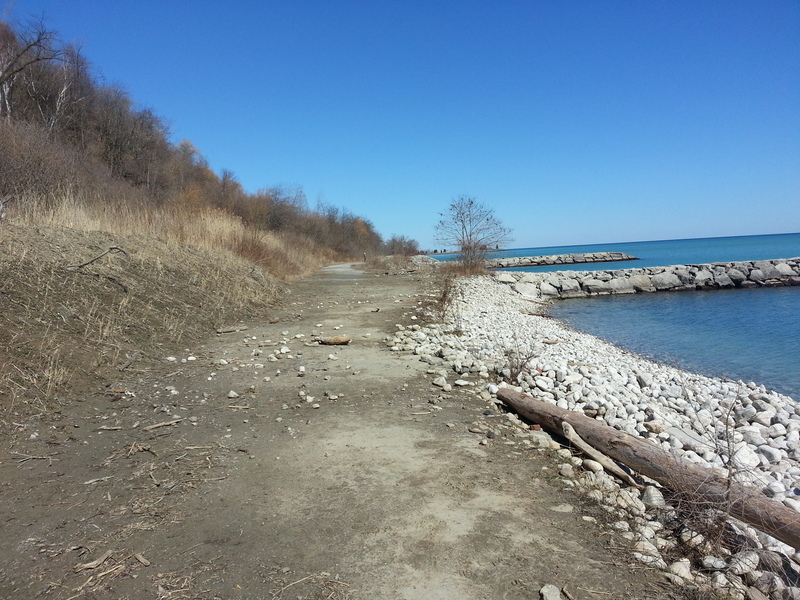 The eye can follow the curve of the Scarborough coast as seen in maps as well the endless blue expanse of Lake Ontario. This is easier going down than up. Scarborough Heights Park, 1911. Source: City of Toronto Archives. The way is long and muddy (and marked with bricks), but the reward at the end is worth-while. 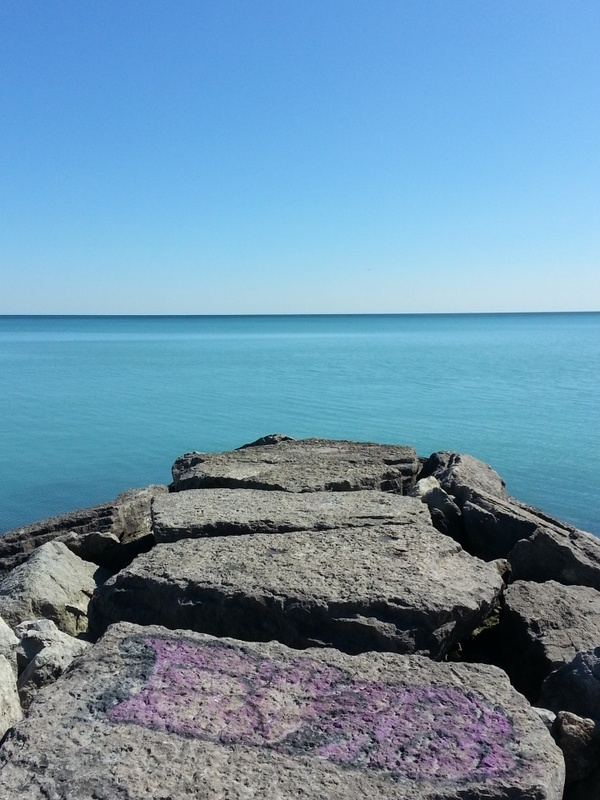 These natural wonders are the leftovers of Glacial Lake Iroquois, whose geography is apparent throughout the city, most famously along the Davenport escarpment near Casa Loma. 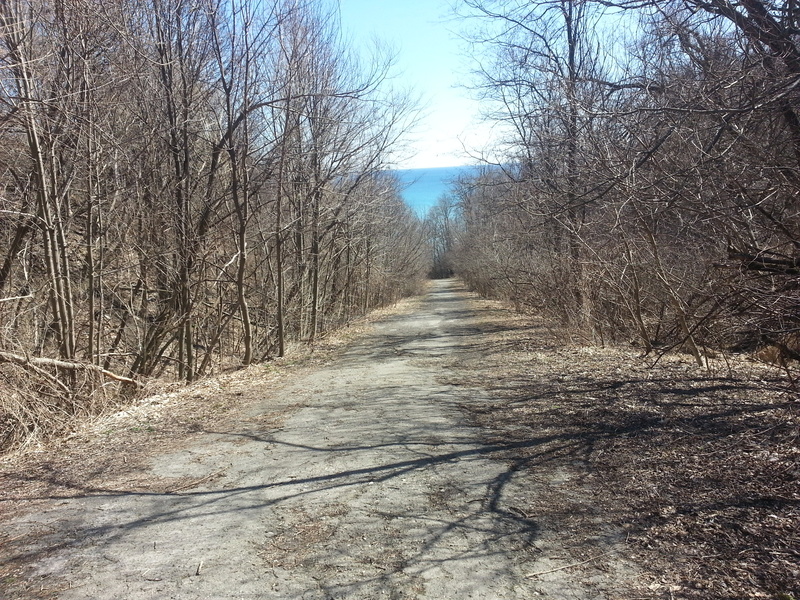 They are the same Bluffs that might exist in unknown narratives of Aboriginal settlement in this part of Scarborough. And they are the natural wonders Elizabeth “Don’t-Call-Me-Lady” Simcoe sailed past in 1793 which reminded her of her English home. Of course, the elements and human activity have taken their toll on the Bluffs today, robbing them of stability and their chalky exterior in some places. I might argue their erosion is, though, a good – albeit, unfortunate – marker of time and a reminder of their history and pre-history. 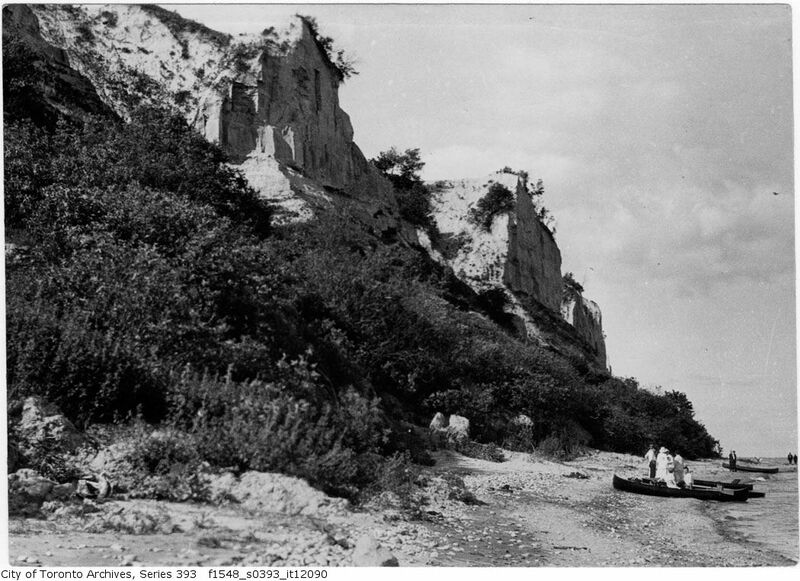 Scarborough Bluffs, 1909. Source: City of Toronto Archives. 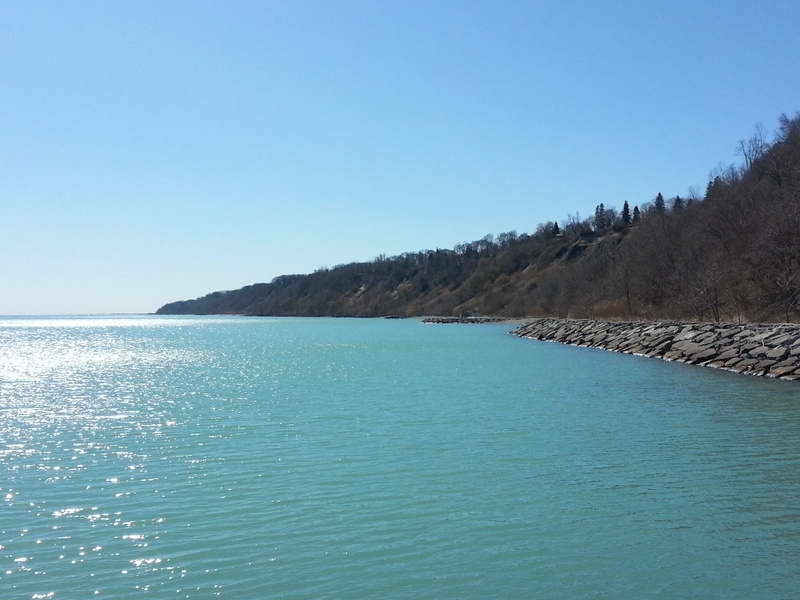 One thing that has remained consistent about the Bluffs is the marvel surrounding them. 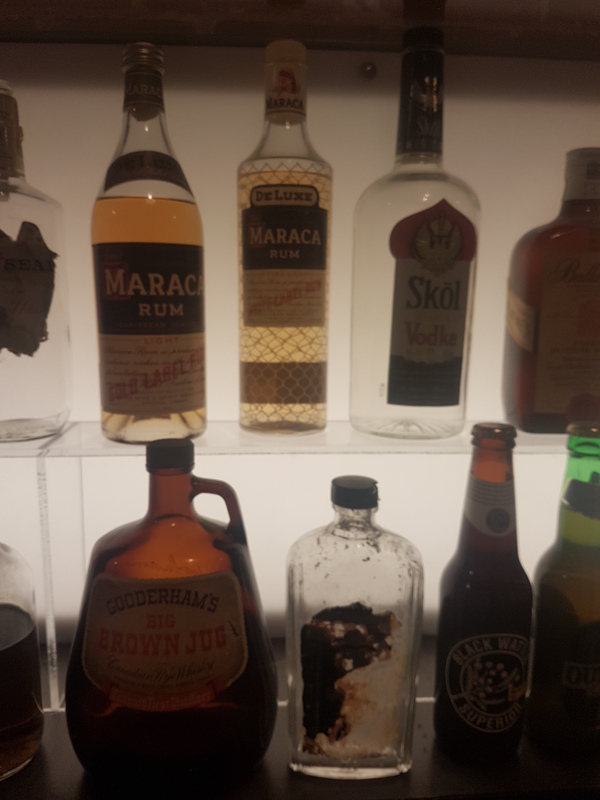 Sometimes it is hard to connect to bygone times and the psyches of people who lived within them, but human feeling and intelligence was no less primitive one hundred years ago than today. The people who explored Scarborough’s coast for an afternoon outing likely thought and felt the same as us when we do the same. That’s a comforting idea. 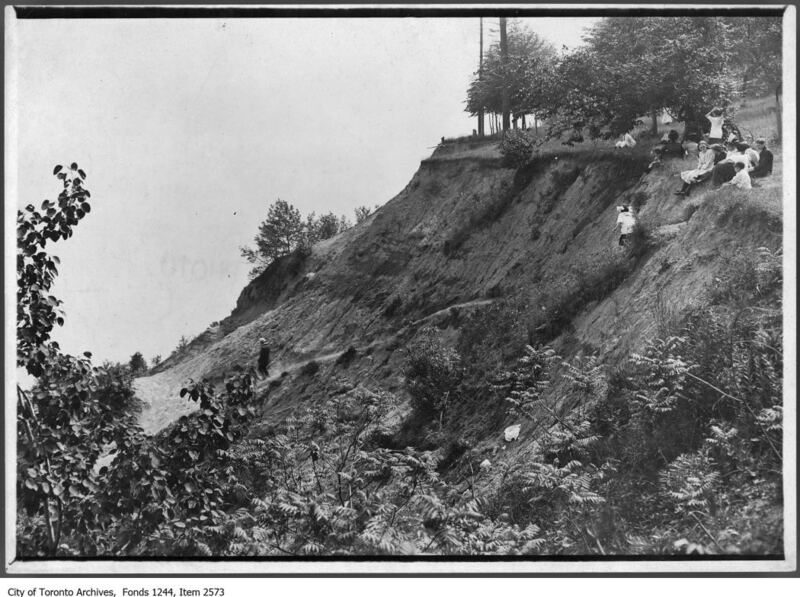 Scarborough Bluffs, 1915. Source: City of Toronto Archives. The Bluffs of course stretch beyond Scarborough Heights for more stunning views, including across the way at Scarborough Bluffs Park. But that’s another day.